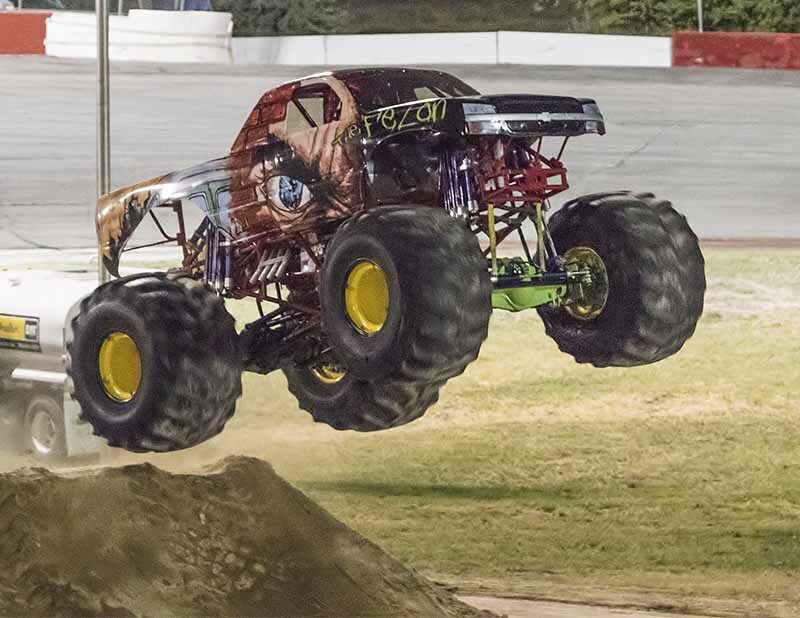 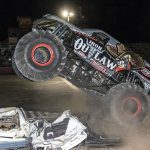 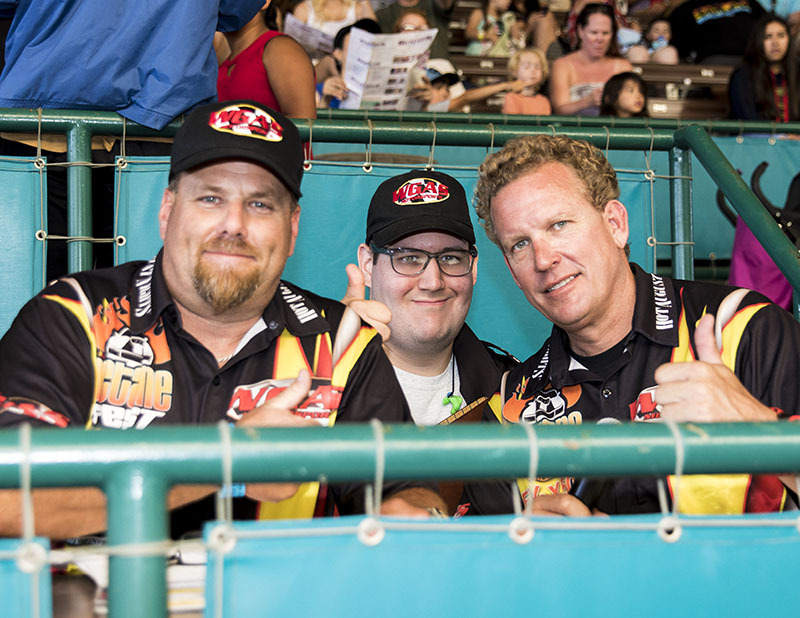 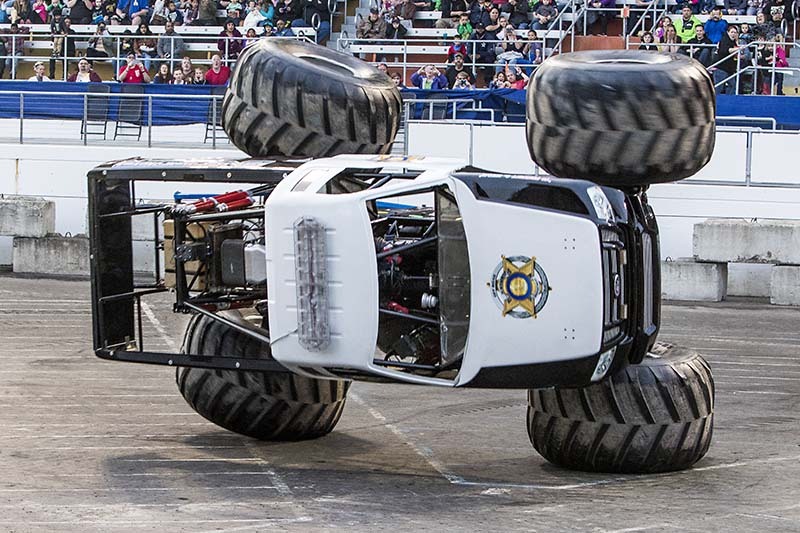 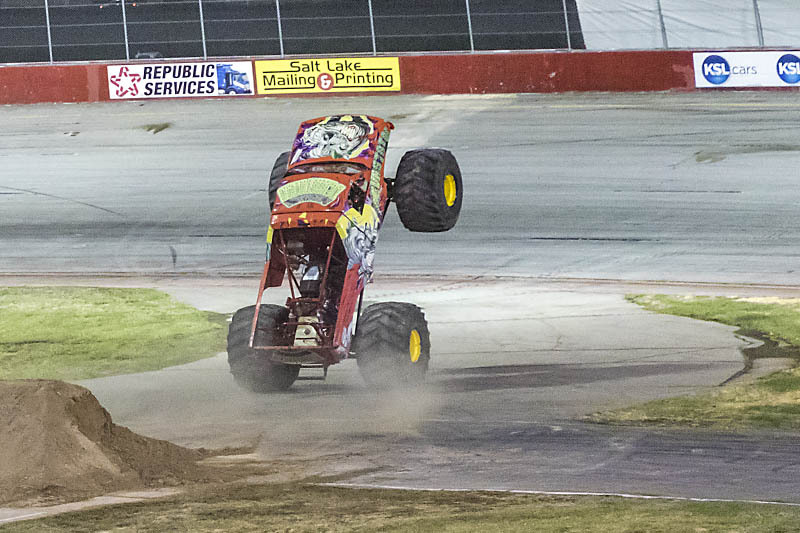 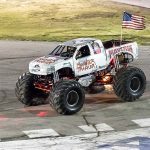 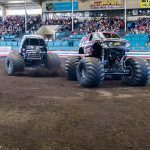 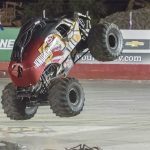 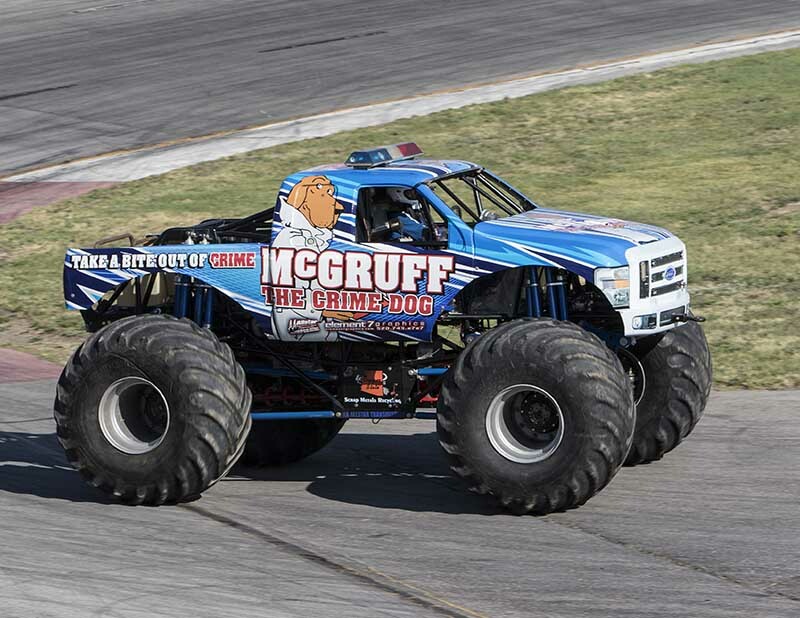 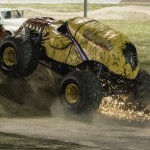 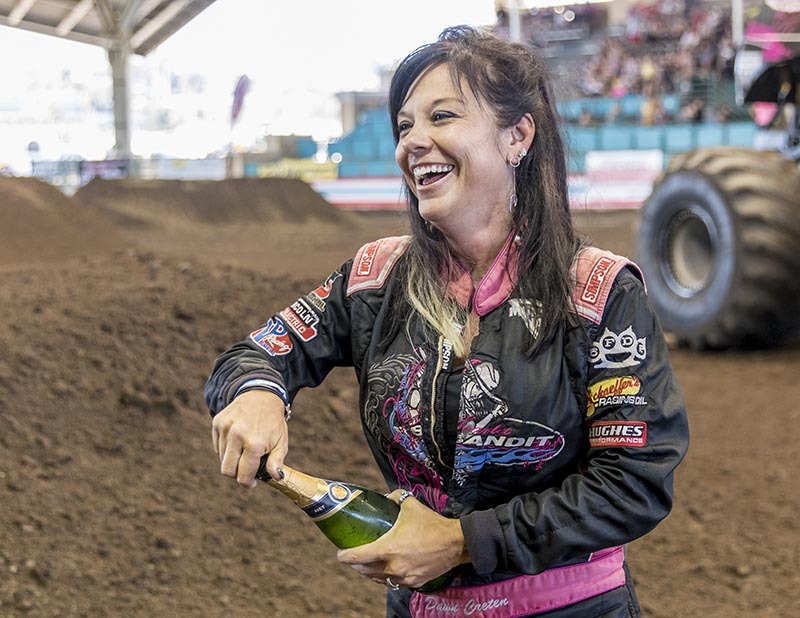 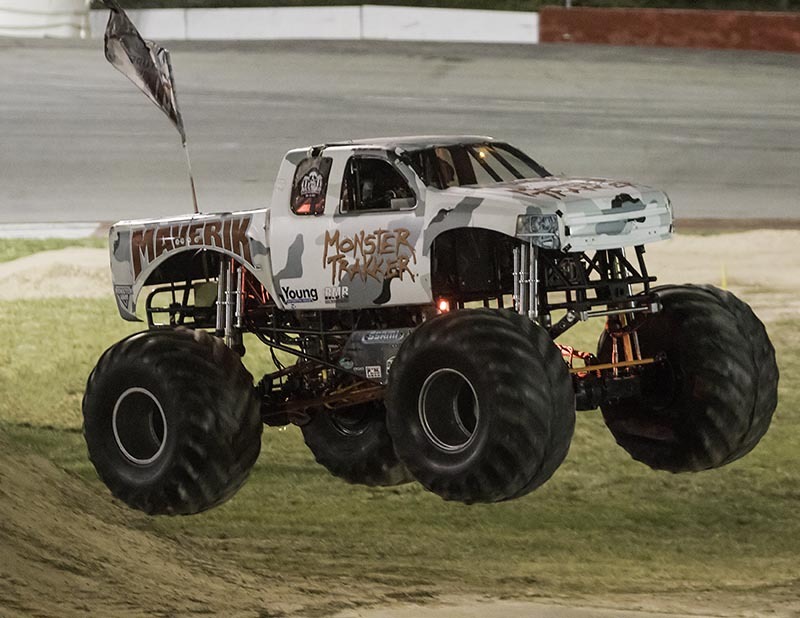 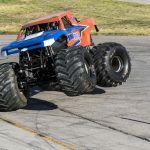 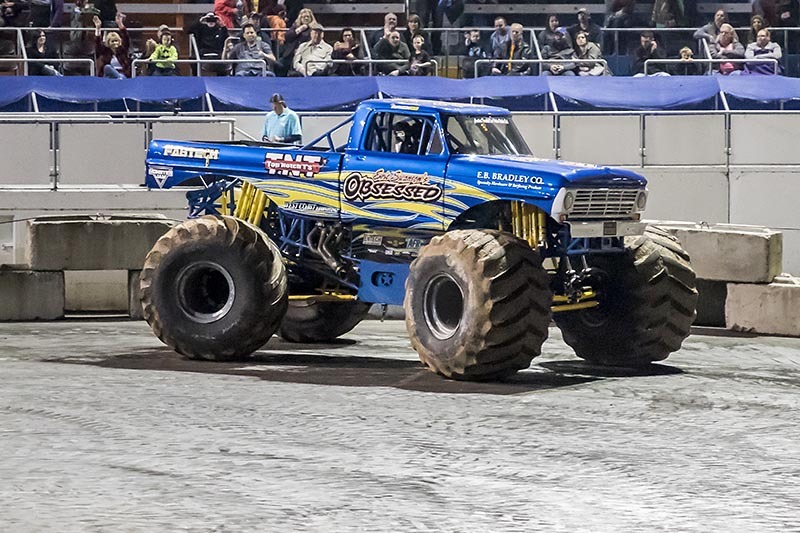 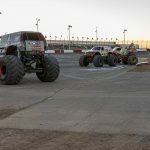 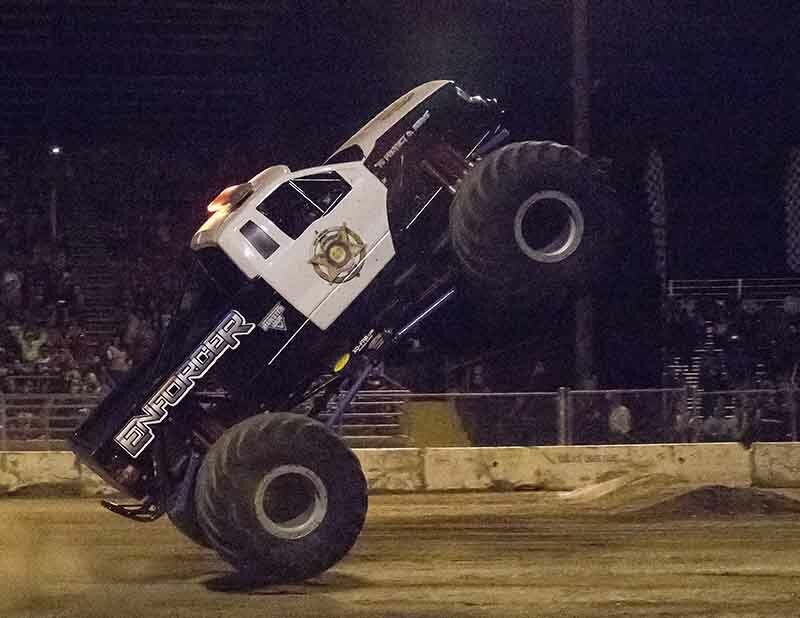 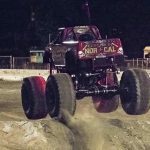 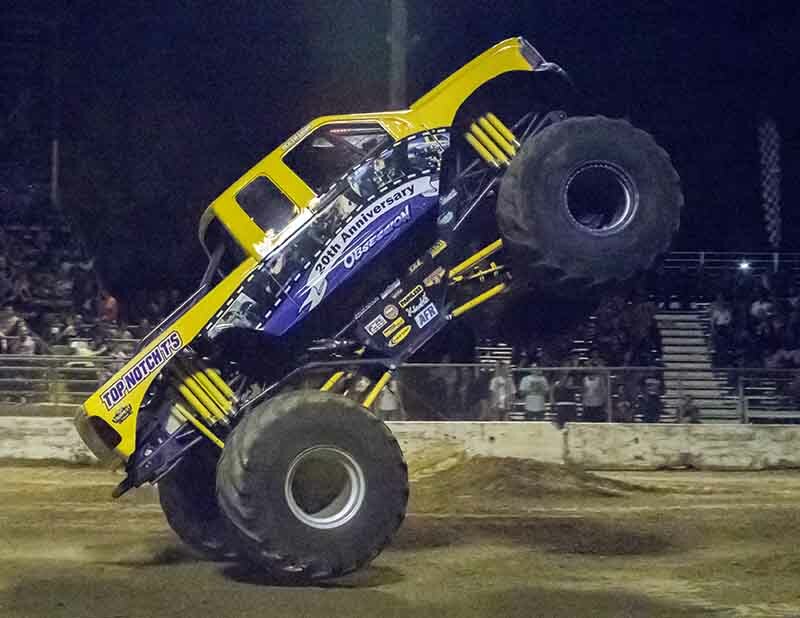 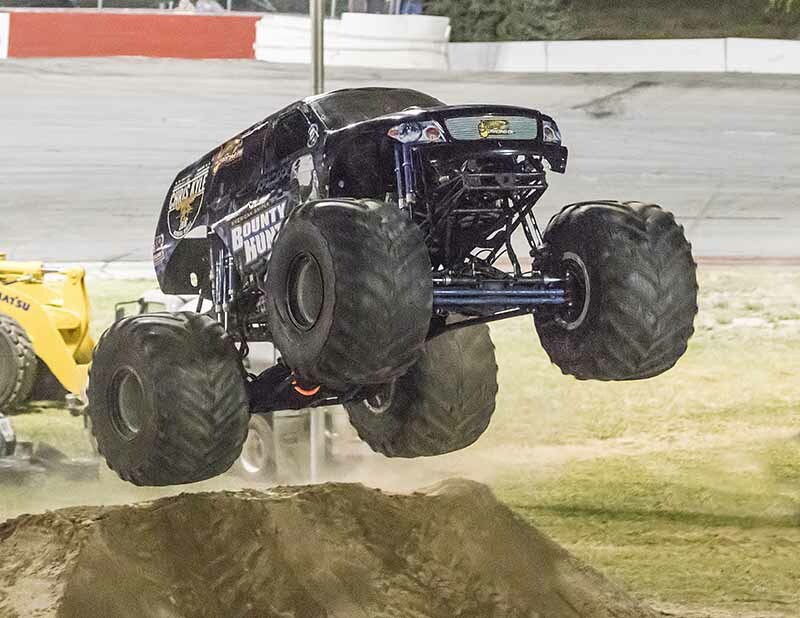 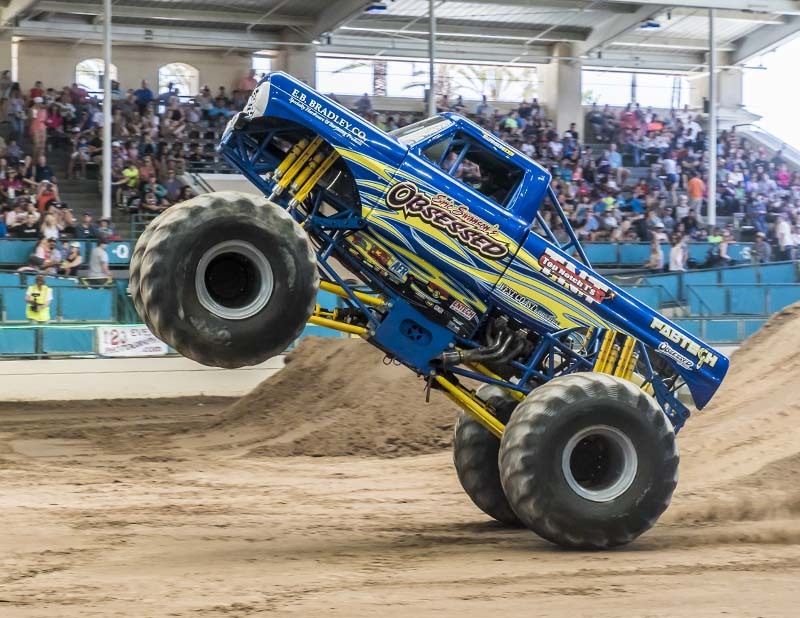 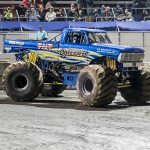 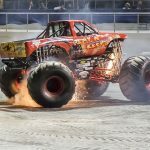 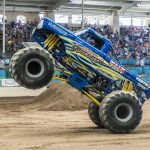 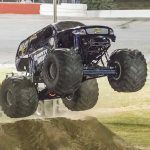 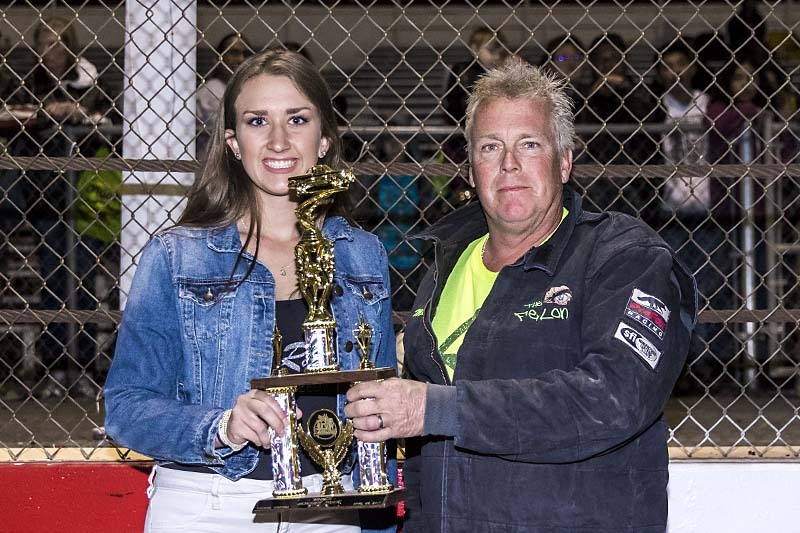 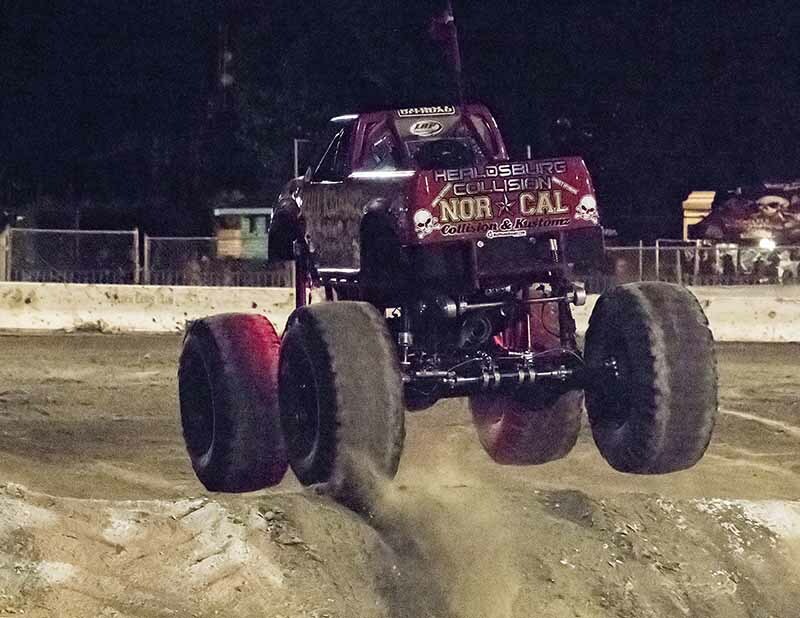 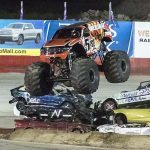 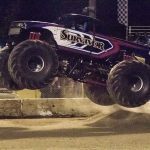 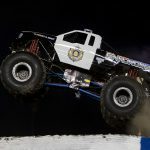 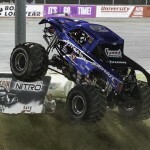 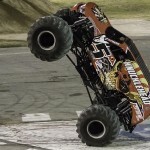 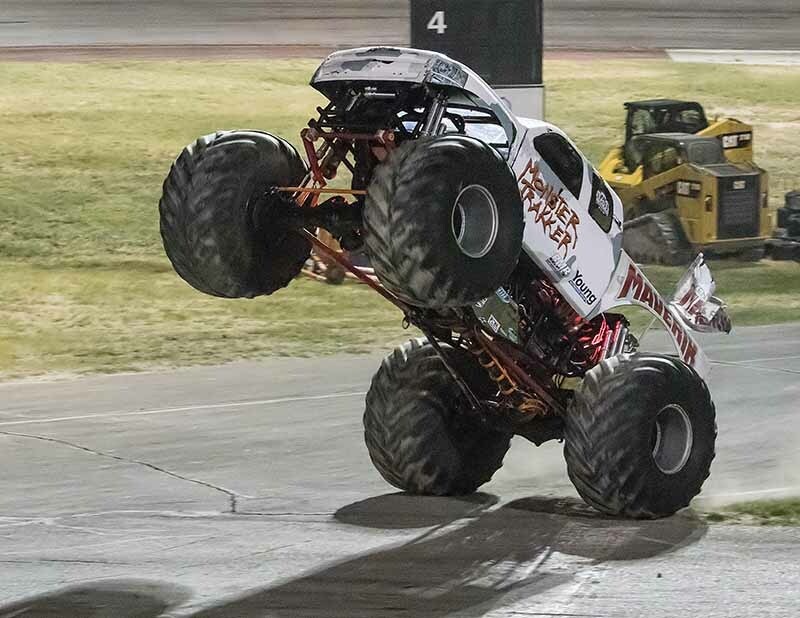 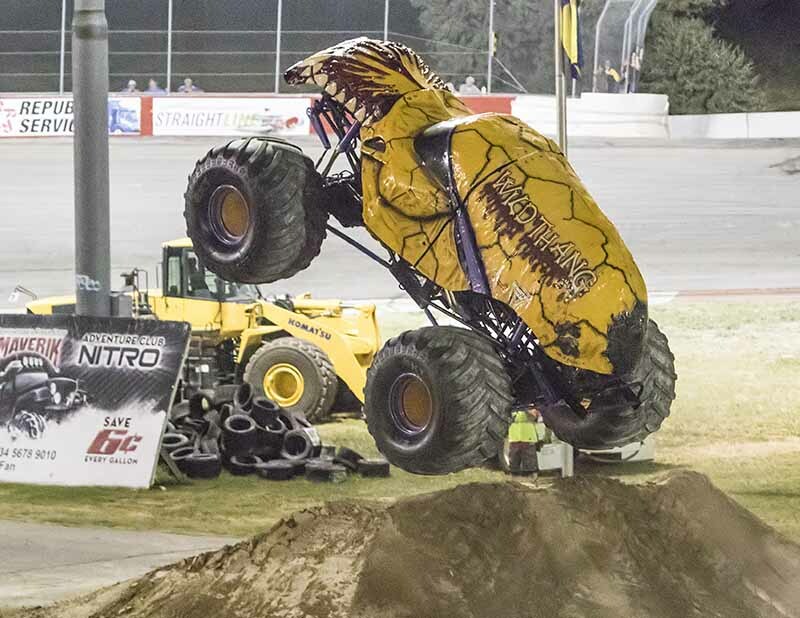 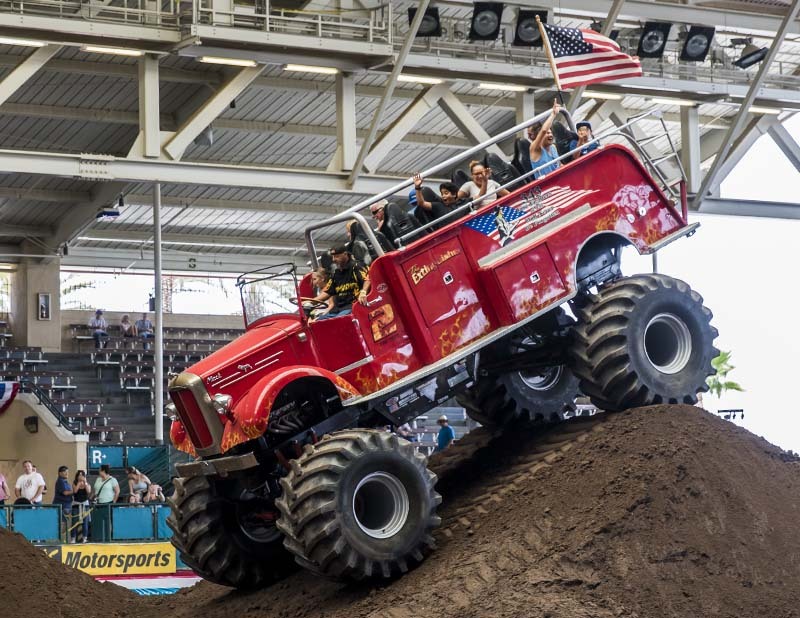 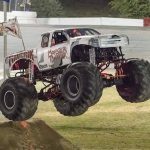 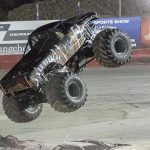 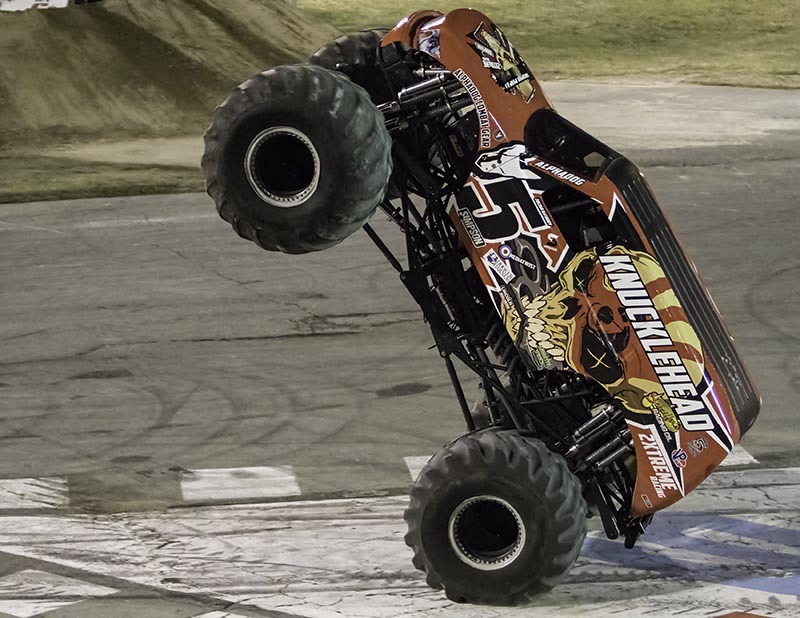 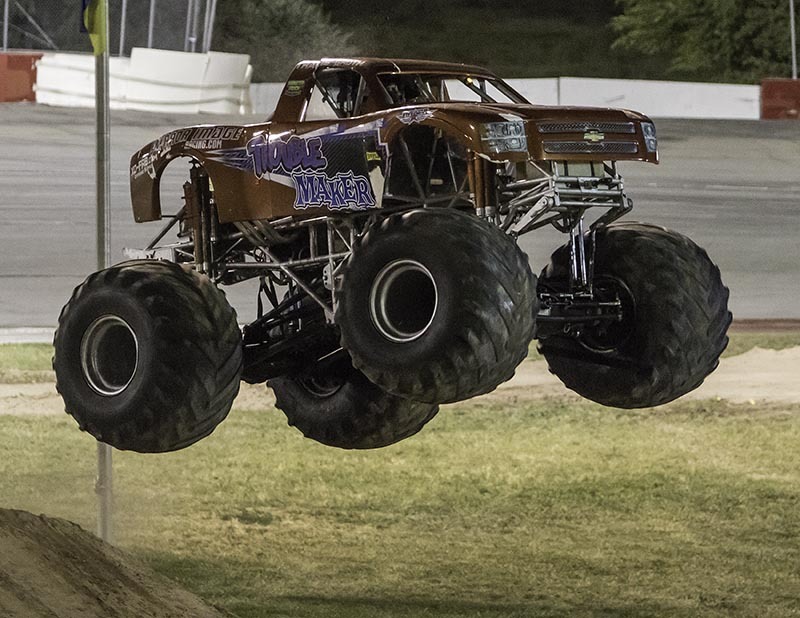 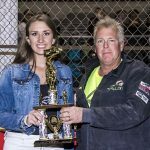 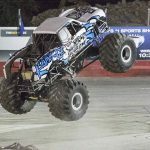 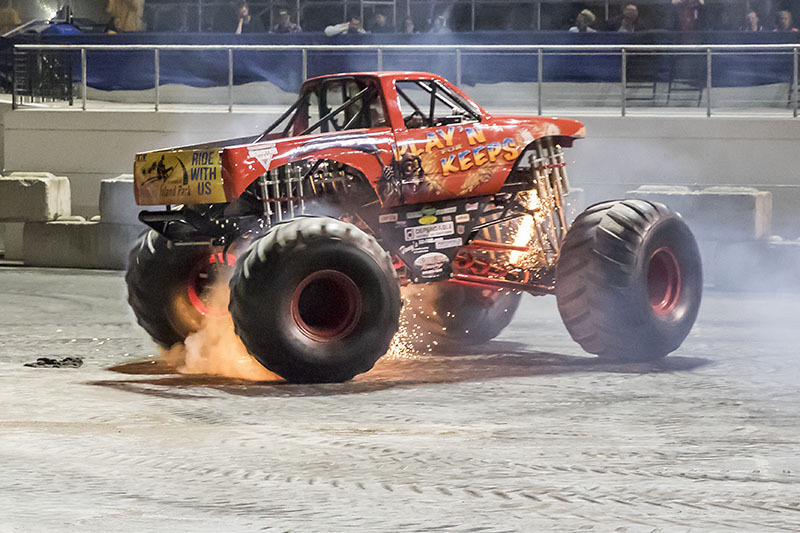 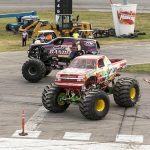 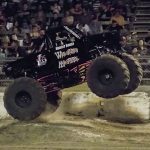 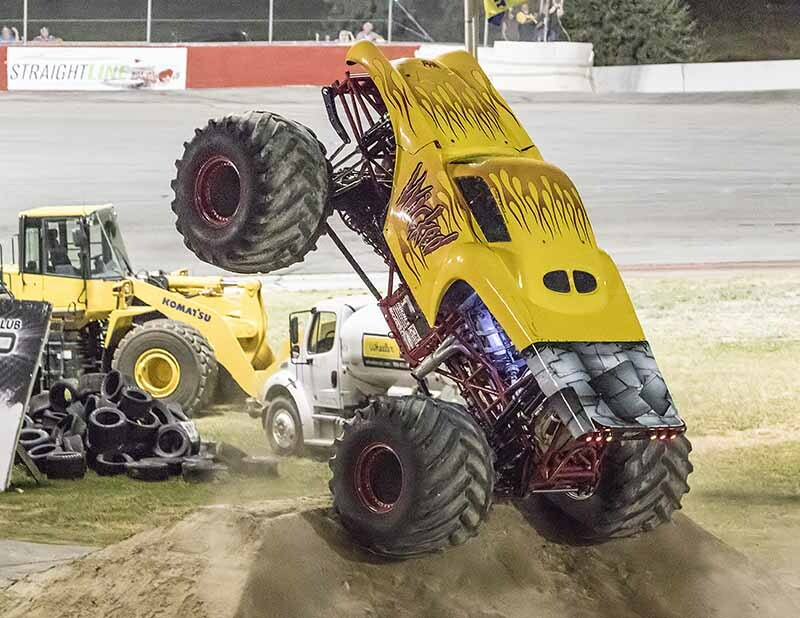 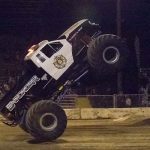 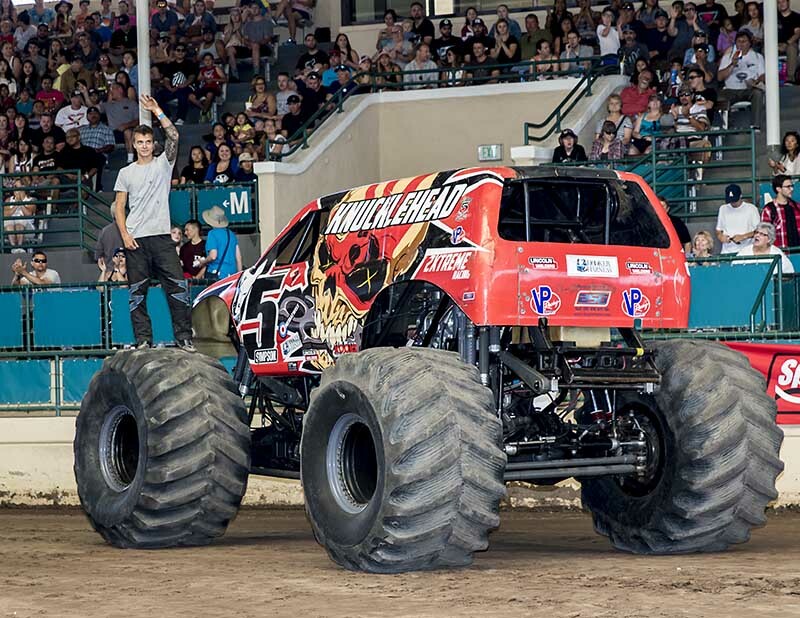 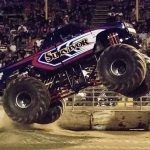 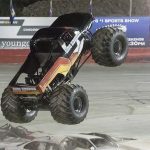 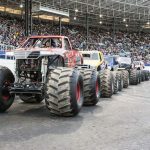 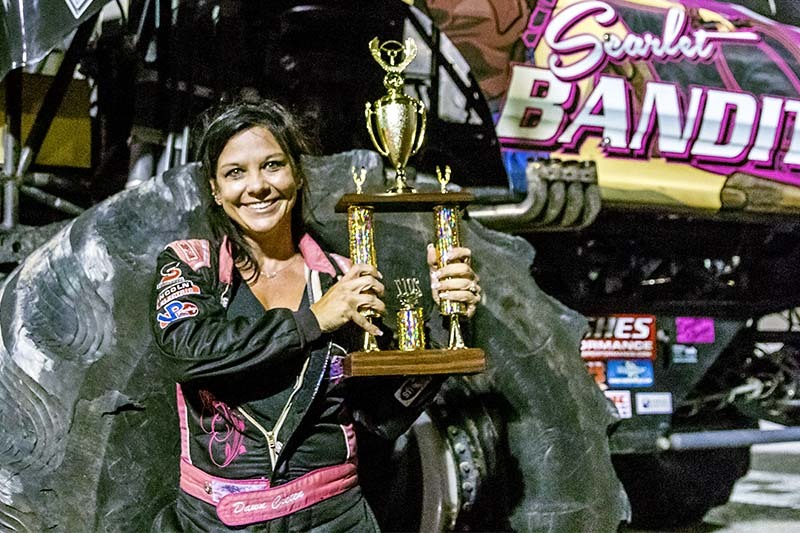 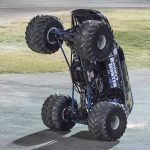 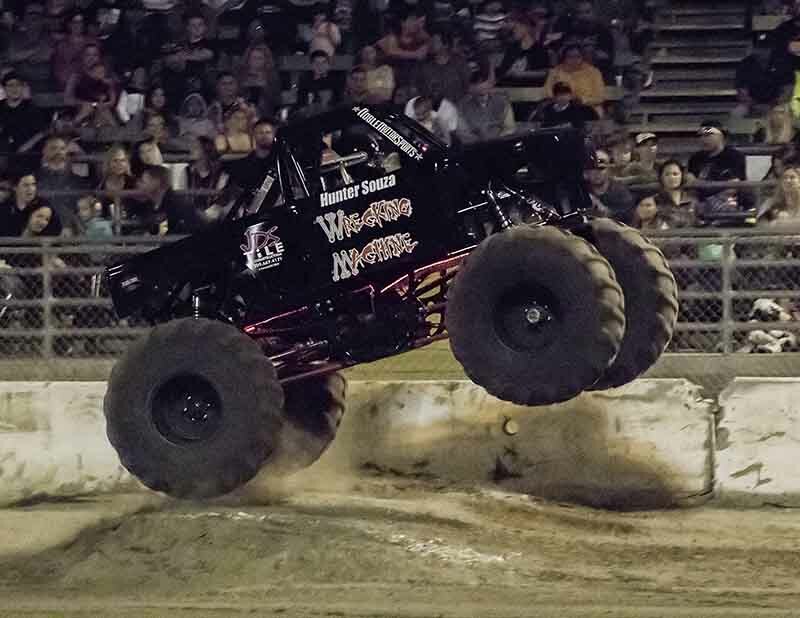 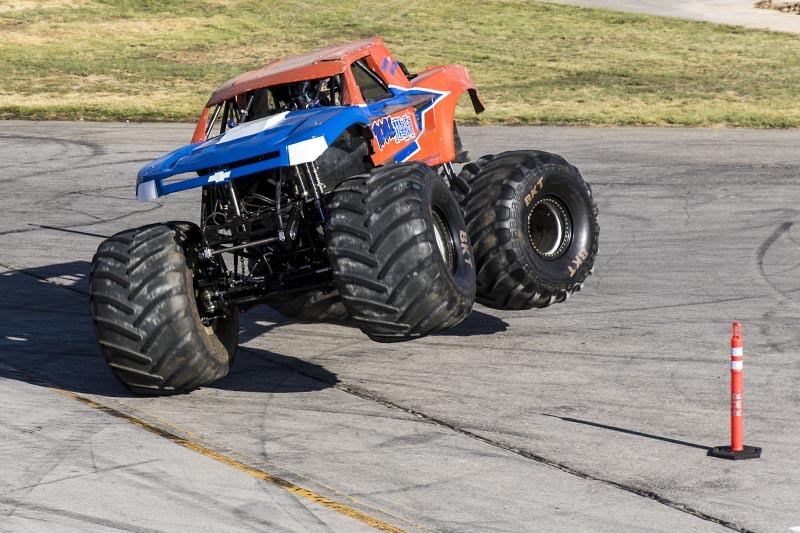 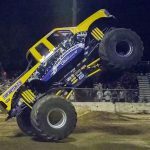 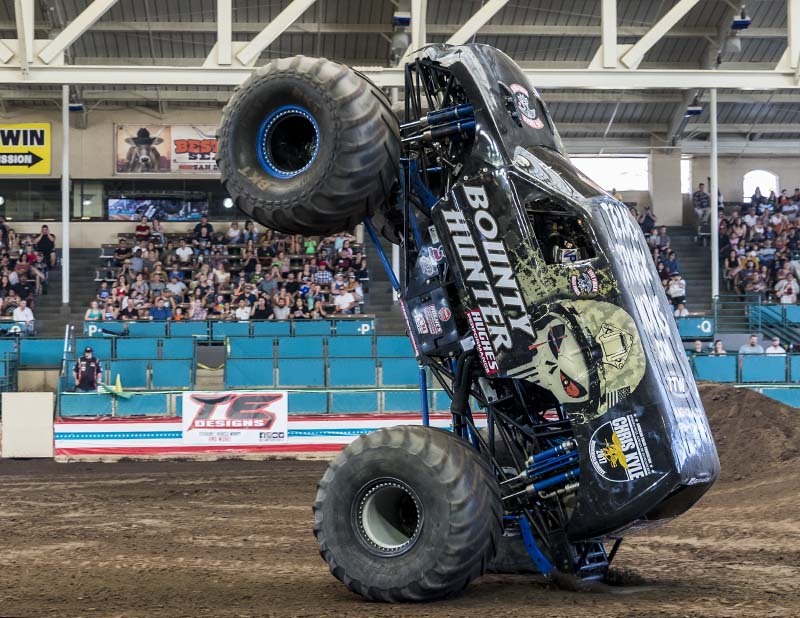 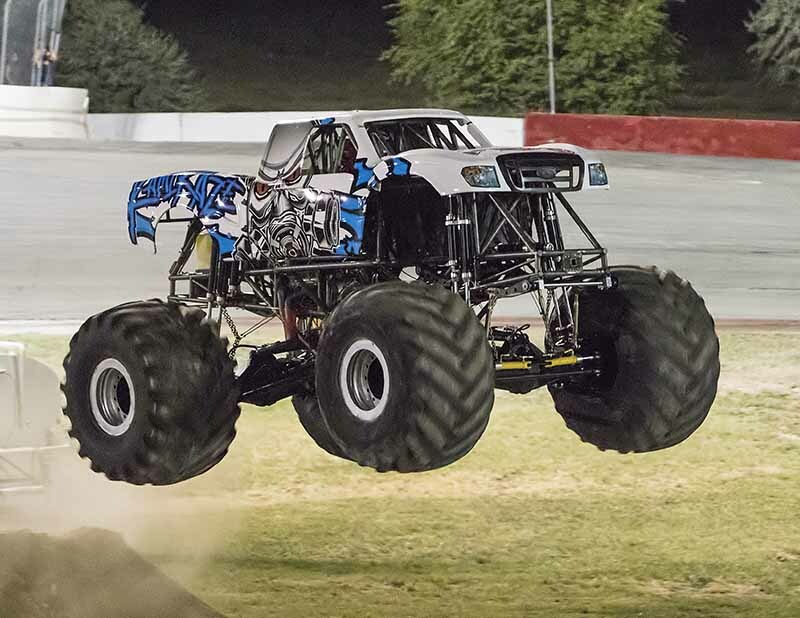 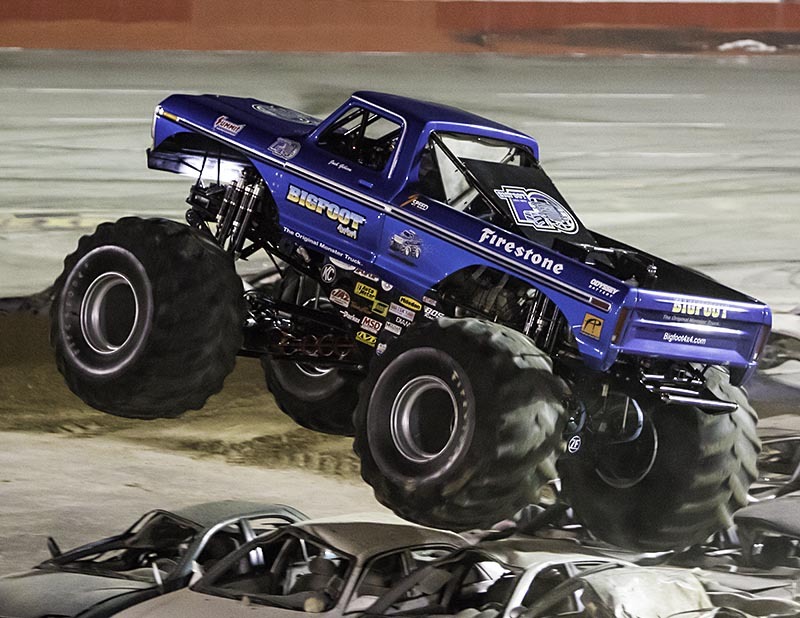 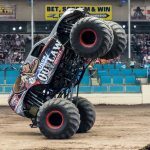 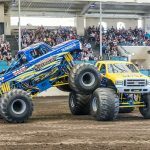 “The Allen Report” is back and we return to the Stanislaus County Fairgrounds in Turlock, California, this time in the month of May for the popular Budweiser Monster Truck Spring Nationals. 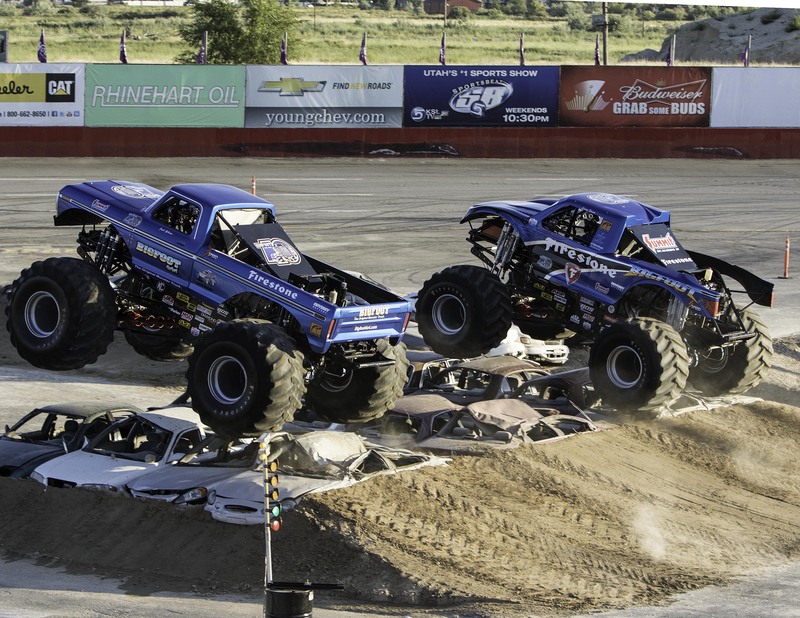 Turlock is a relaxed, peaceful town where the biggest disturbance is normally the frequent freight train. 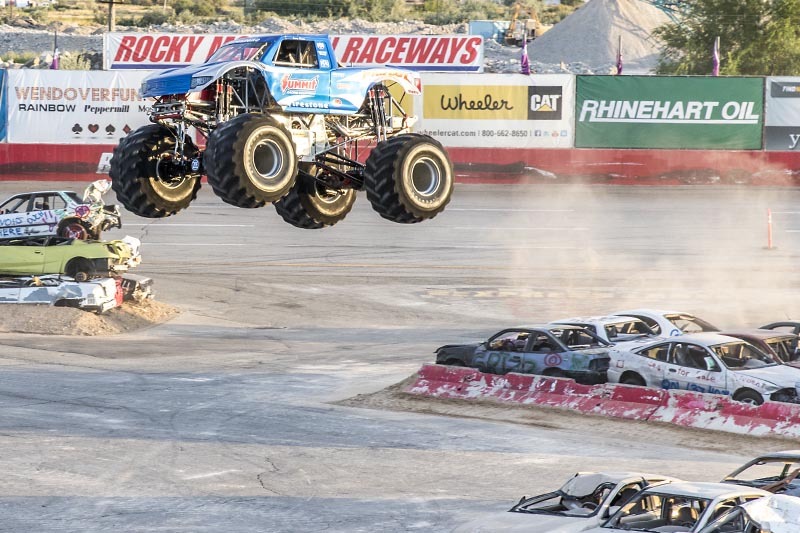 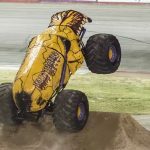 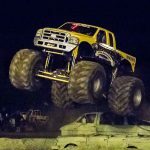 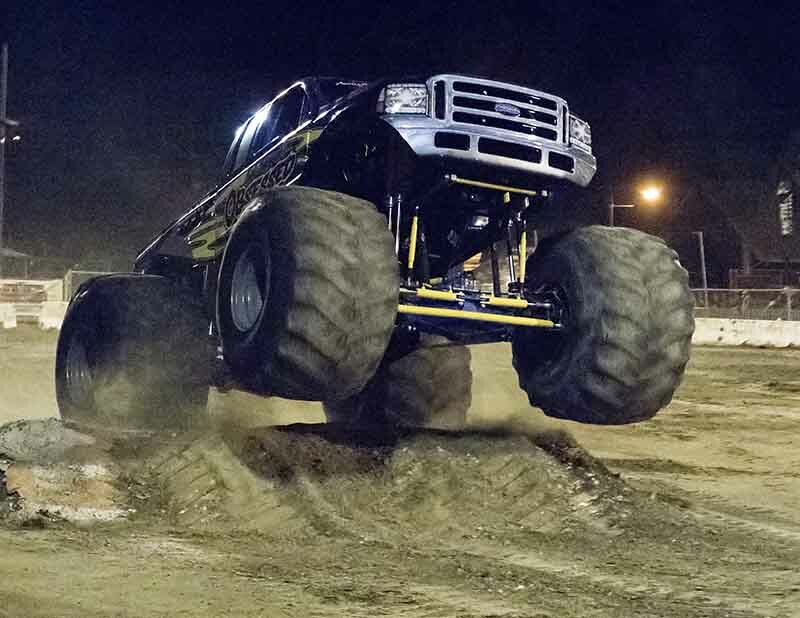 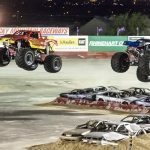 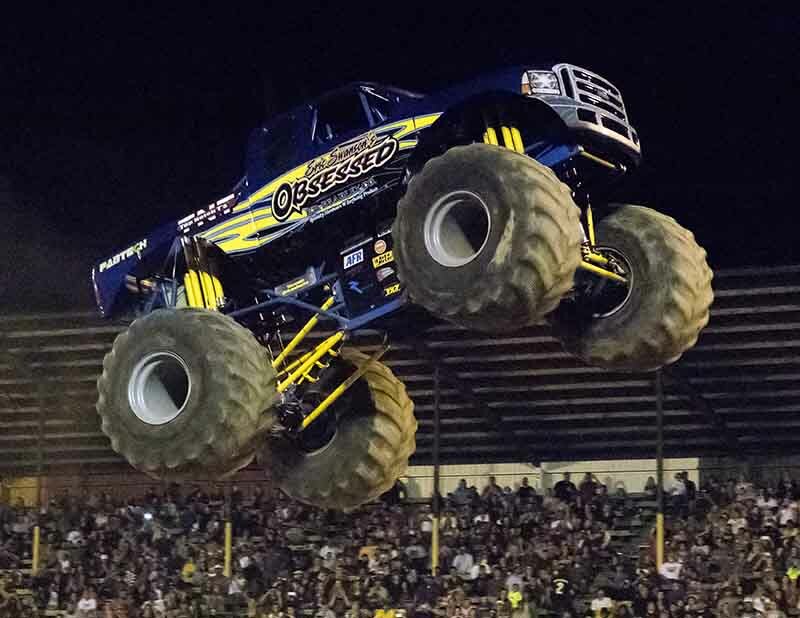 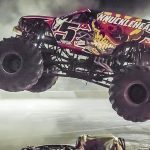 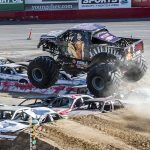 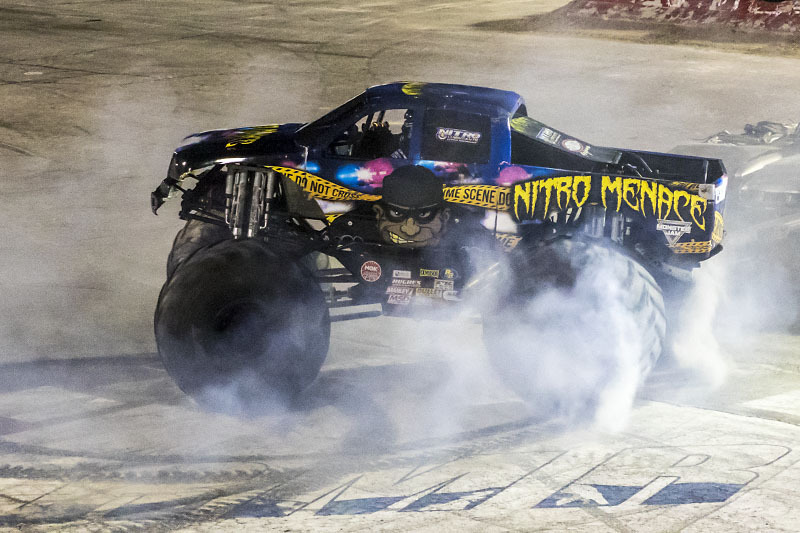 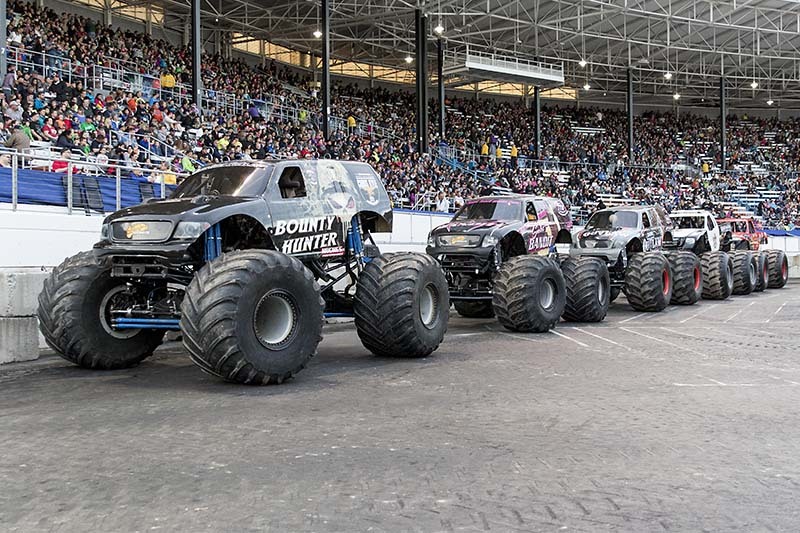 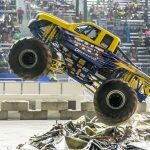 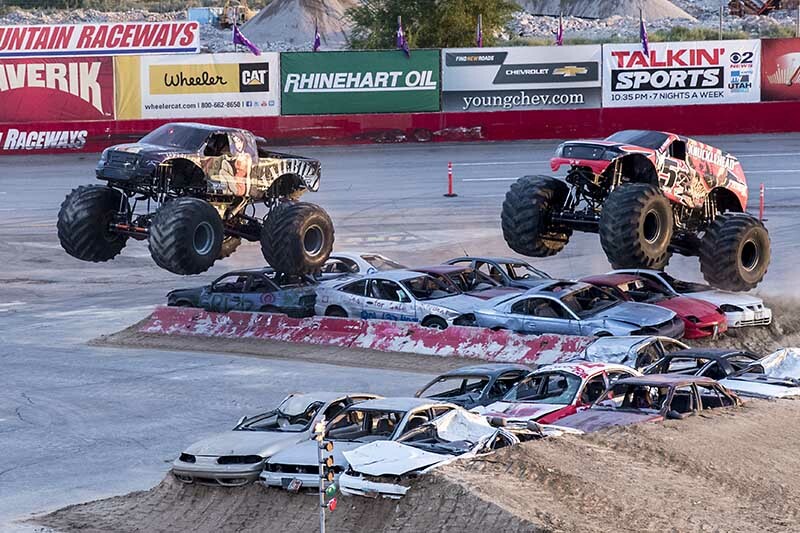 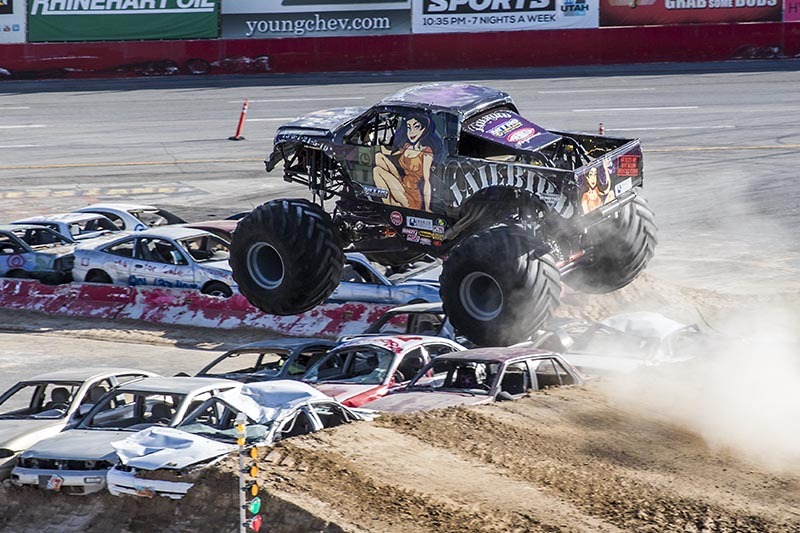 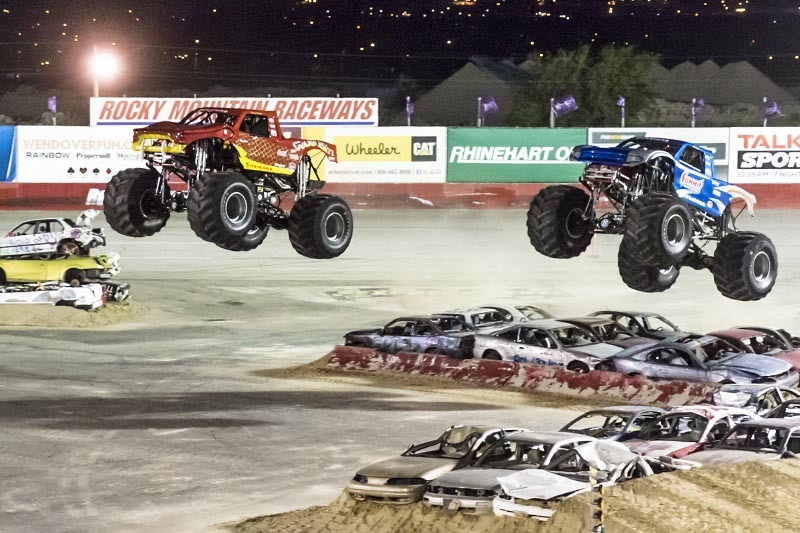 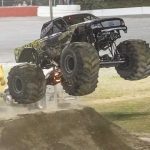 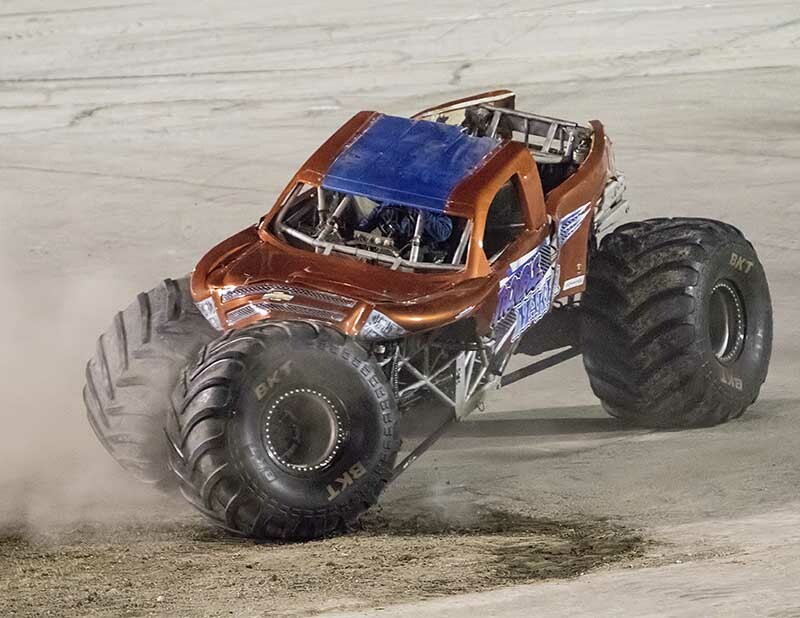 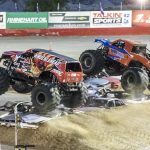 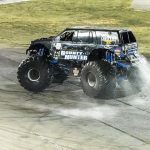 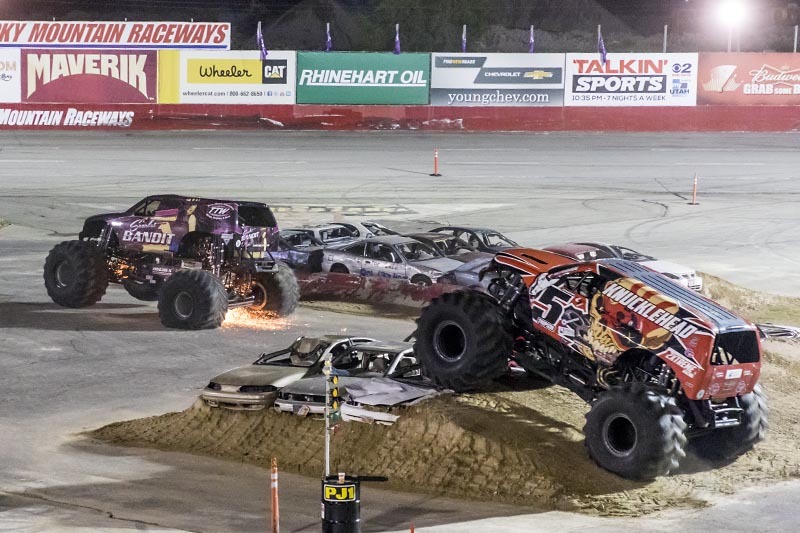 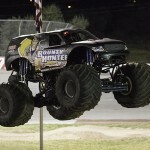 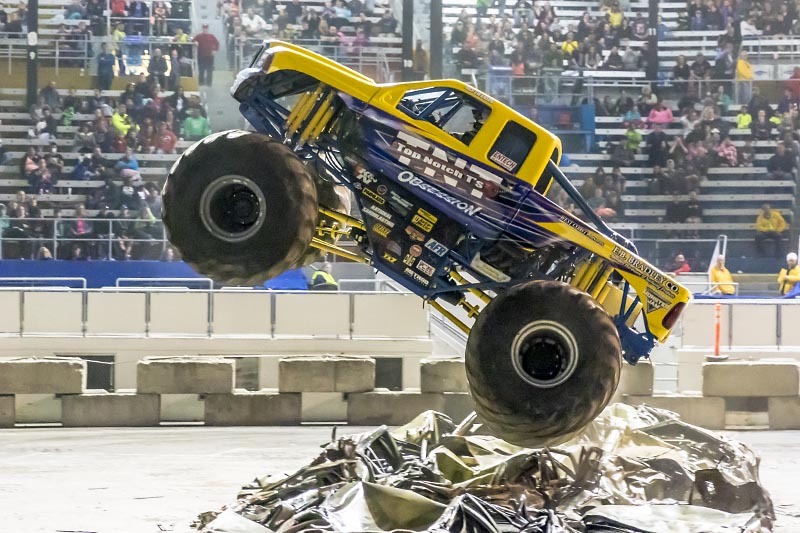 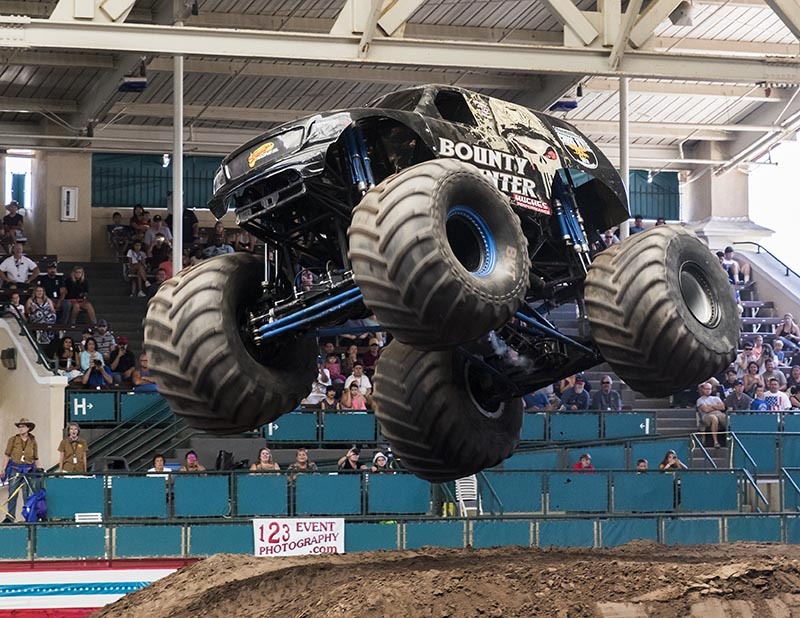 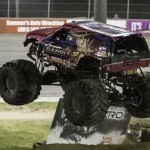 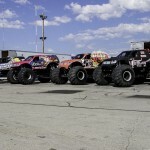 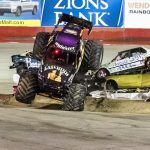 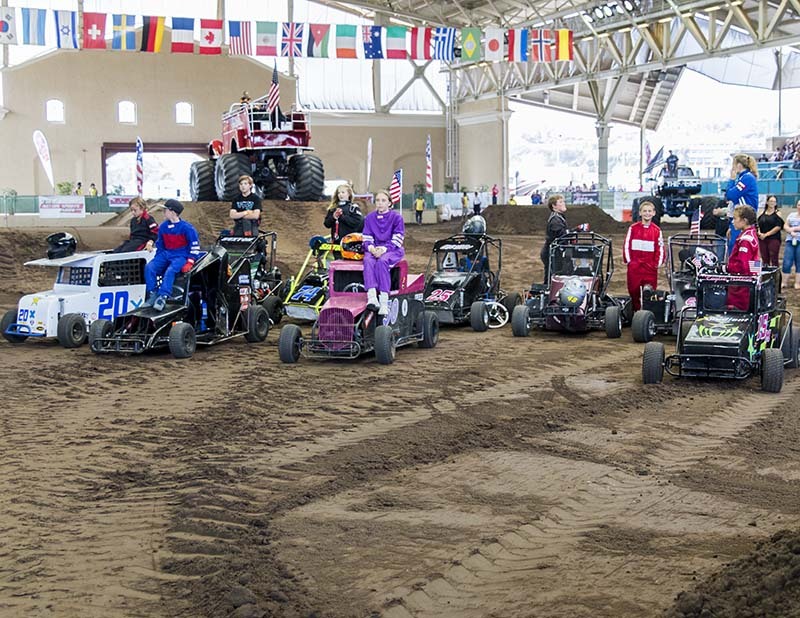 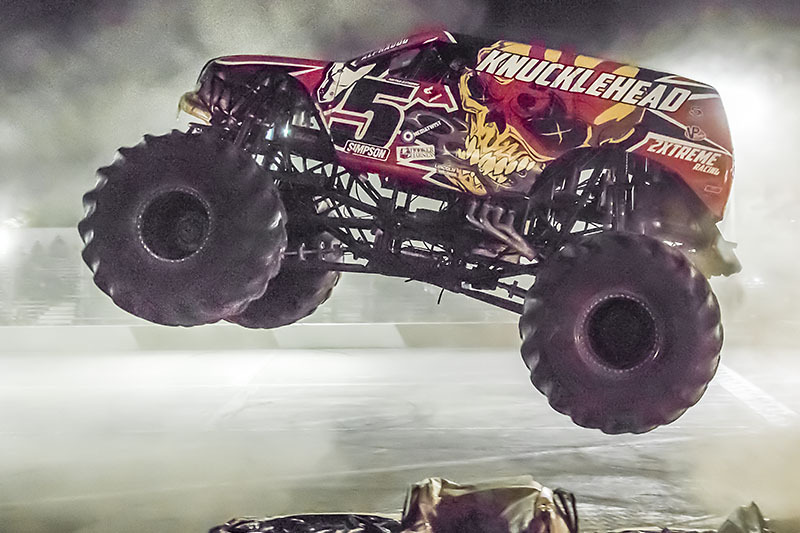 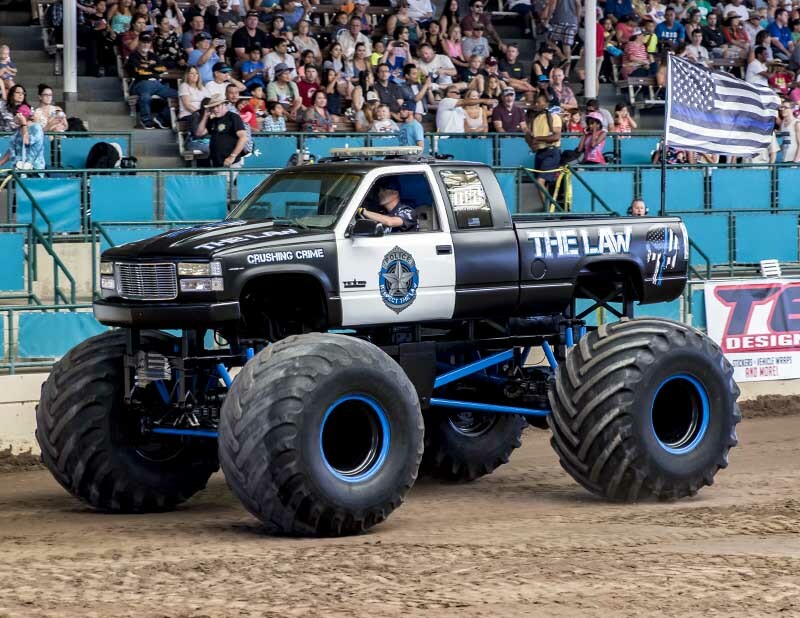 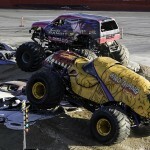 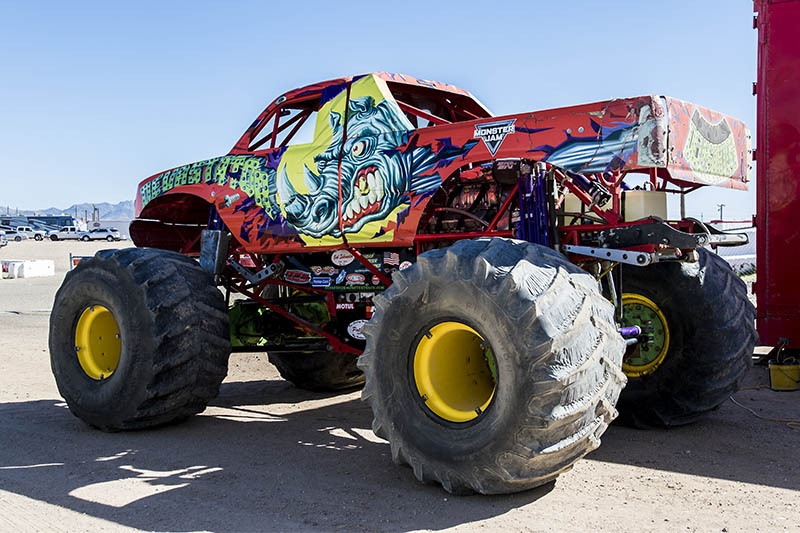 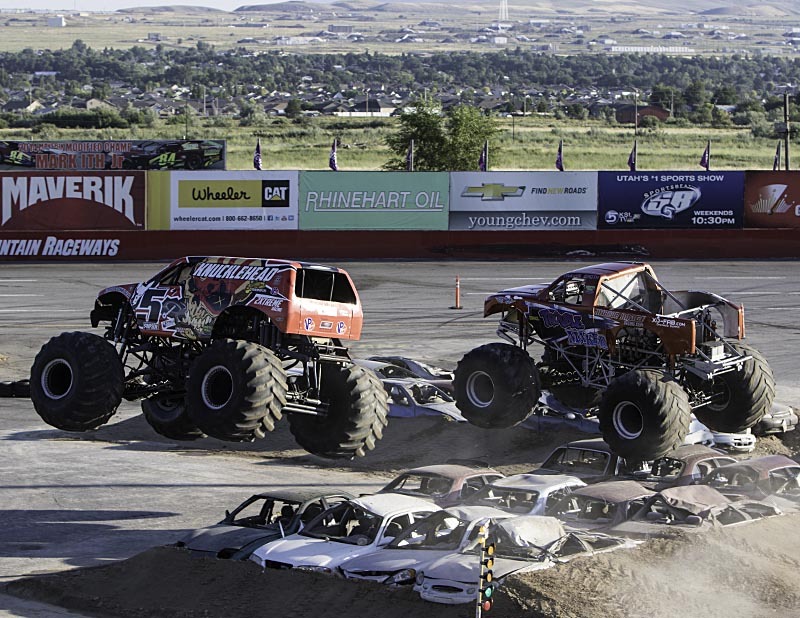 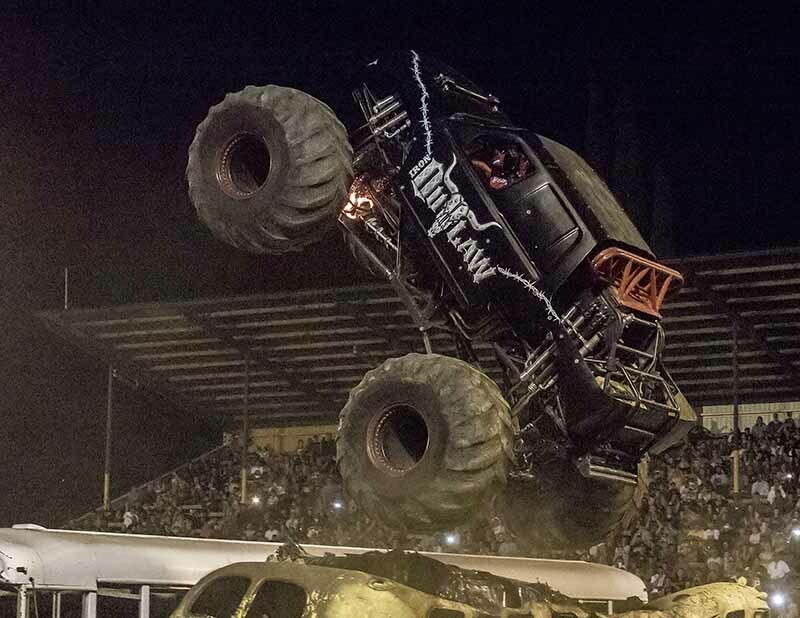 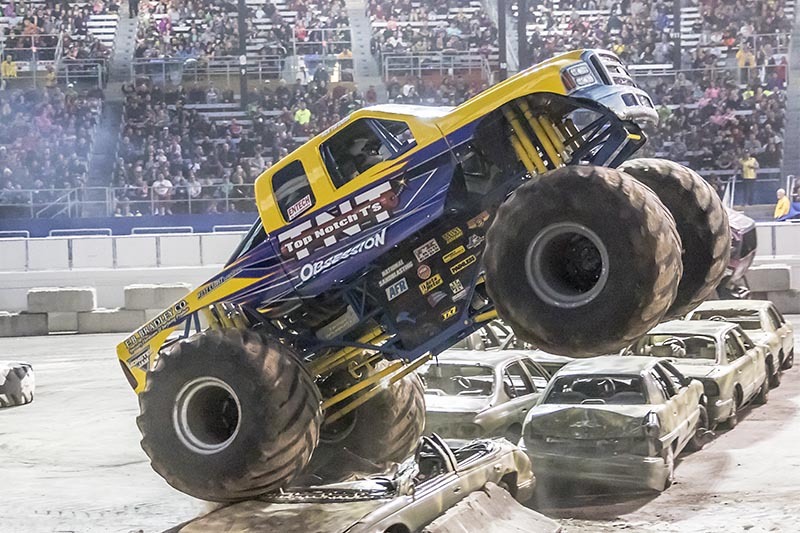 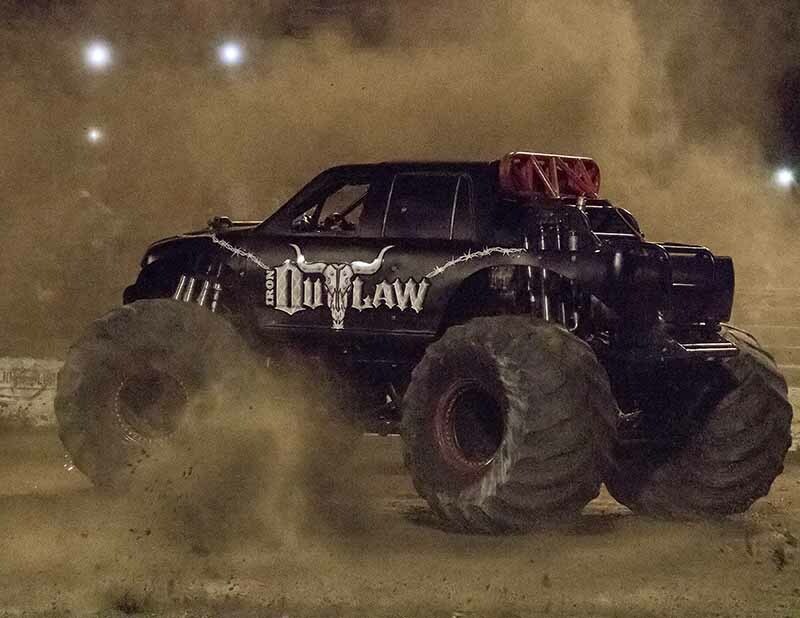 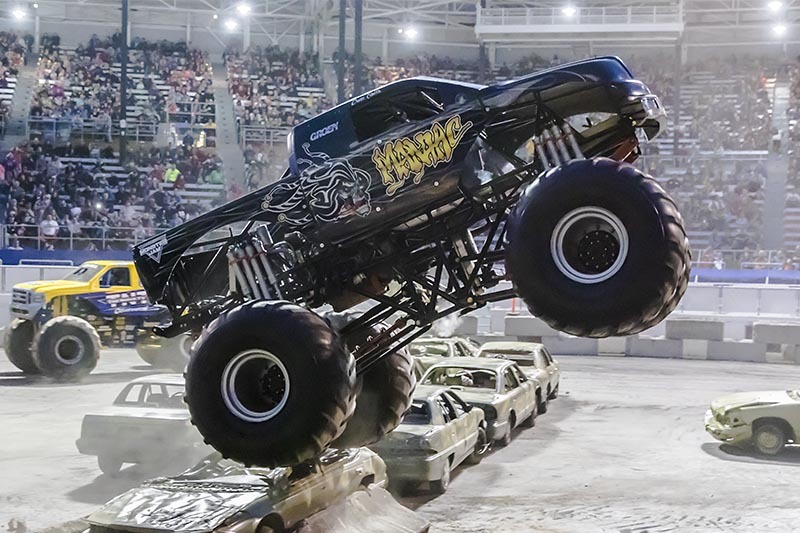 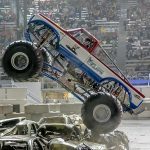 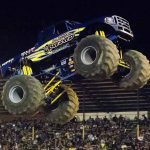 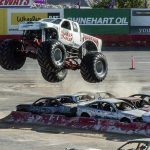 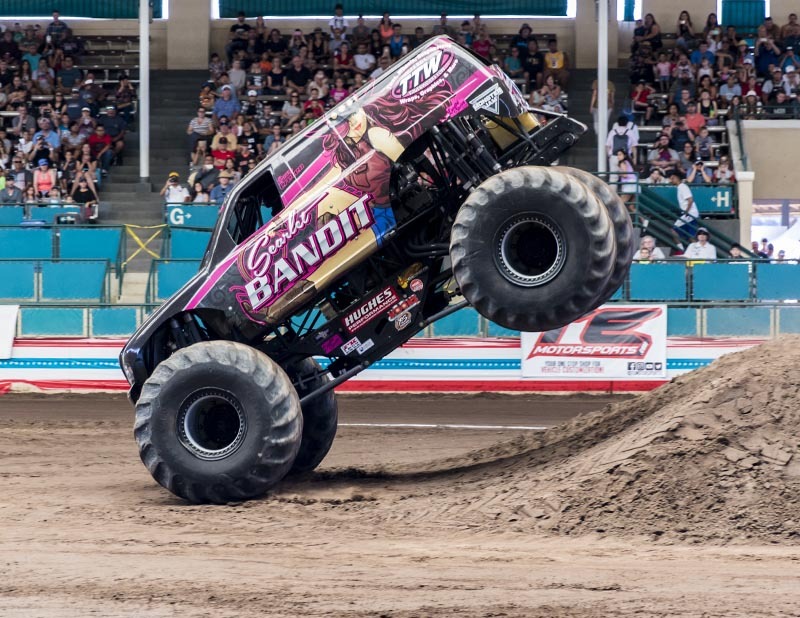 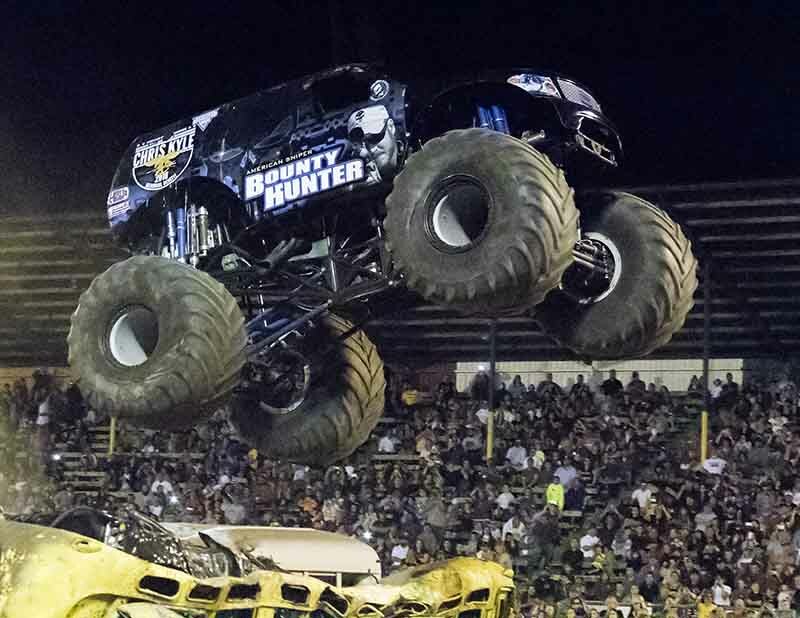 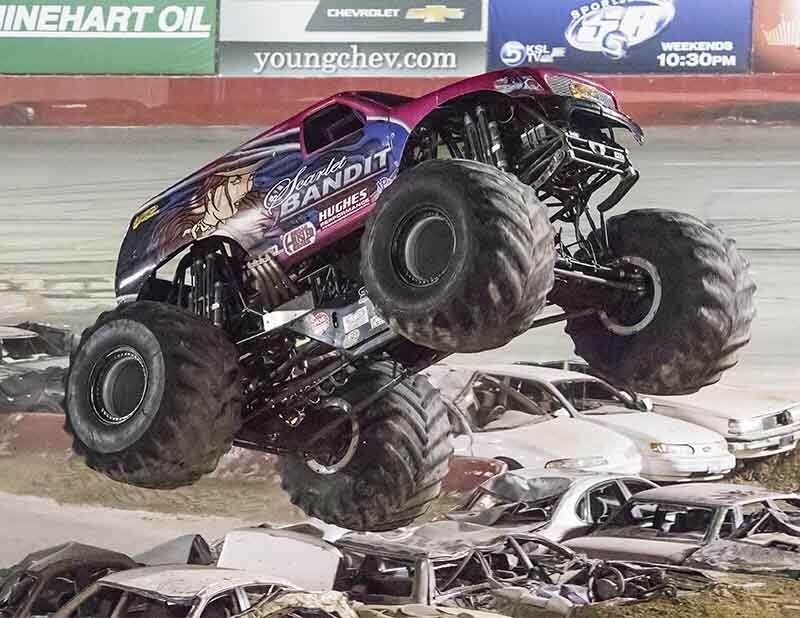 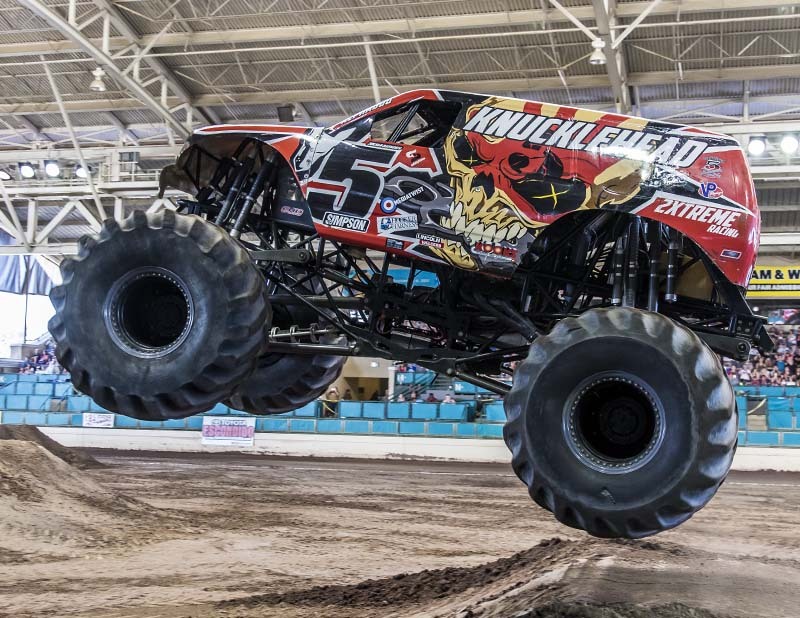 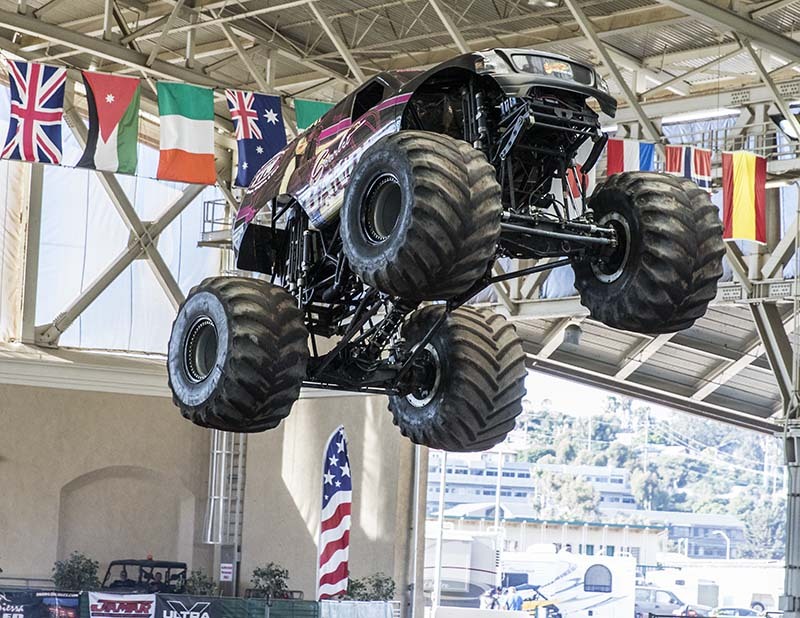 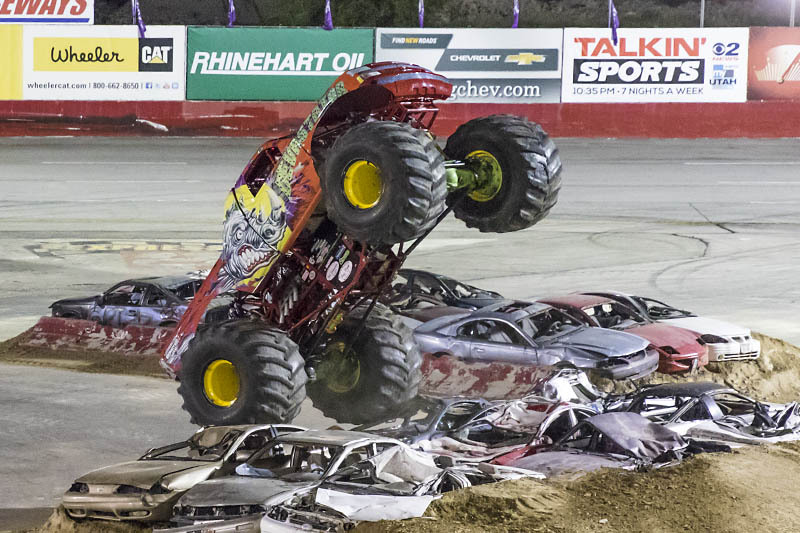 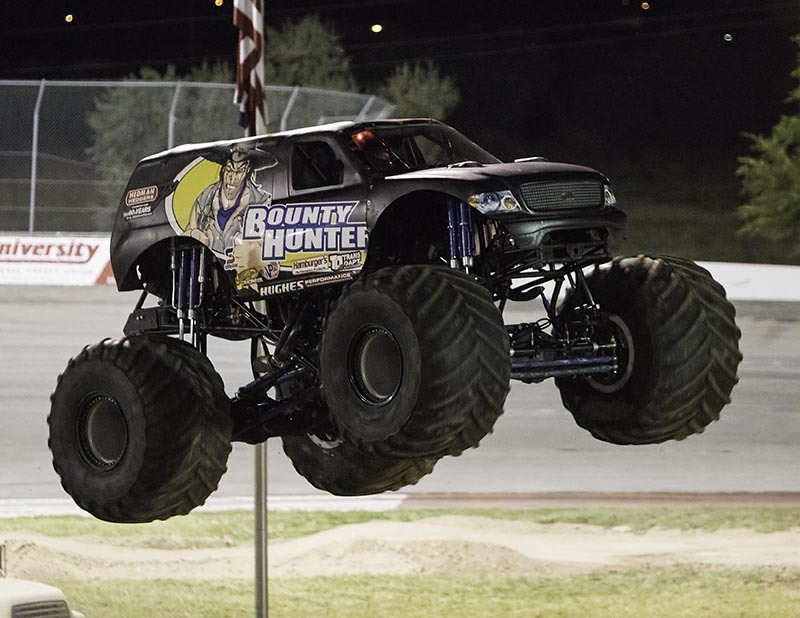 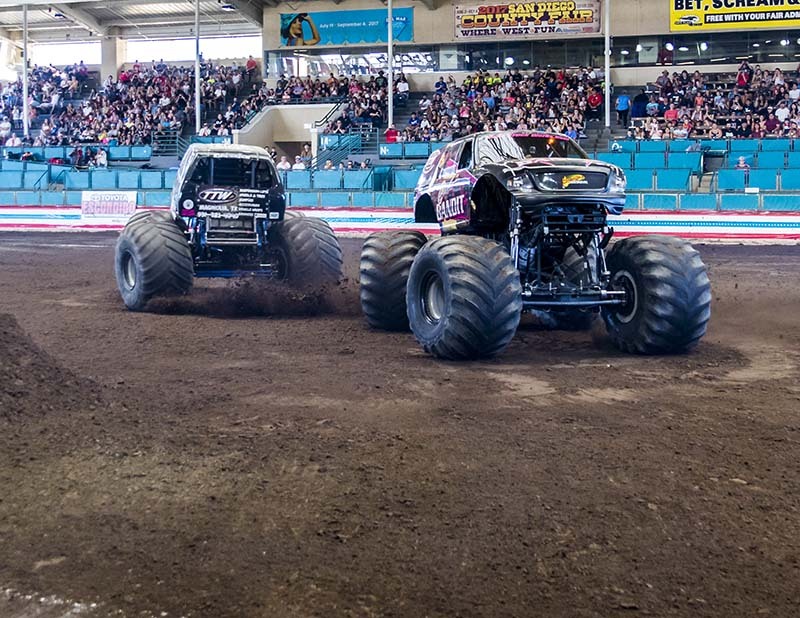 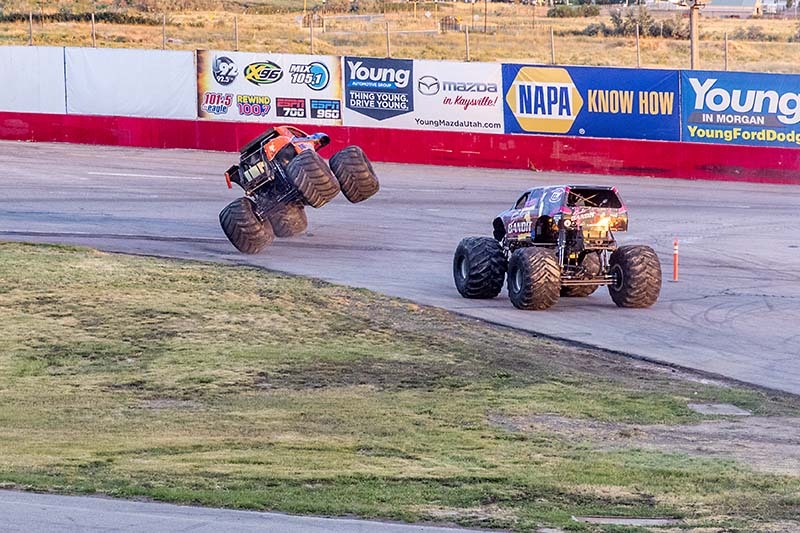 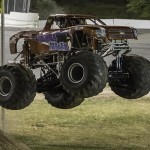 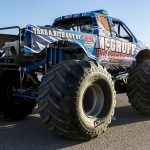 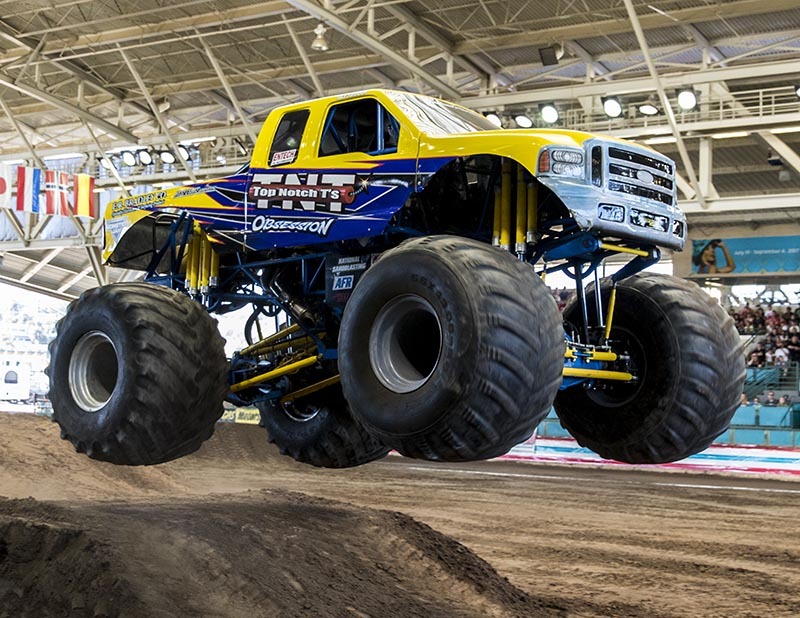 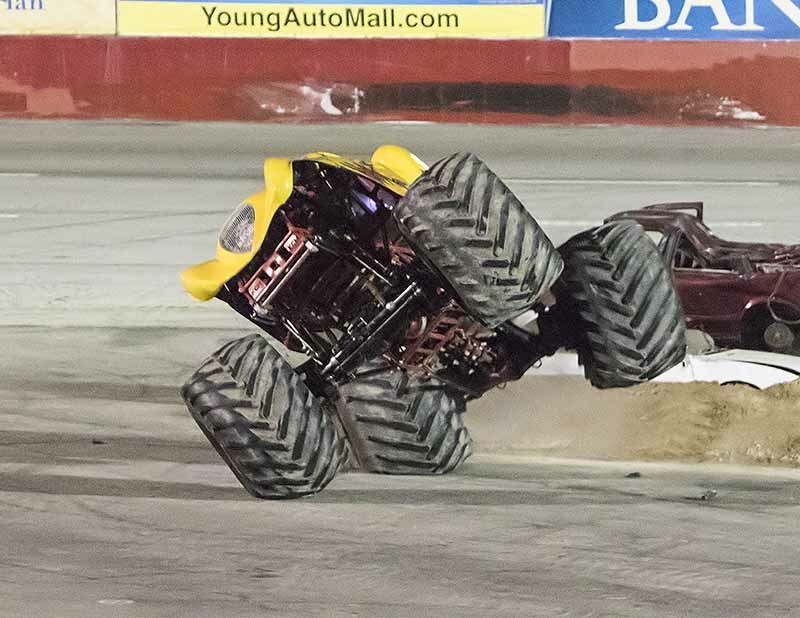 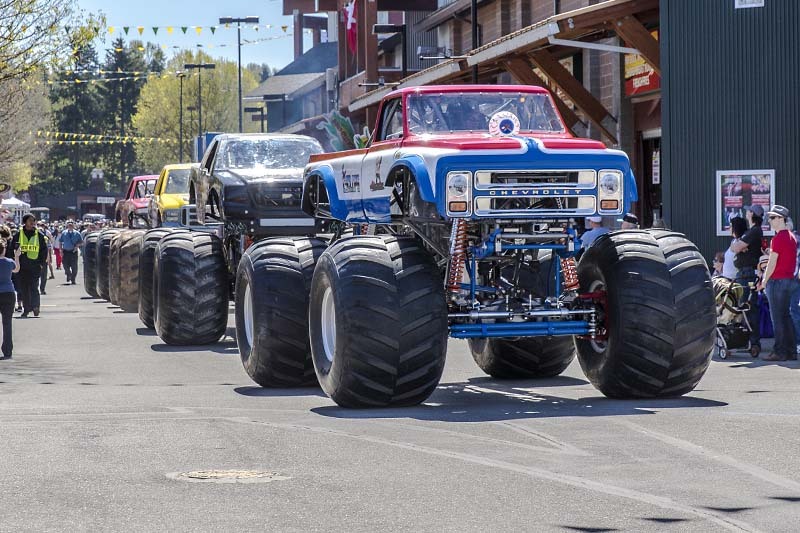 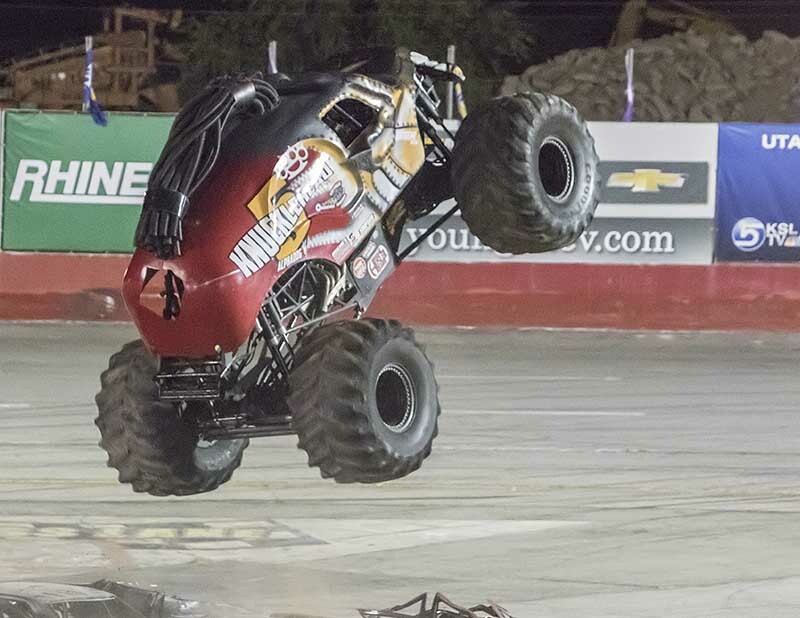 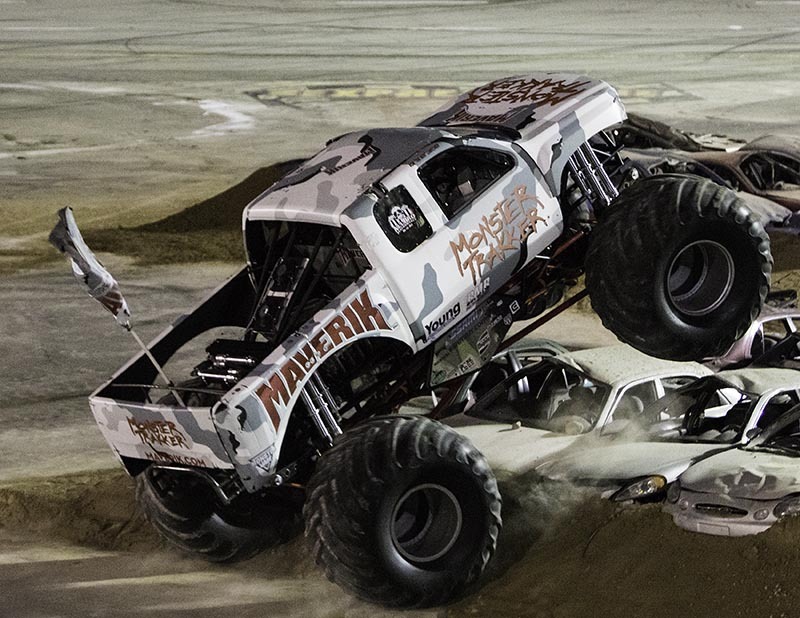 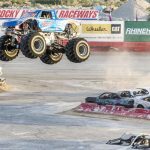 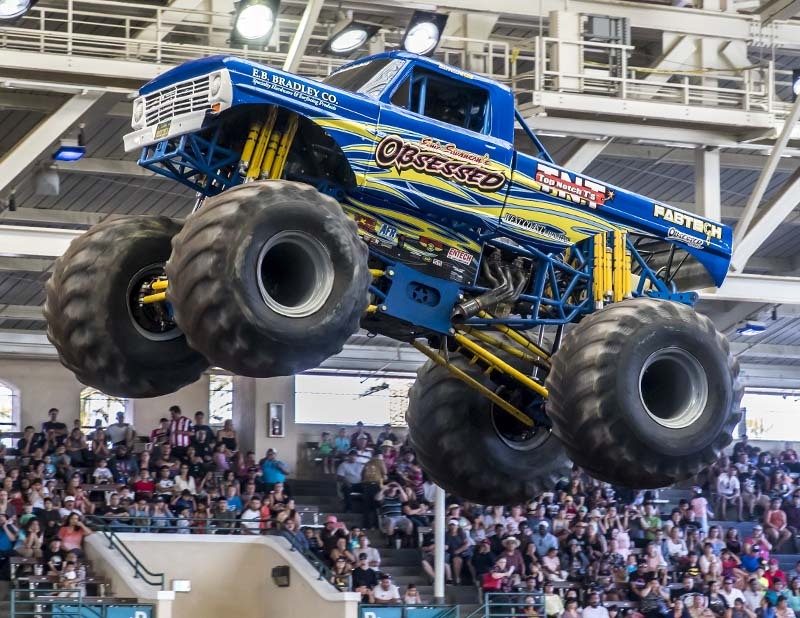 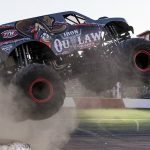 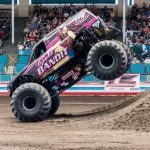 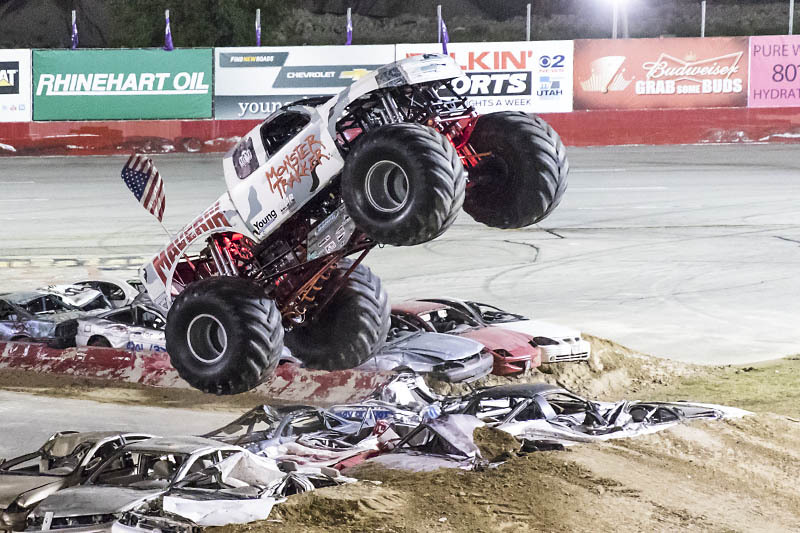 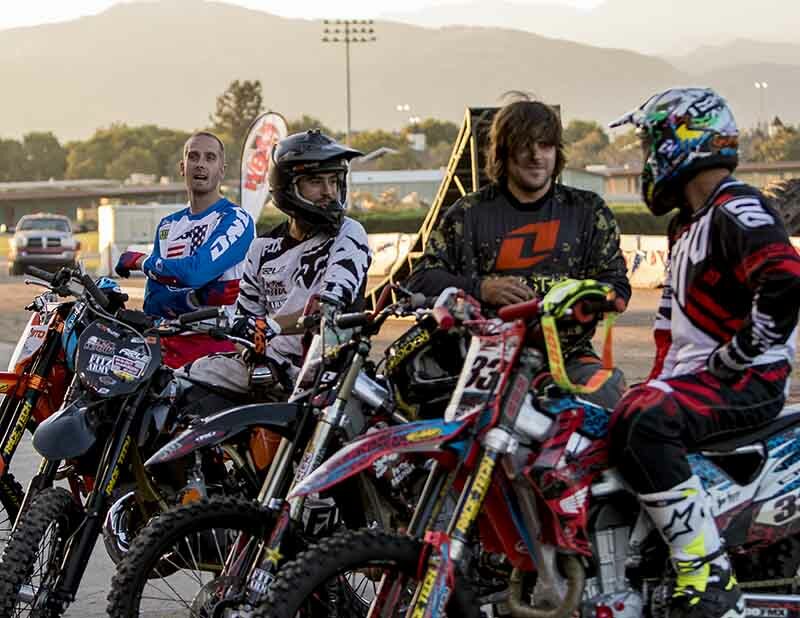 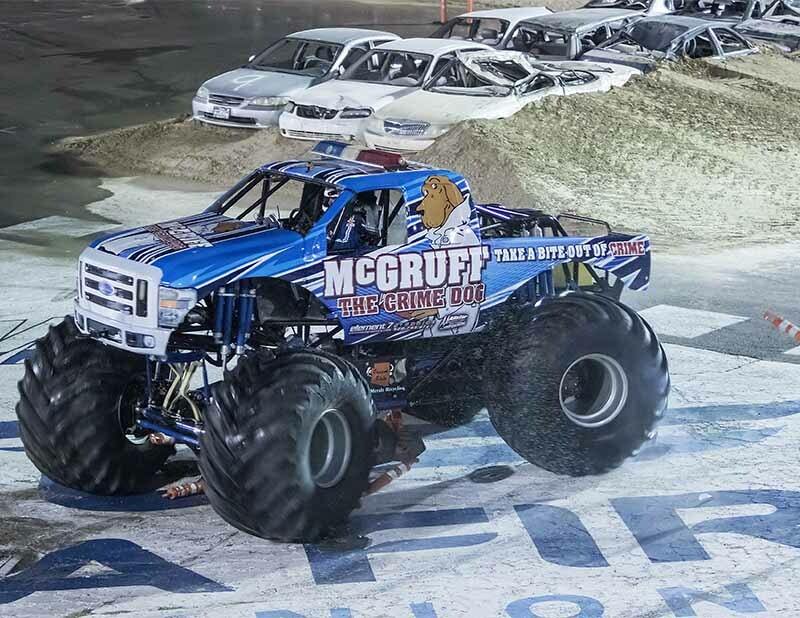 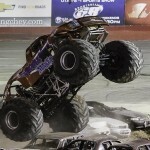 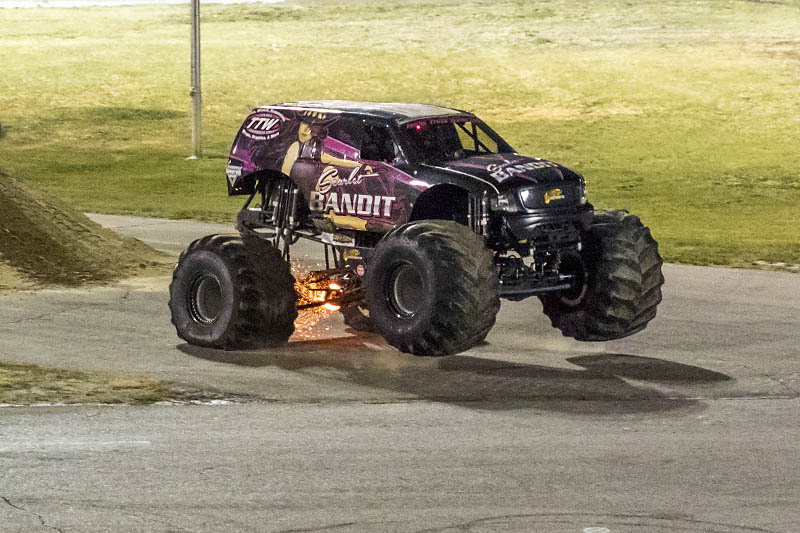 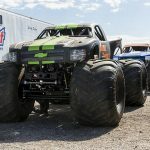 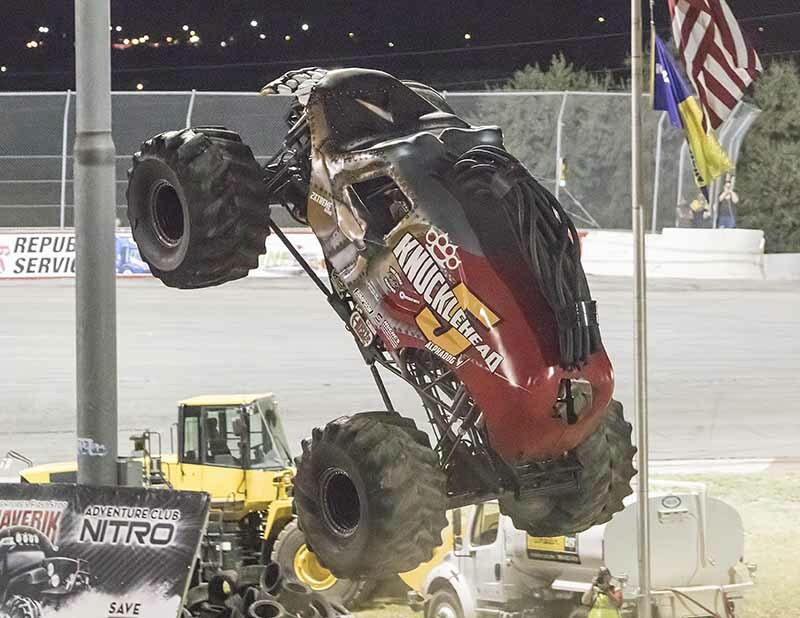 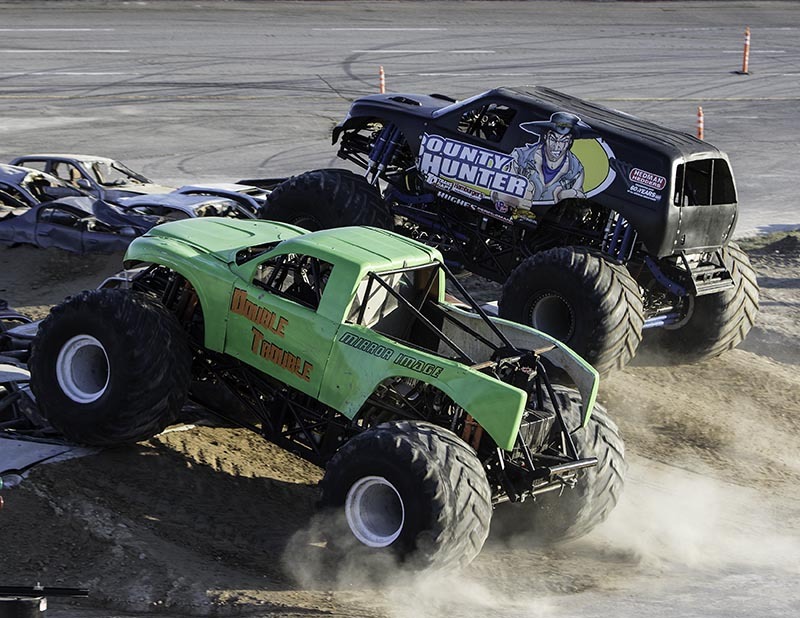 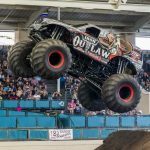 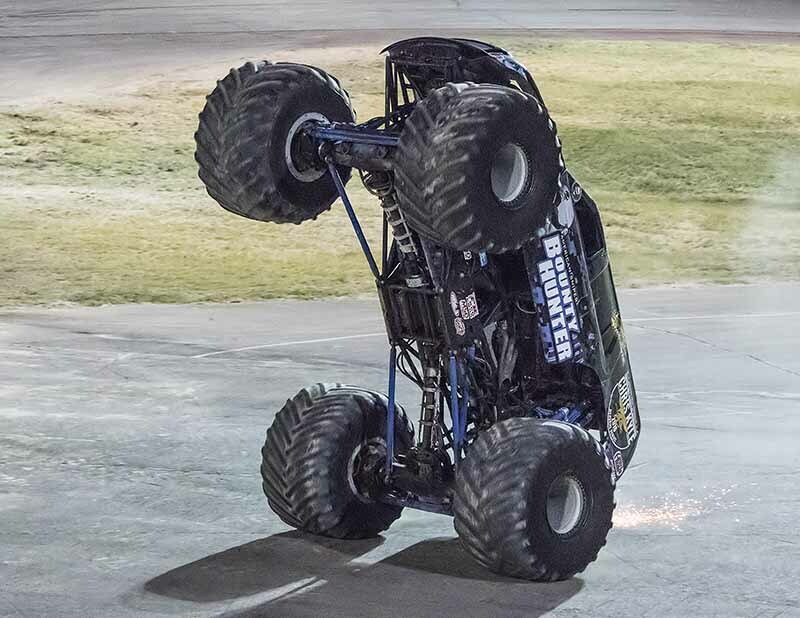 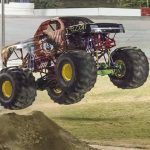 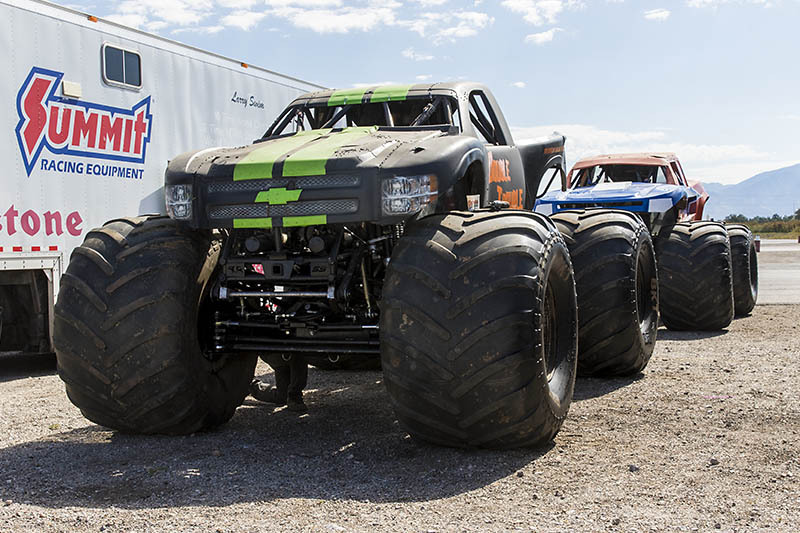 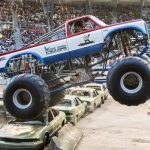 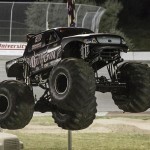 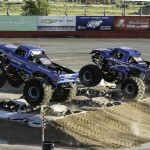 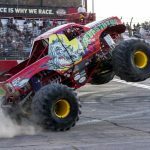 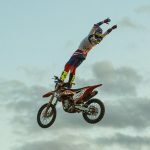 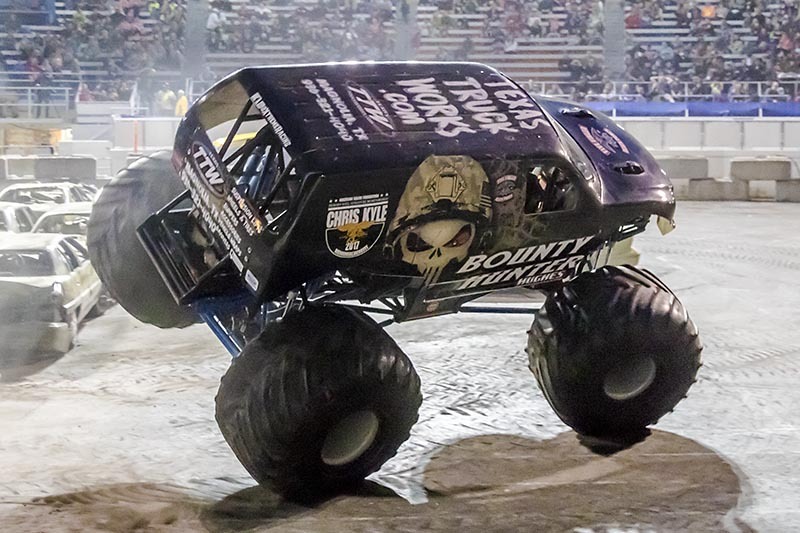 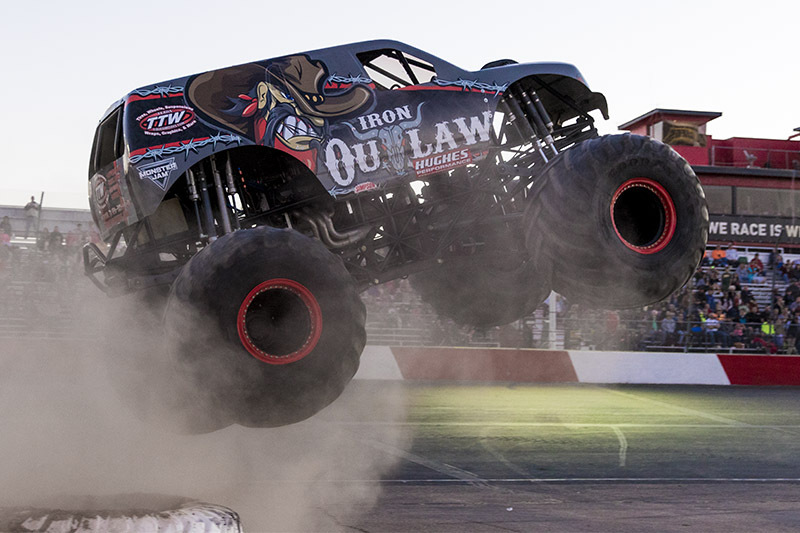 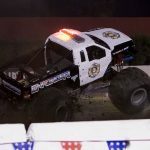 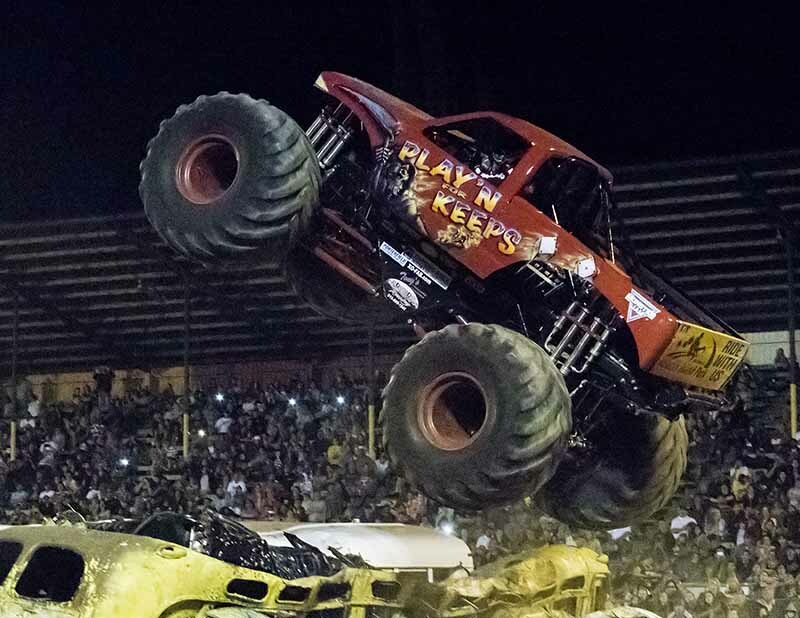 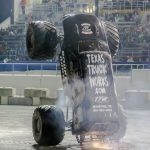 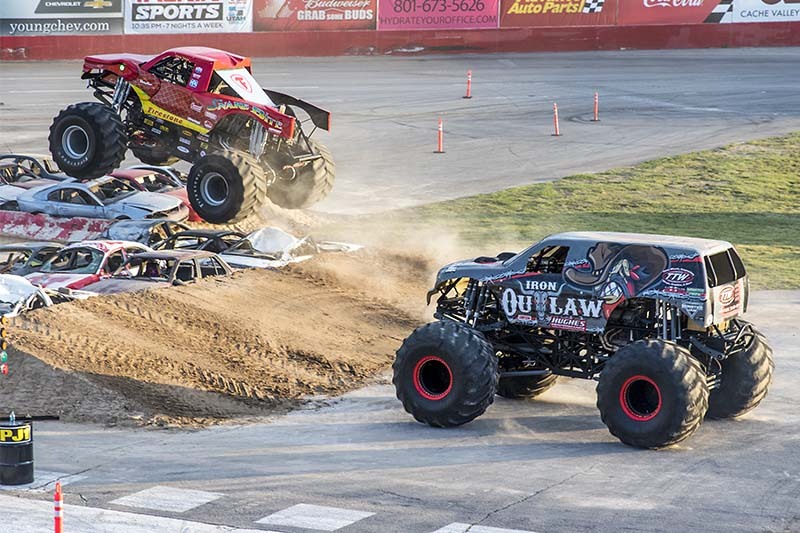 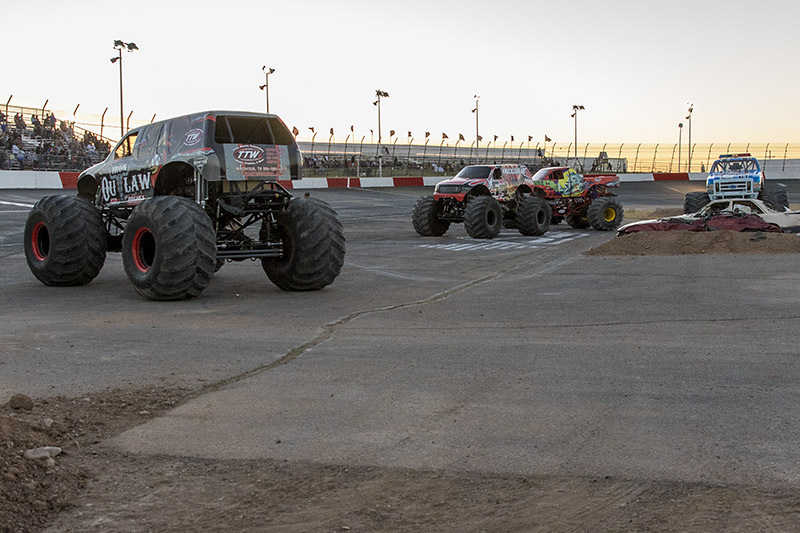 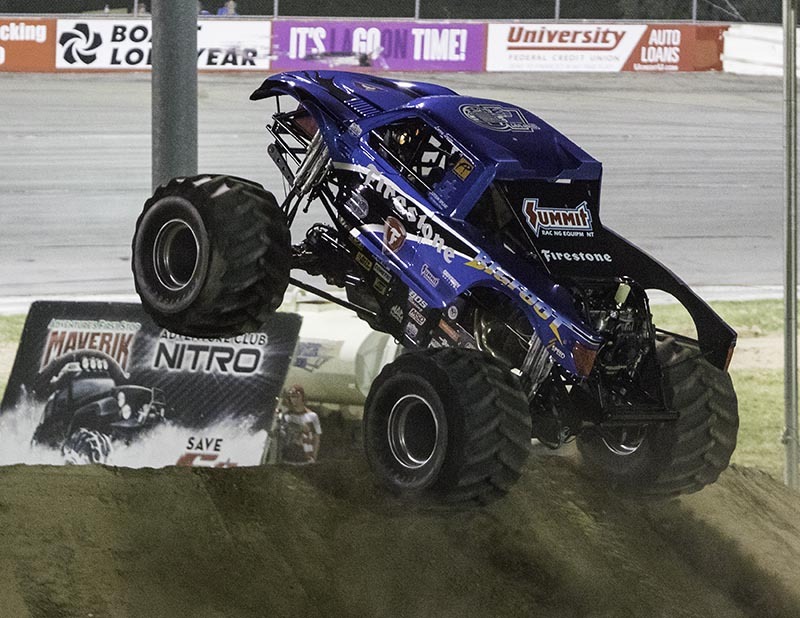 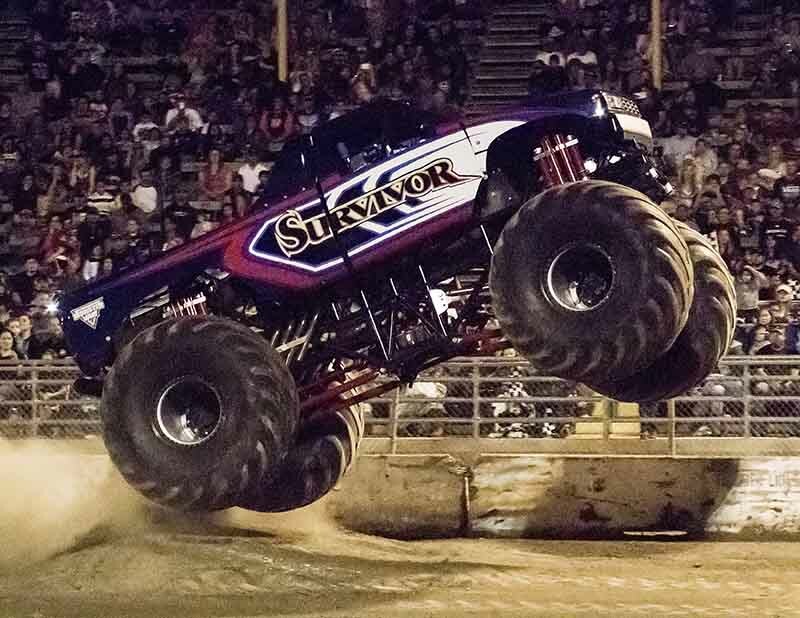 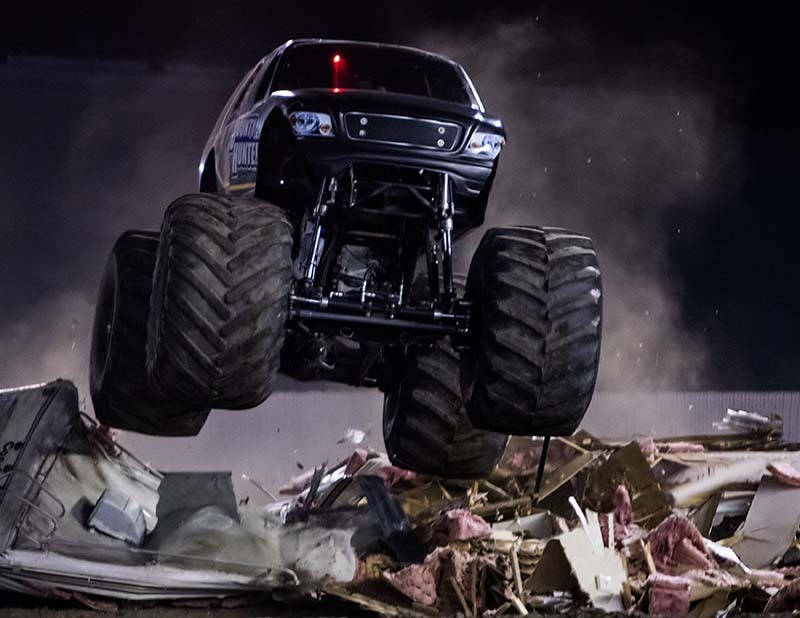 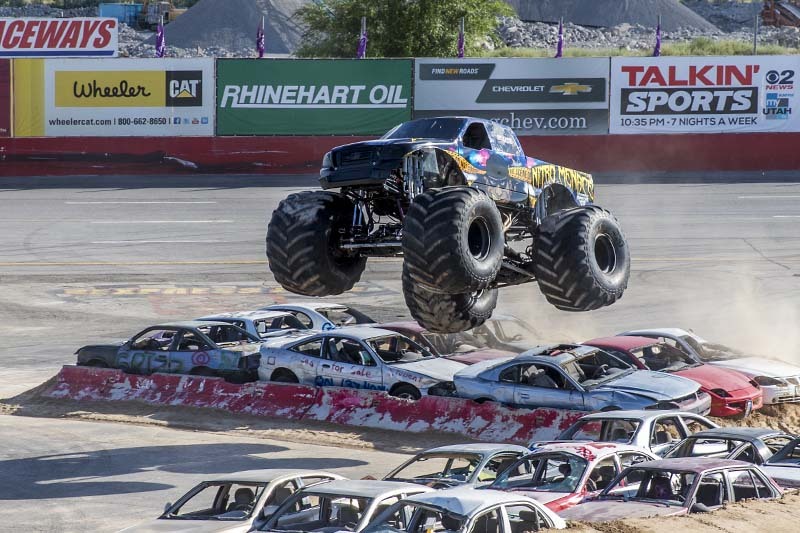 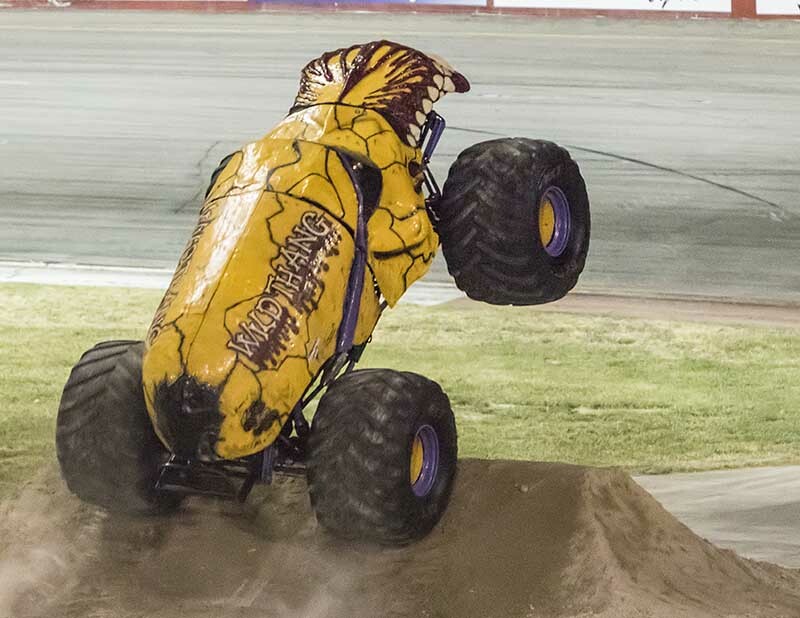 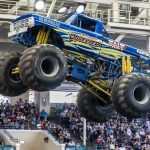 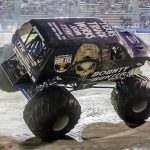 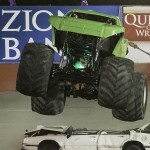 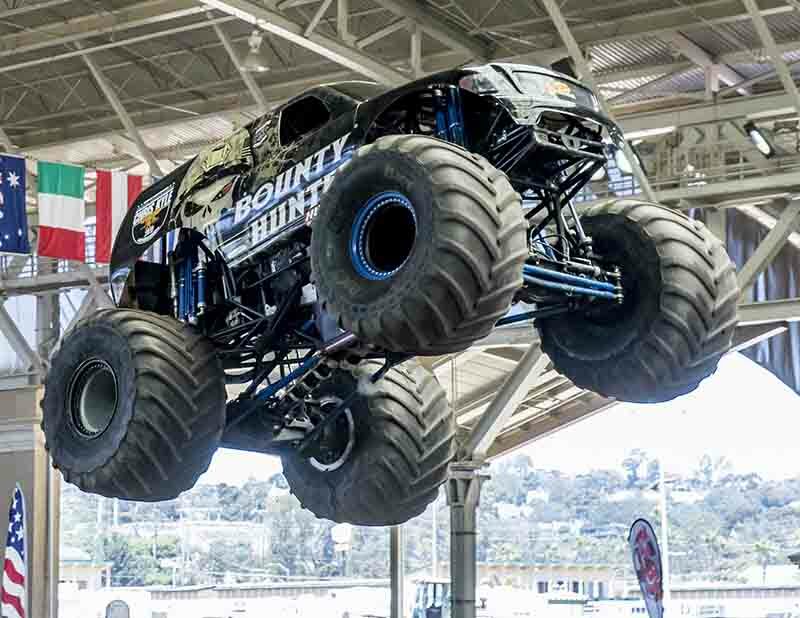 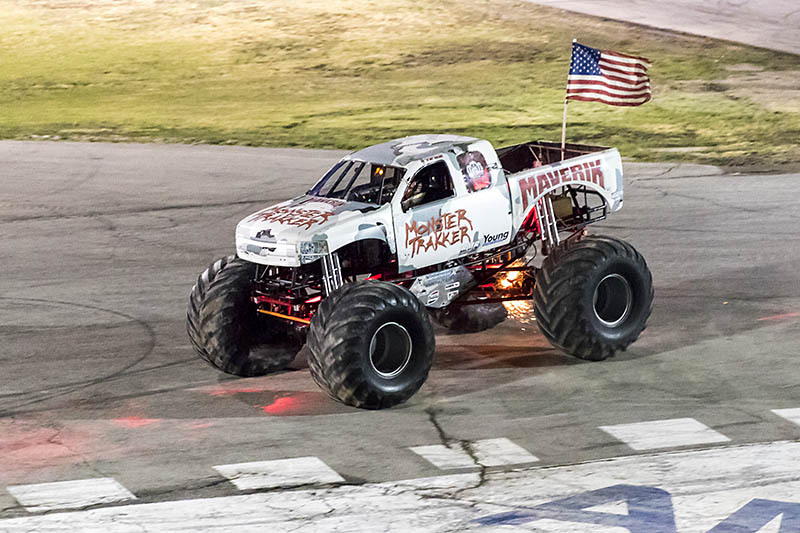 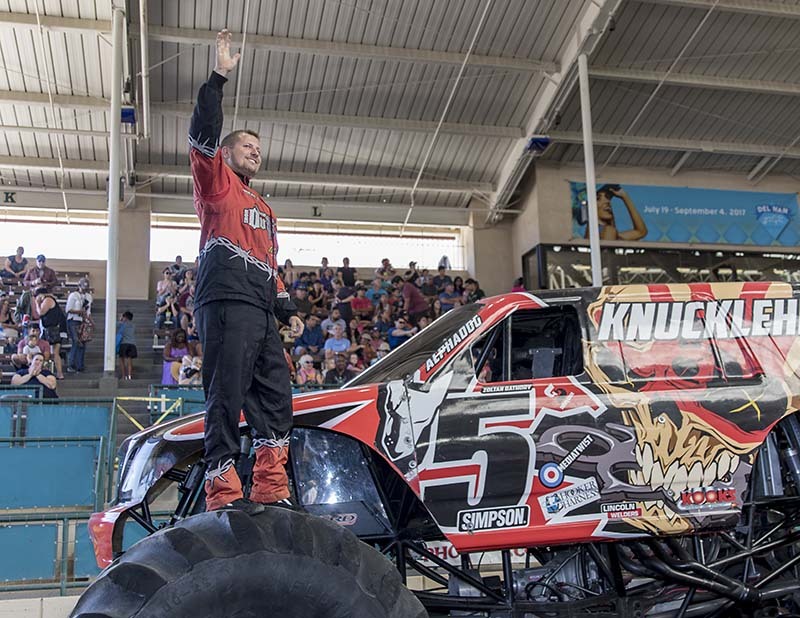 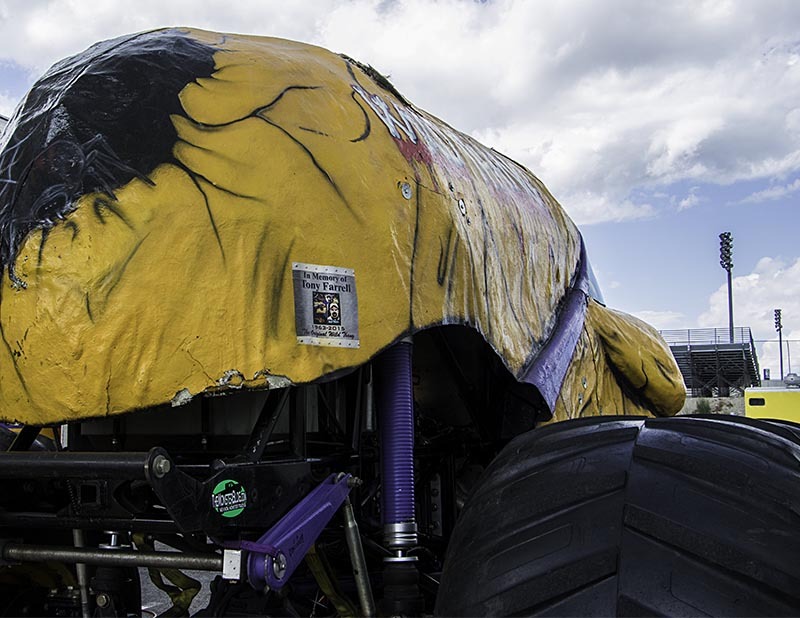 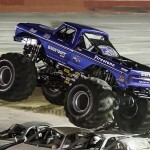 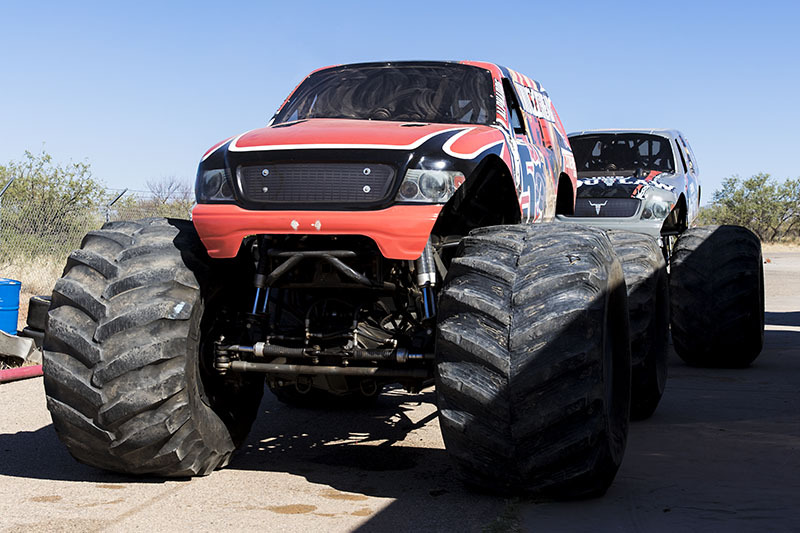 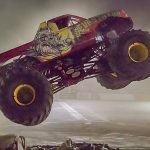 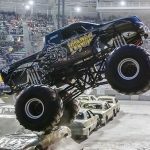 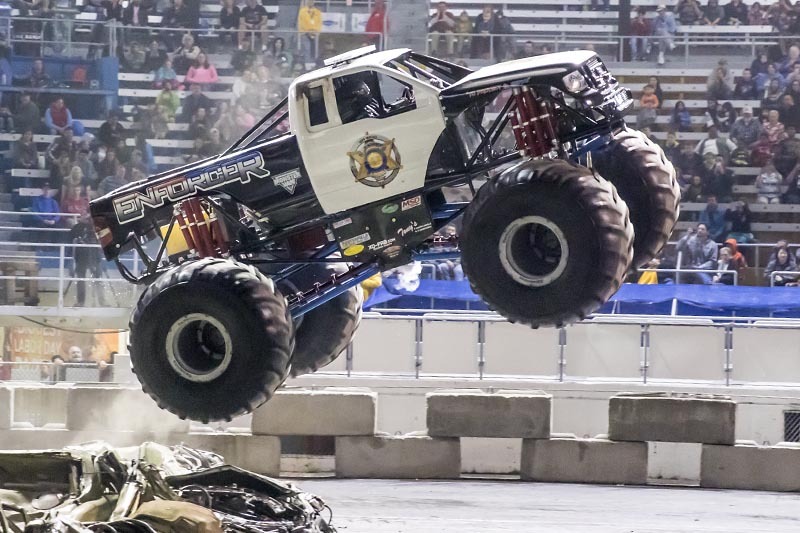 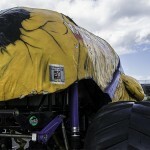 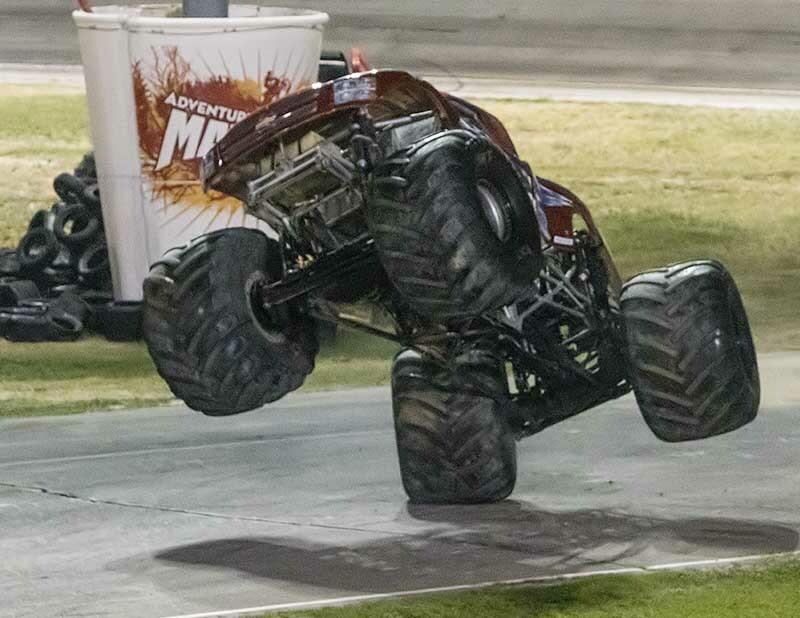 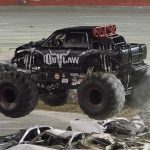 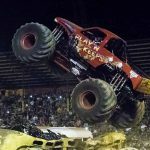 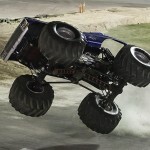 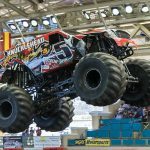 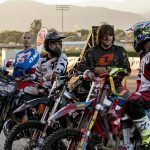 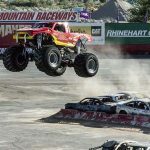 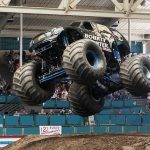 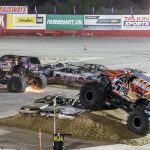 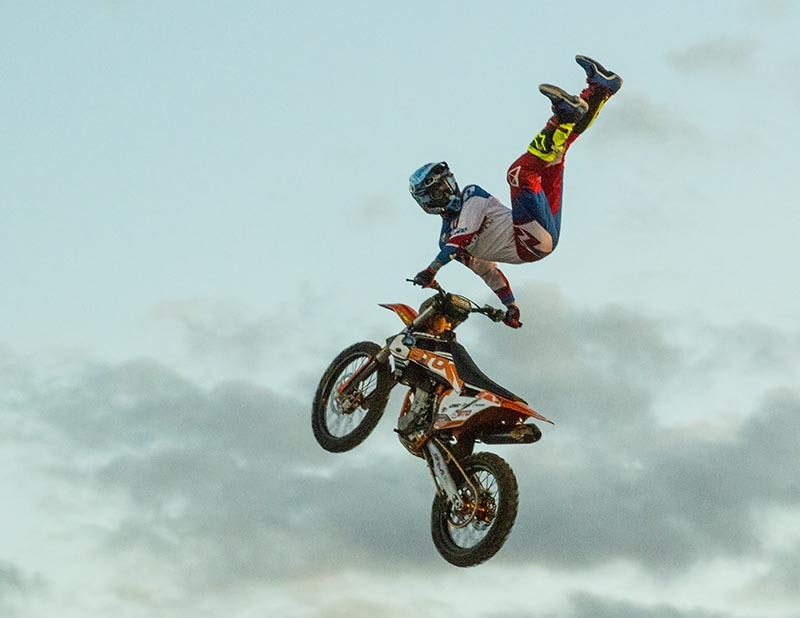 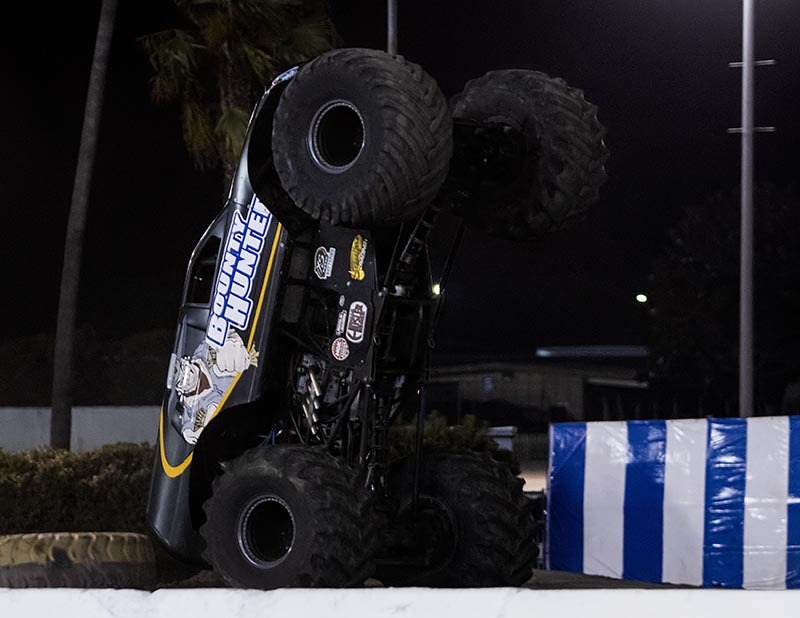 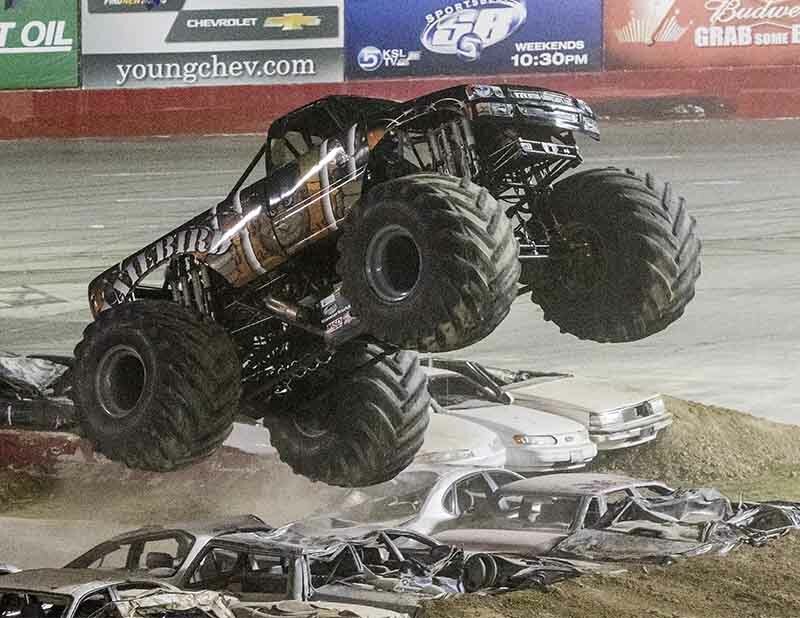 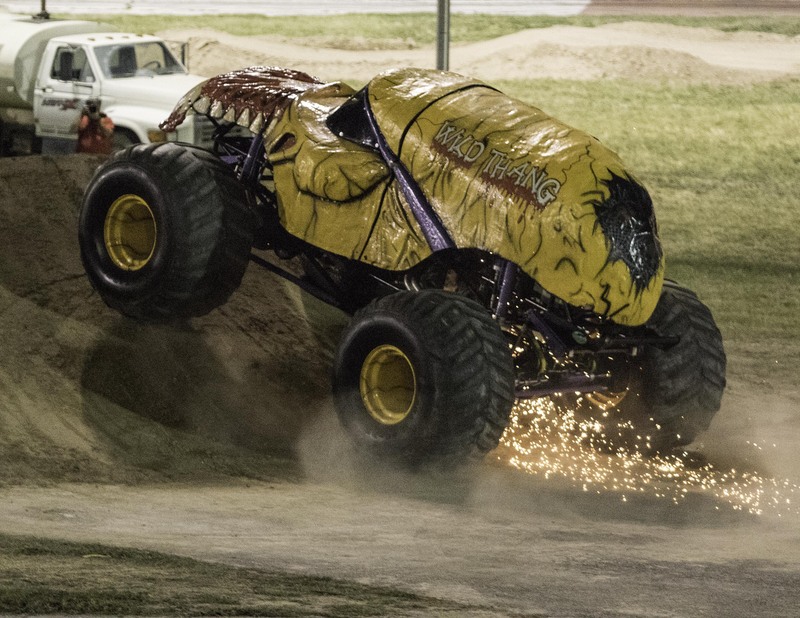 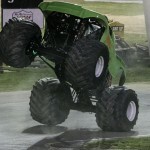 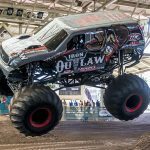 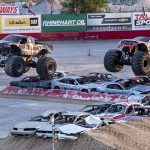 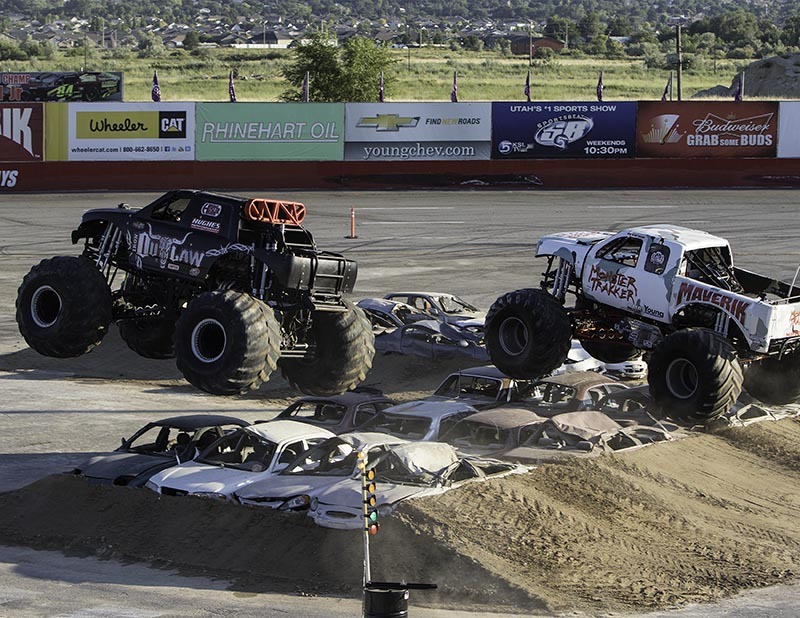 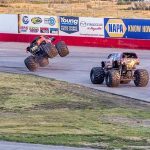 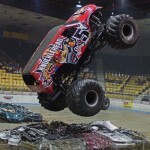 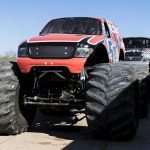 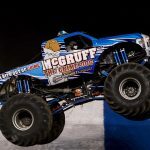 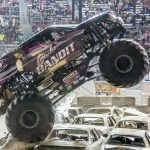 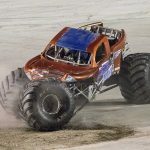 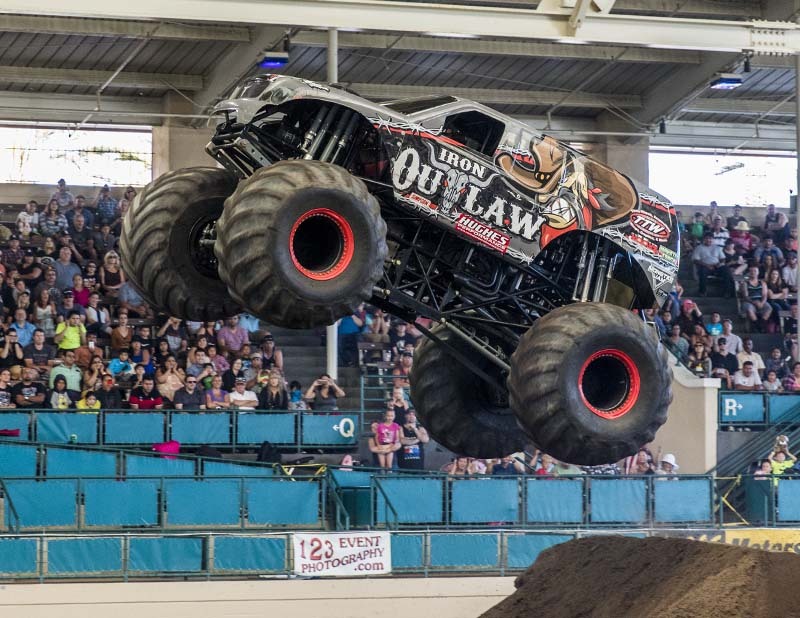 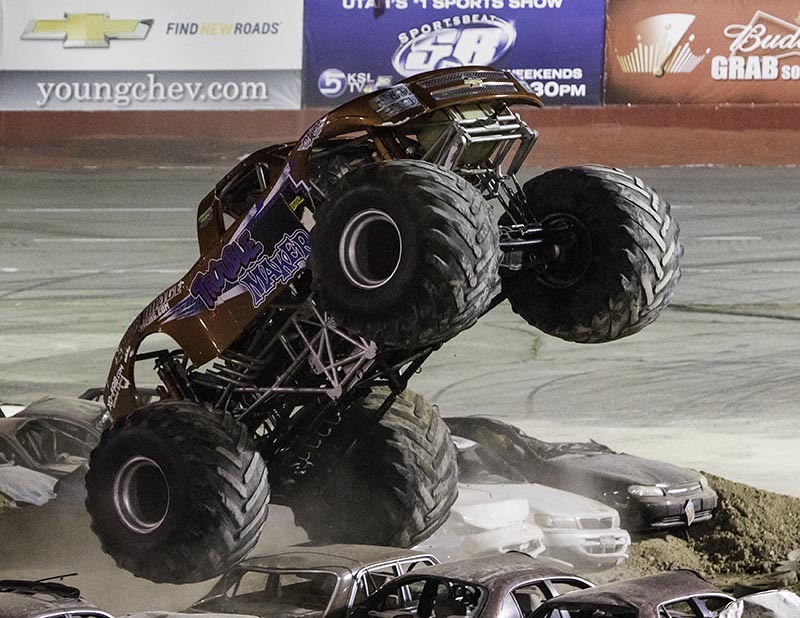 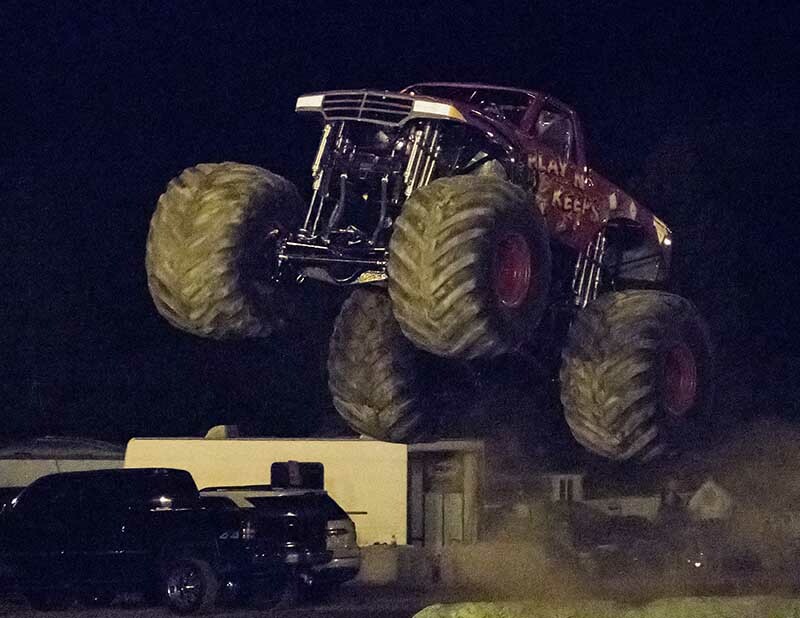 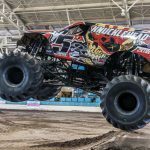 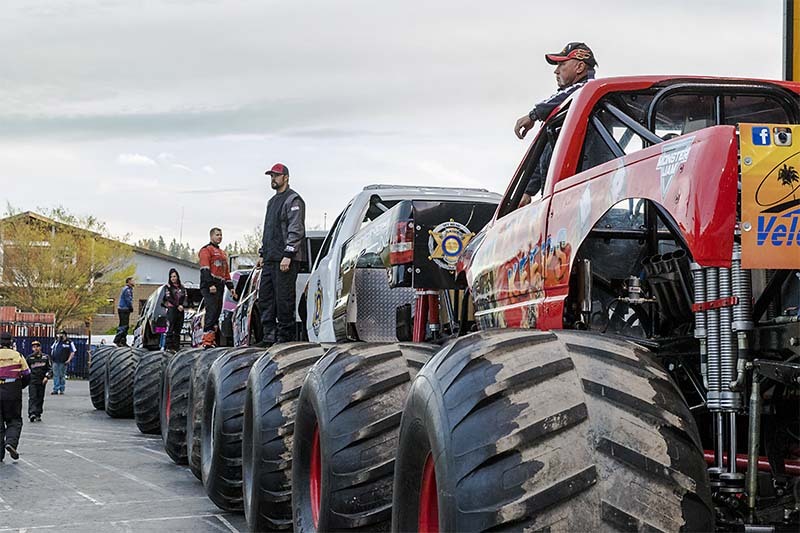 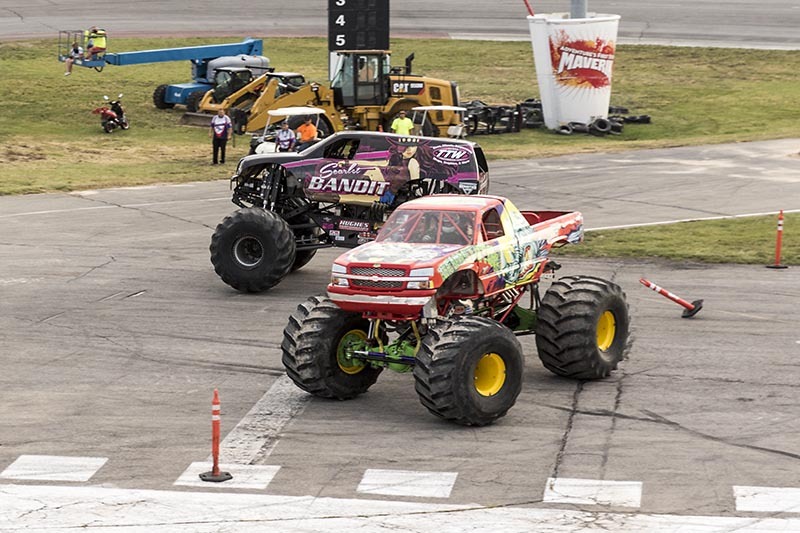 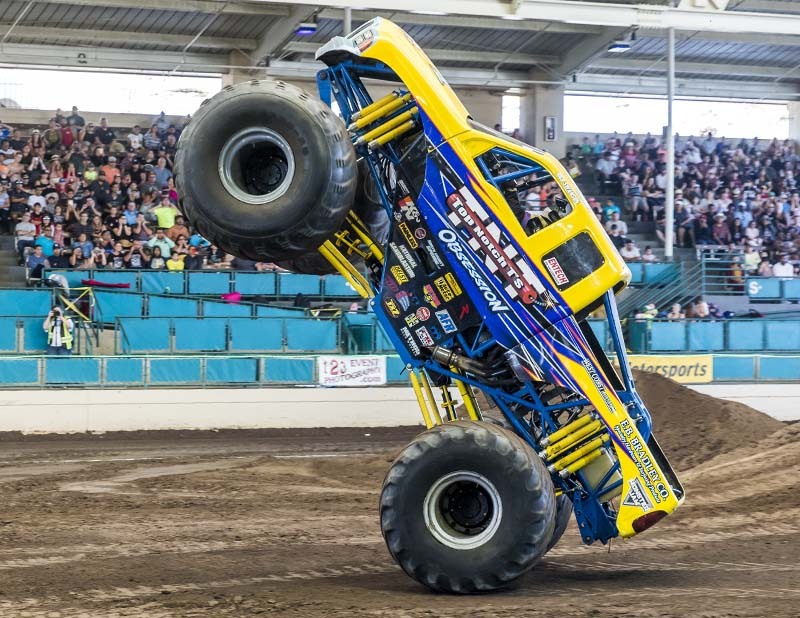 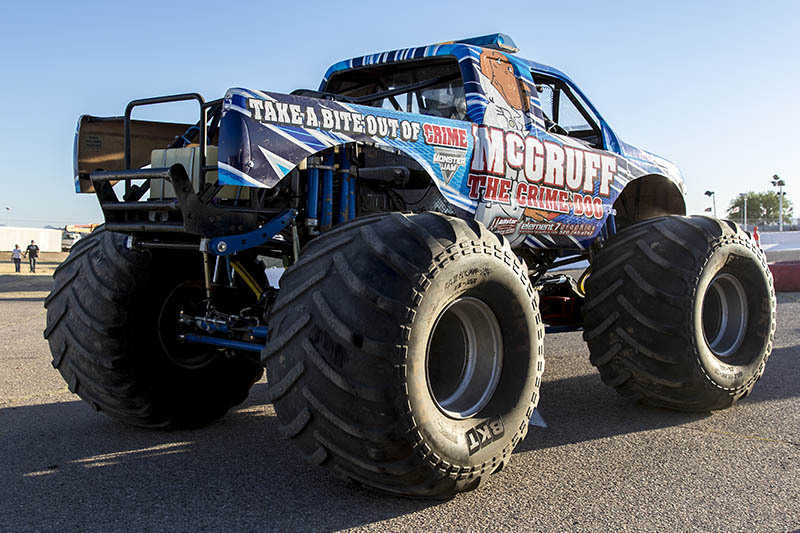 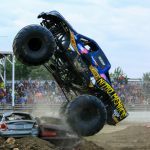 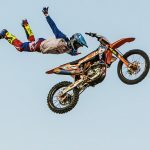 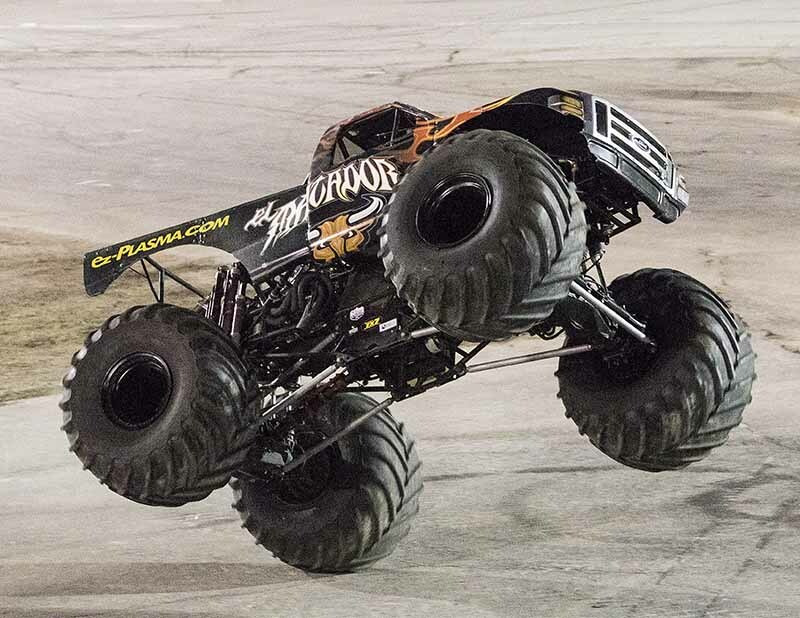 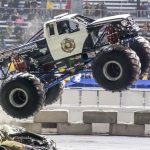 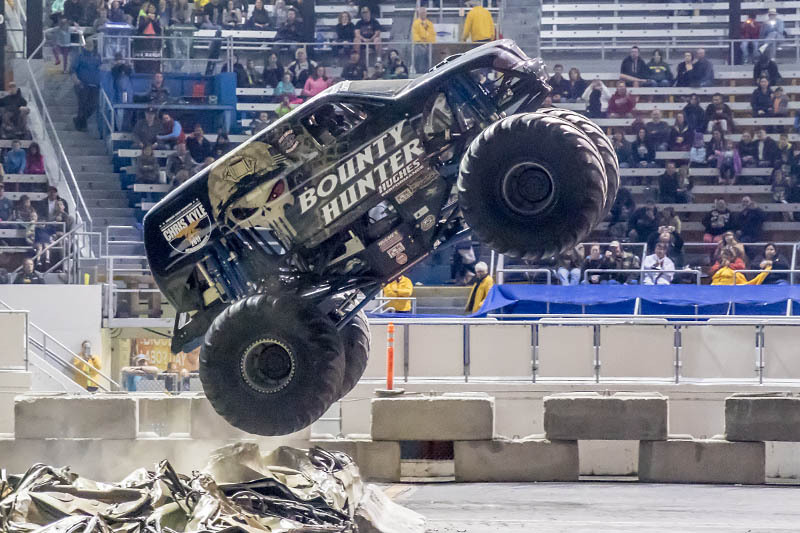 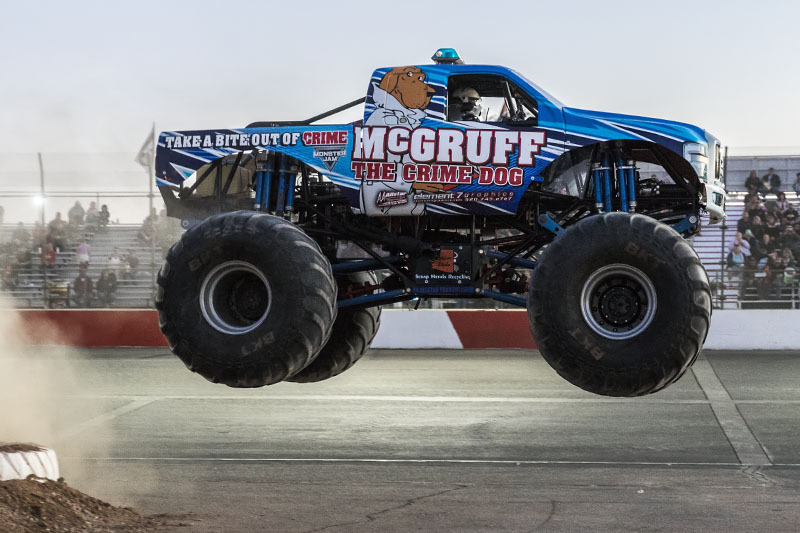 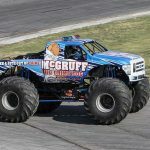 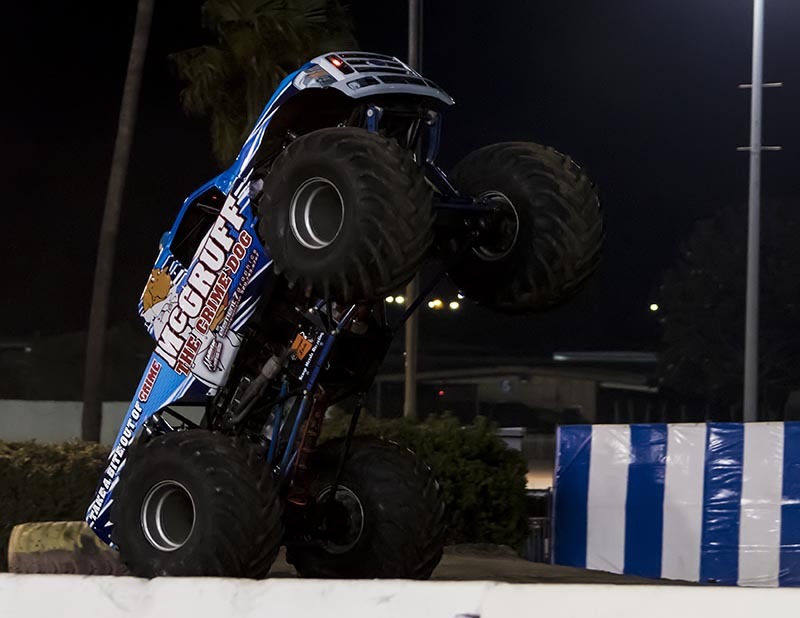 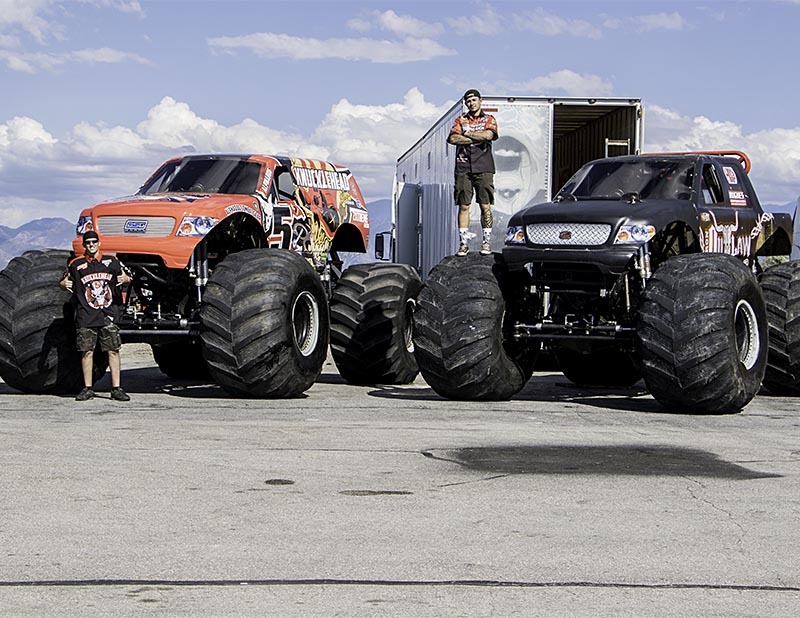 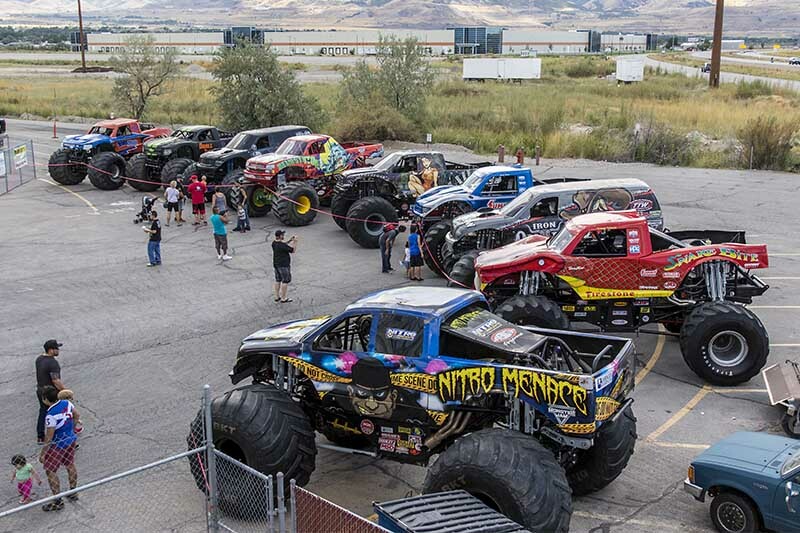 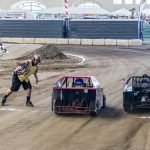 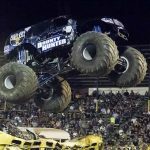 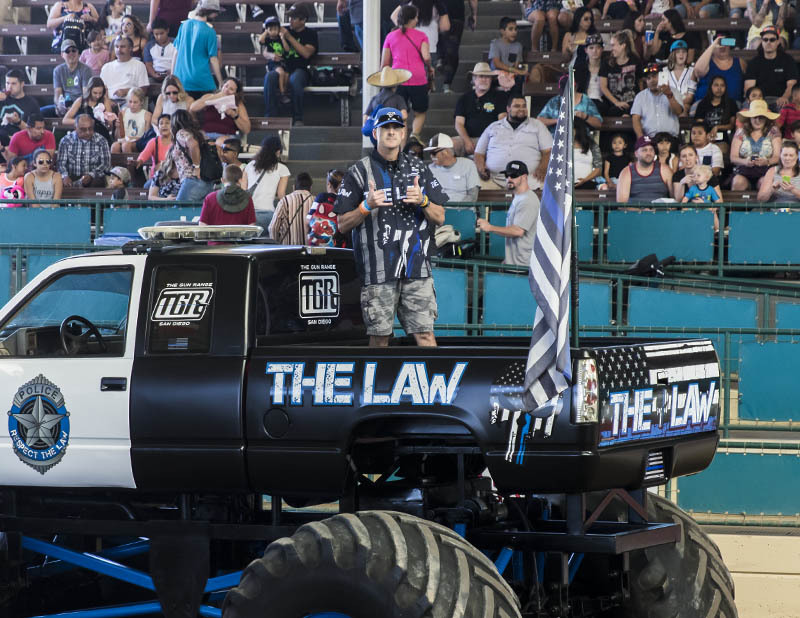 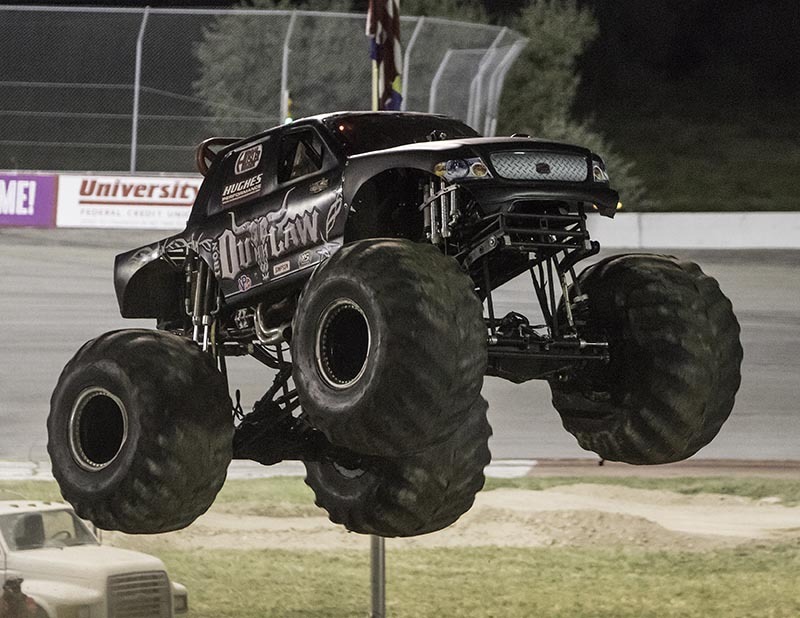 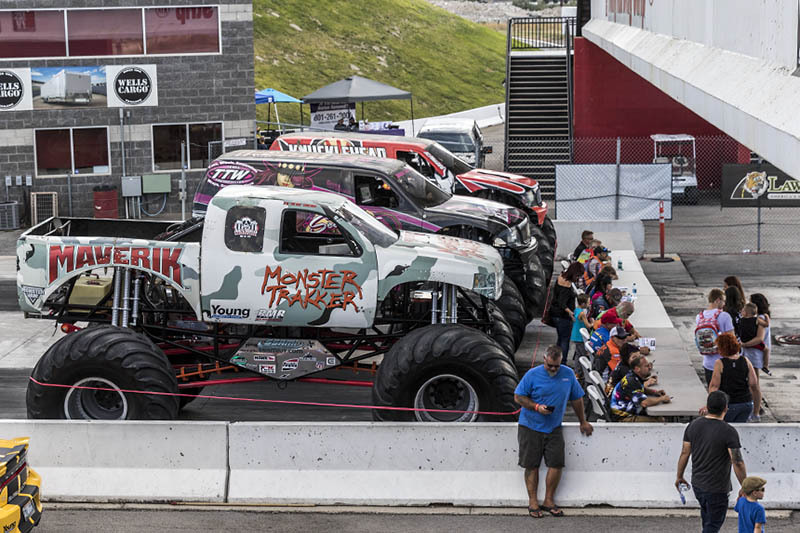 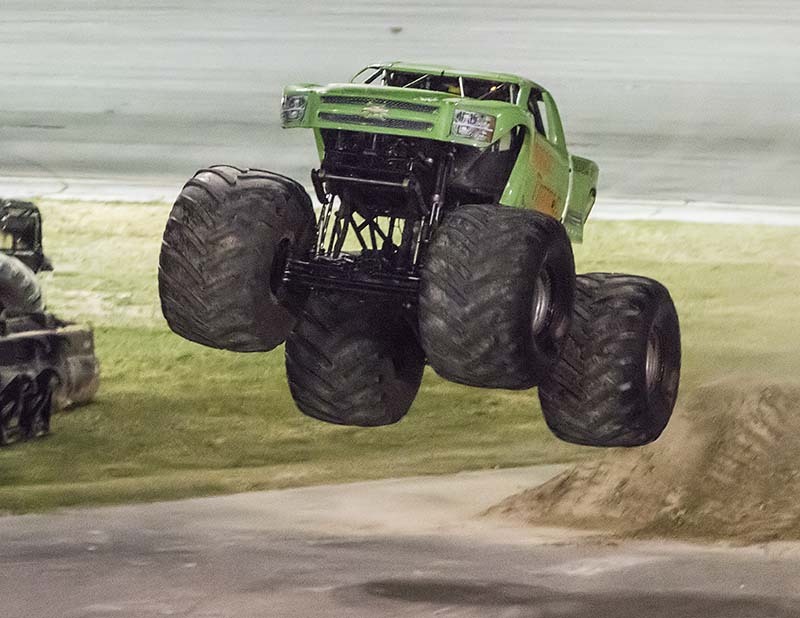 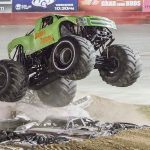 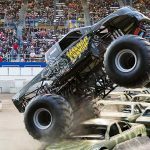 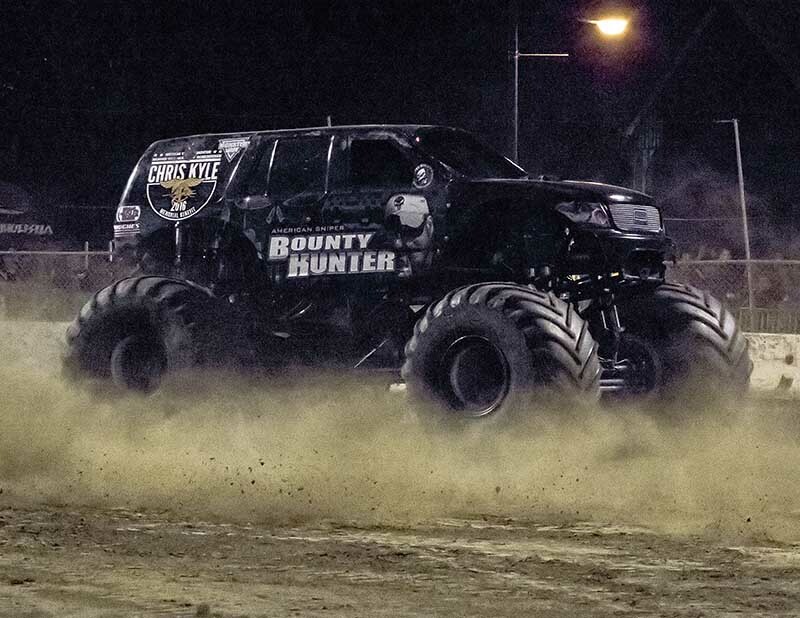 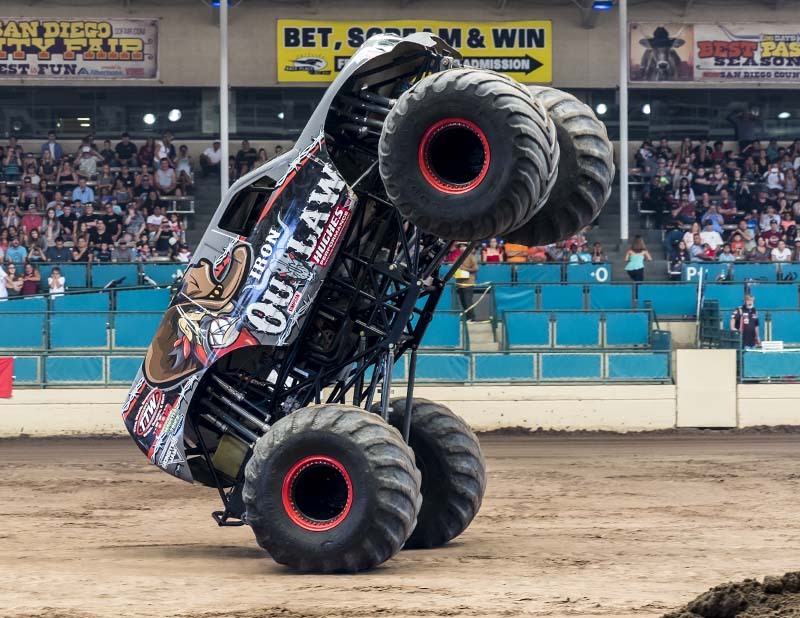 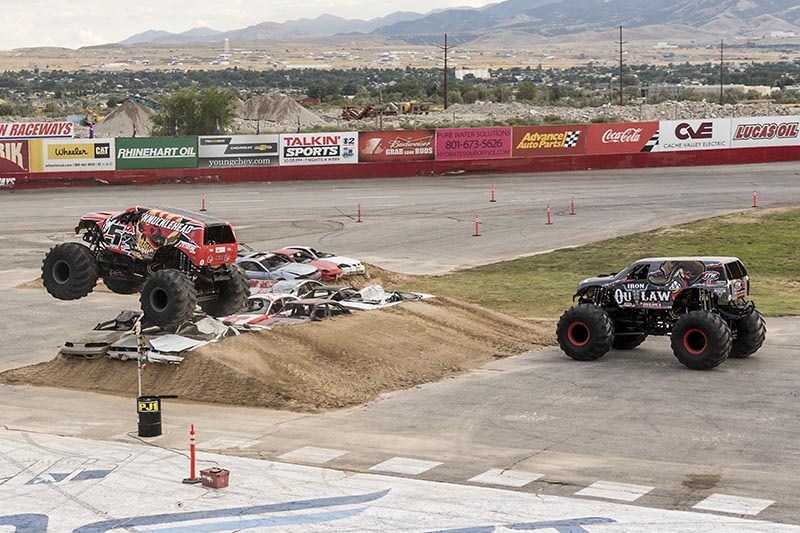 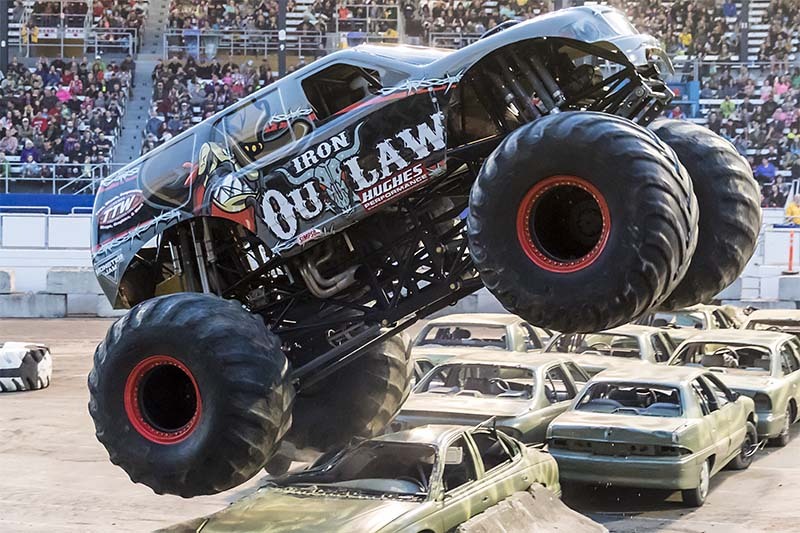 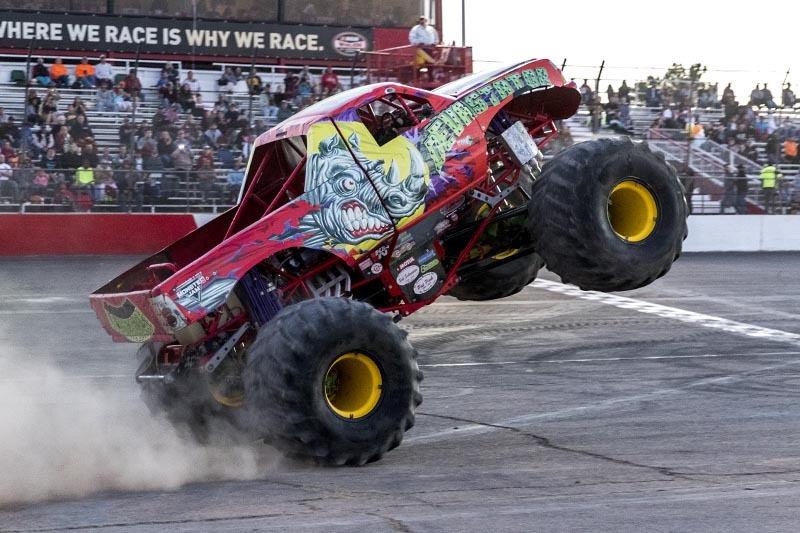 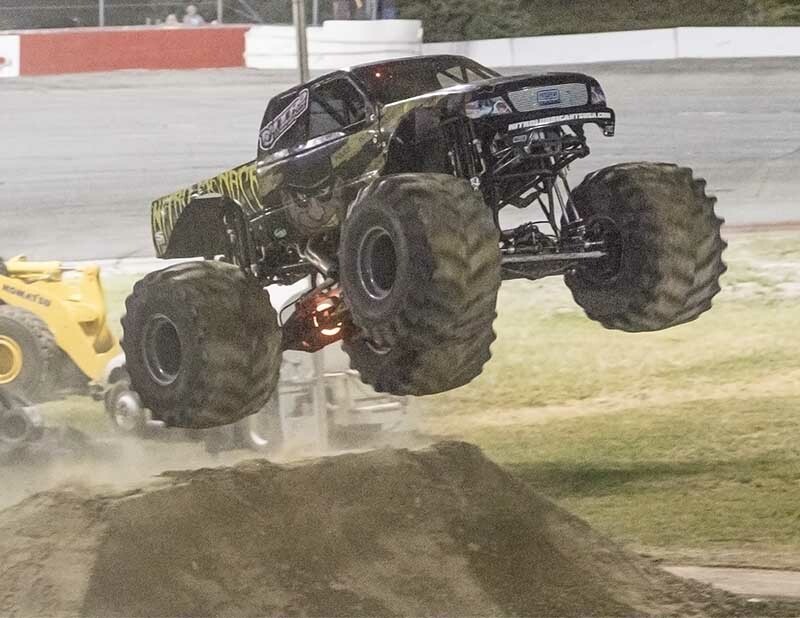 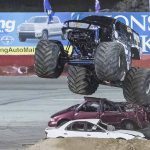 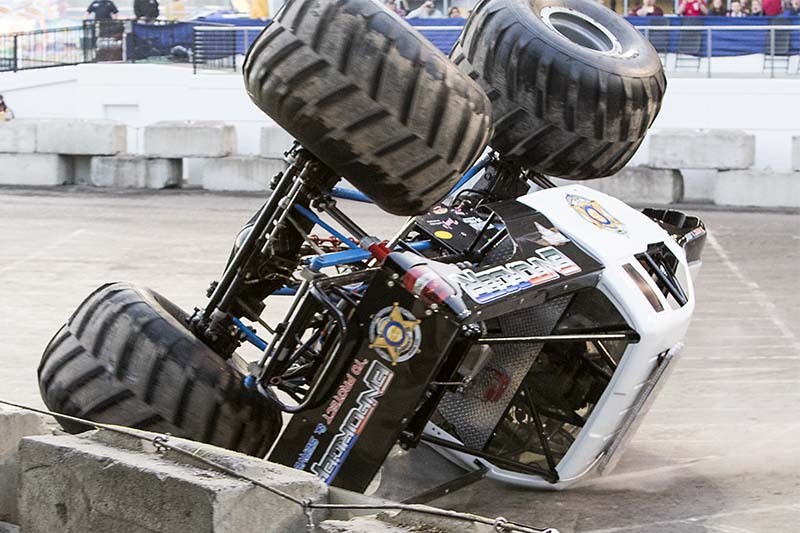 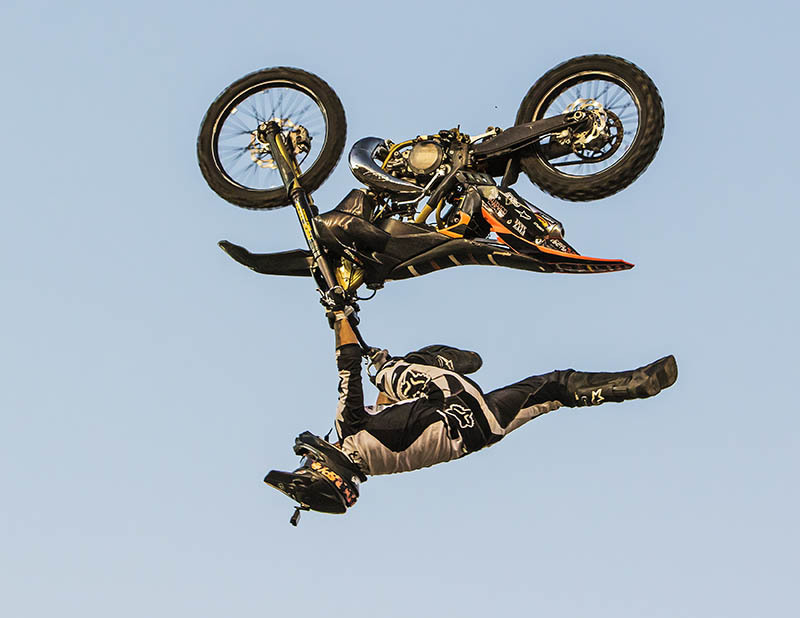 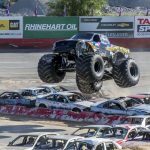 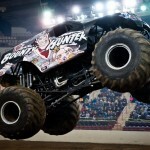 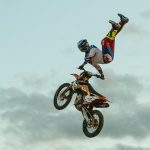 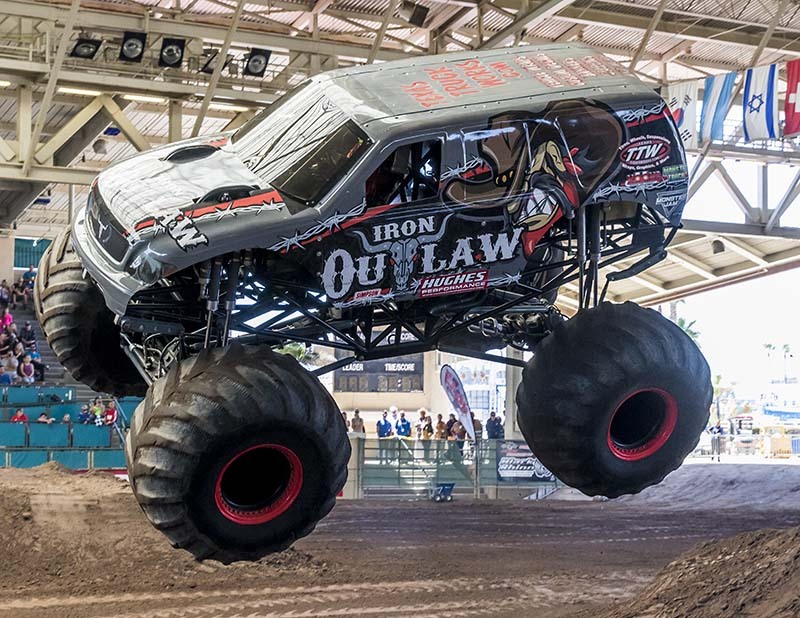 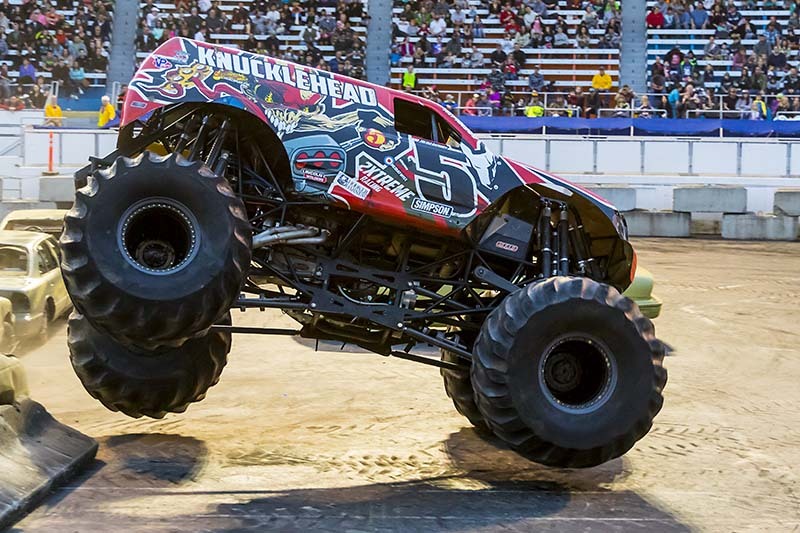 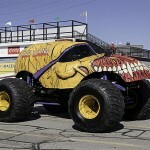 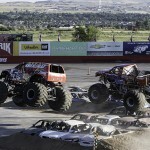 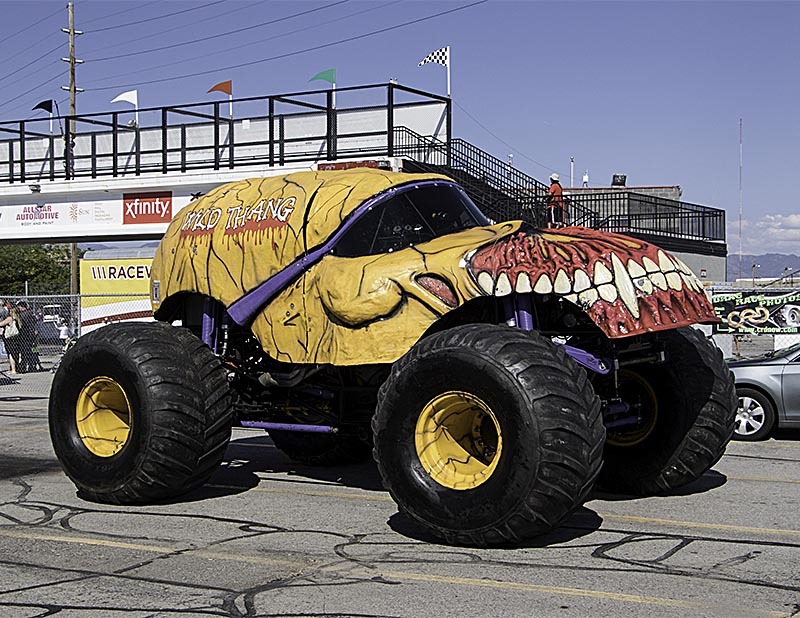 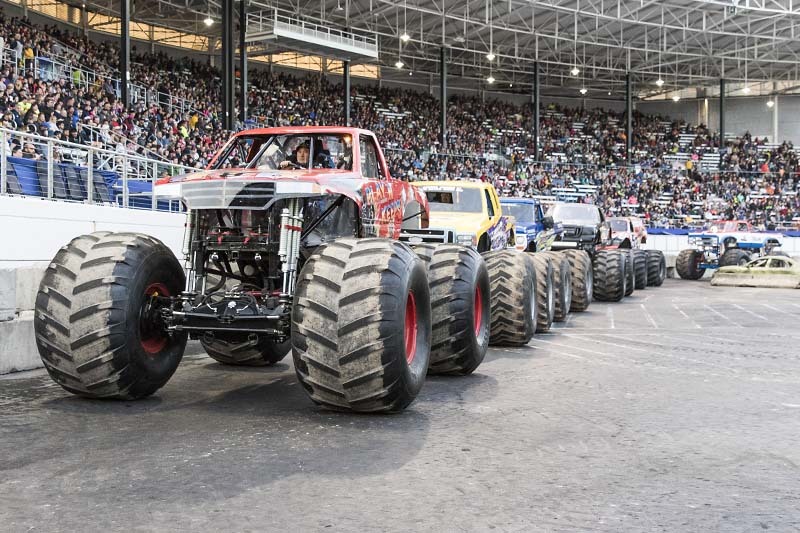 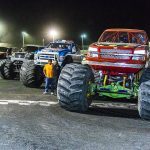 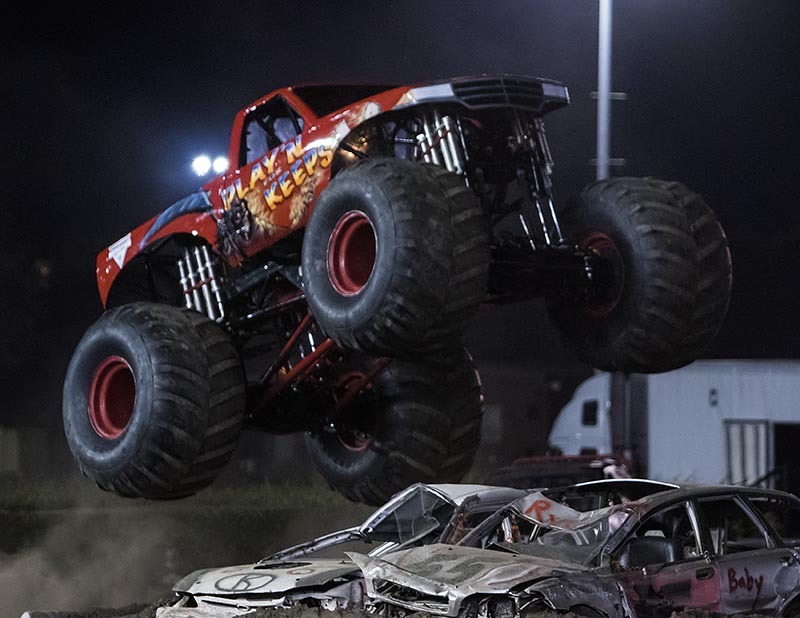 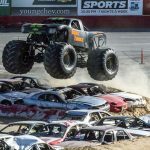 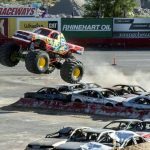 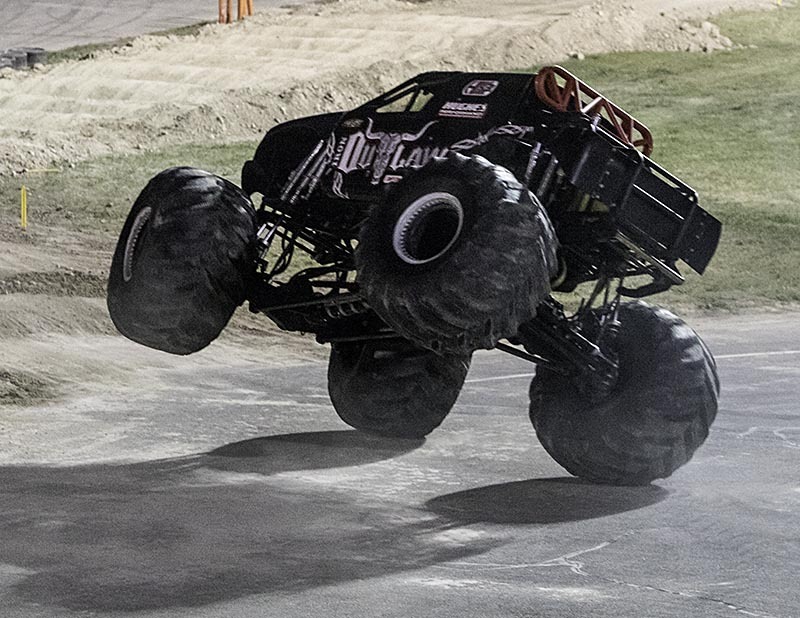 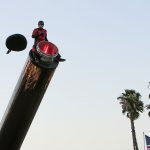 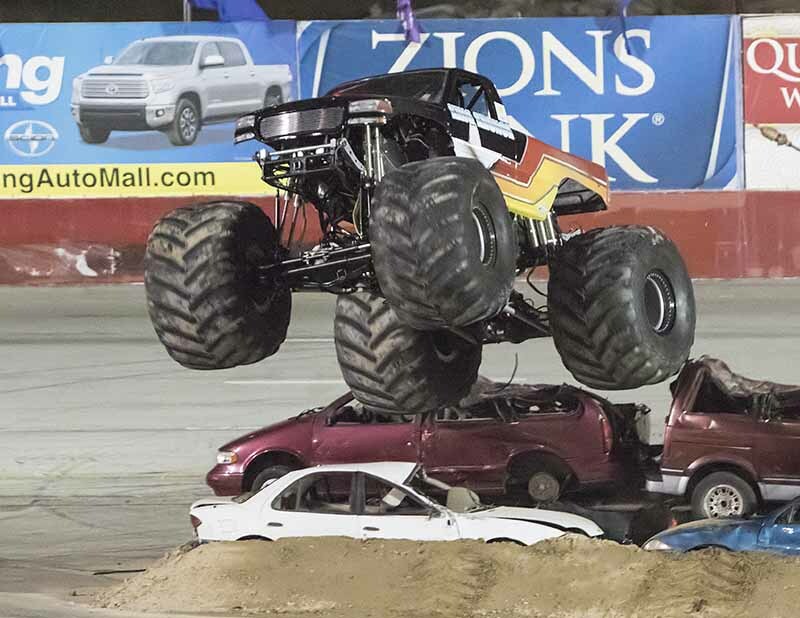 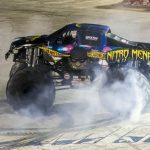 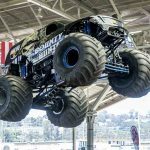 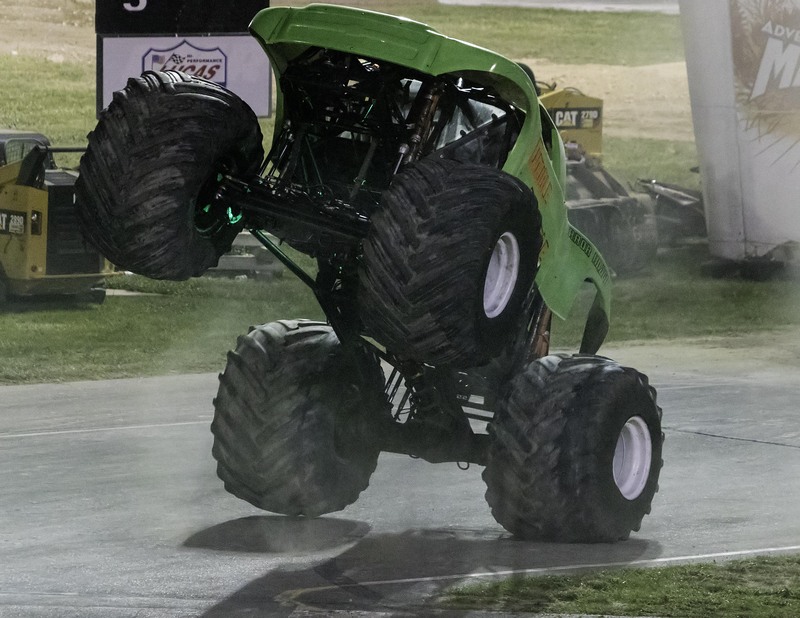 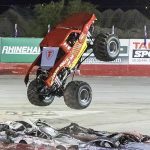 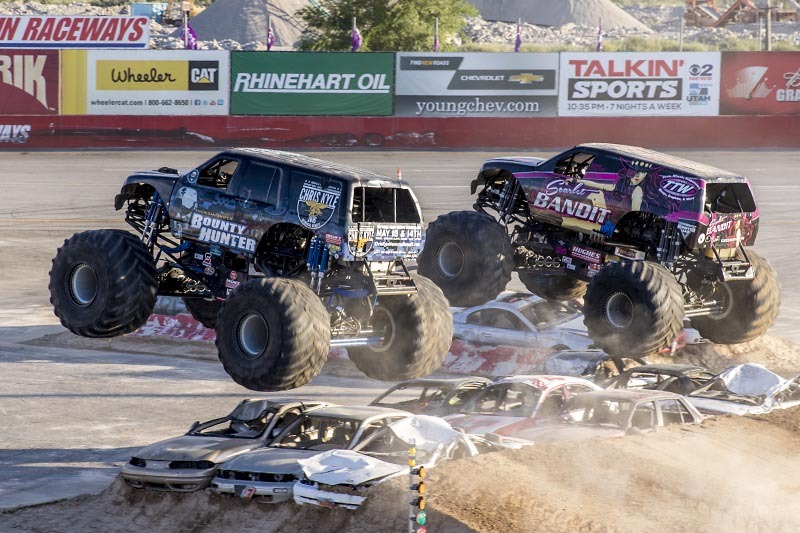 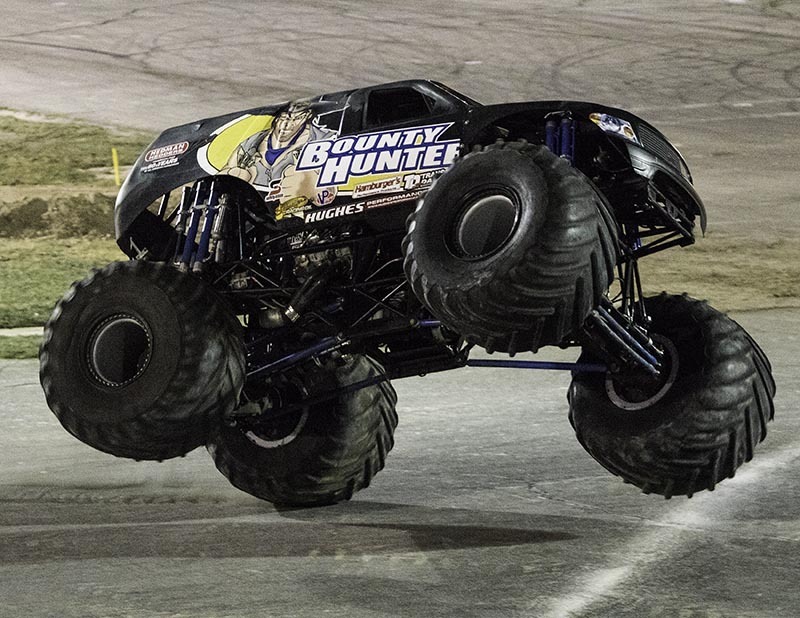 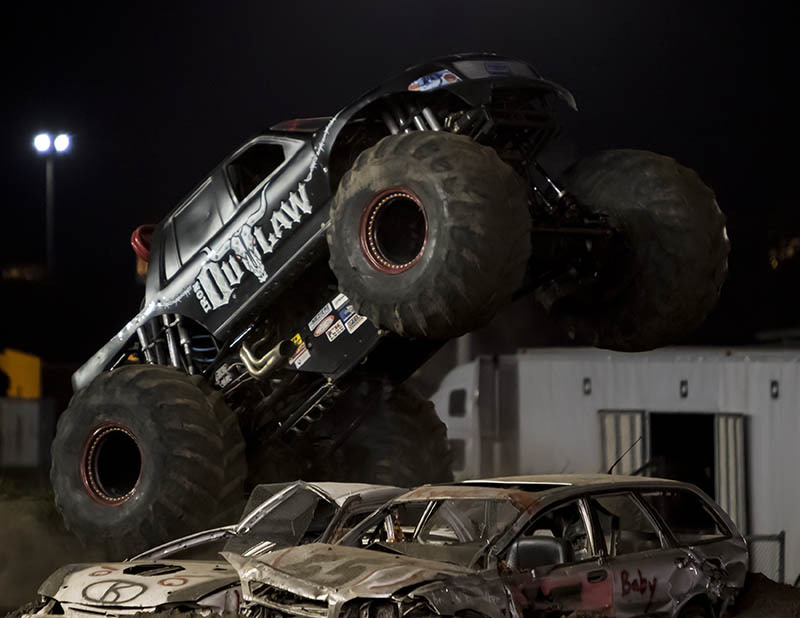 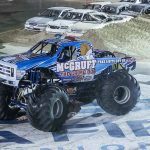 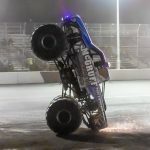 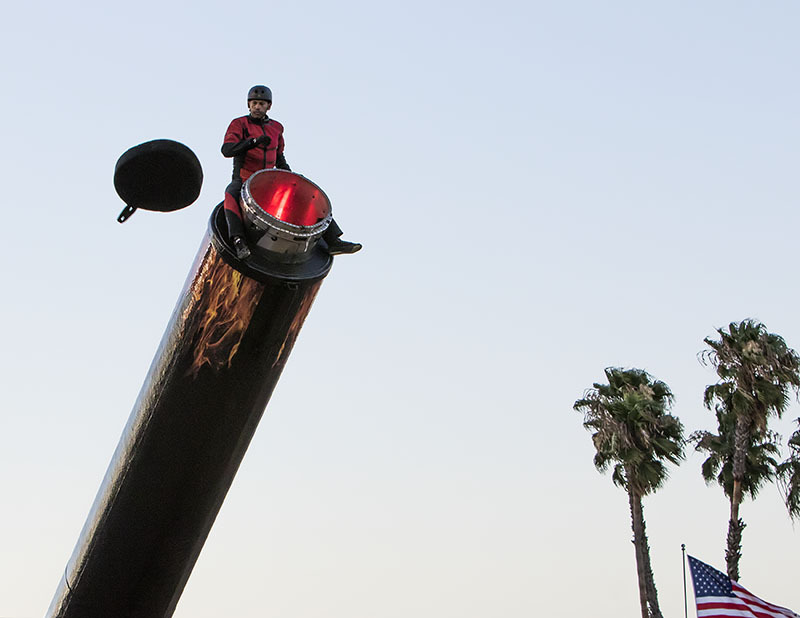 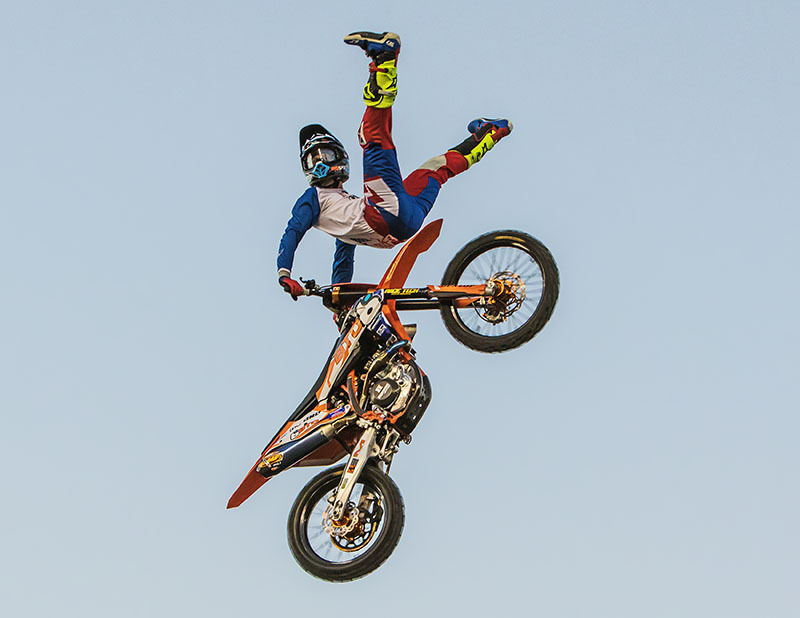 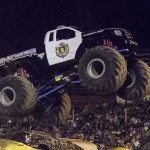 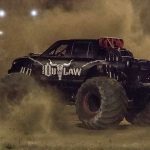 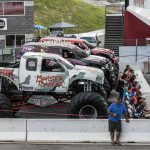 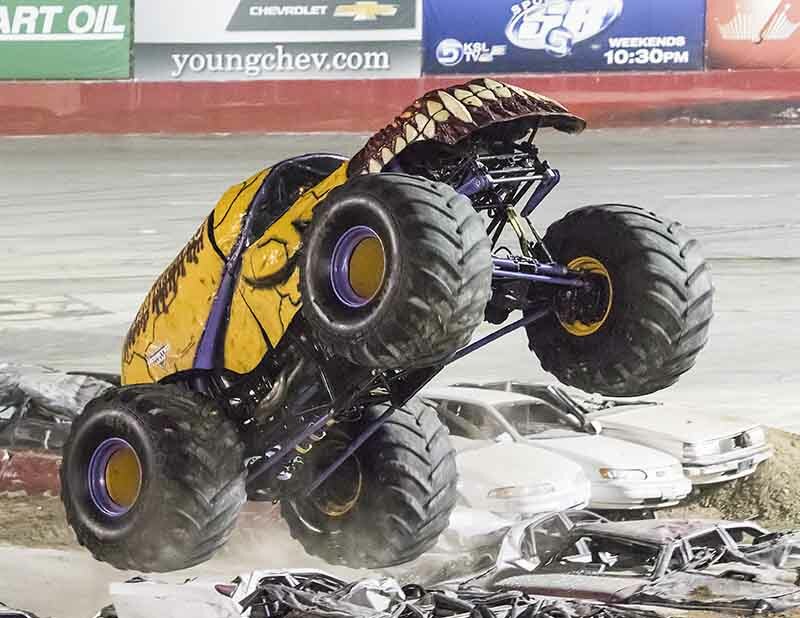 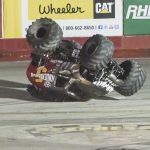 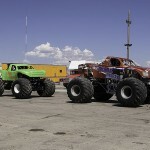 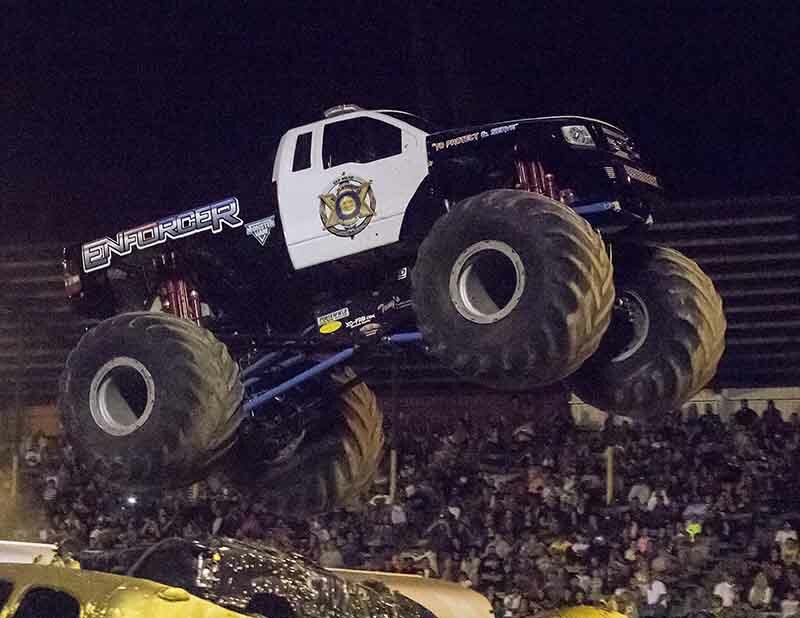 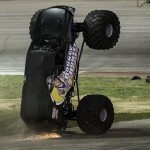 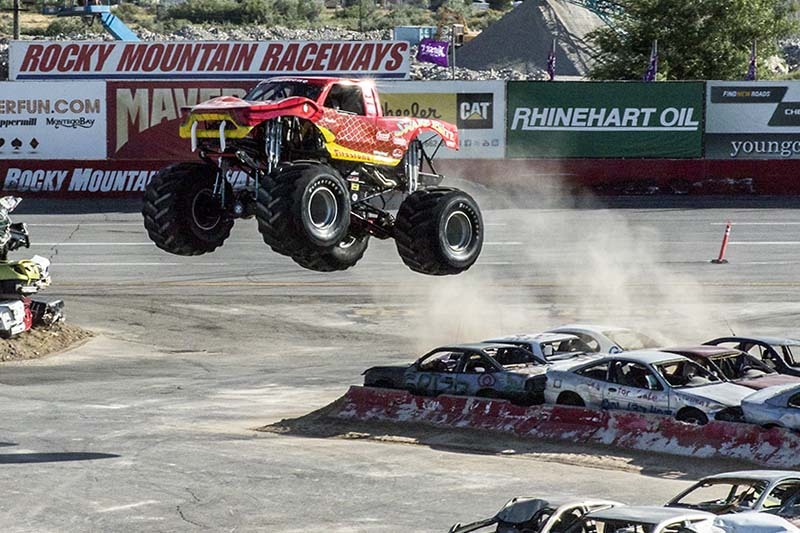 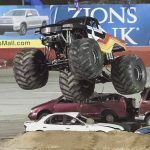 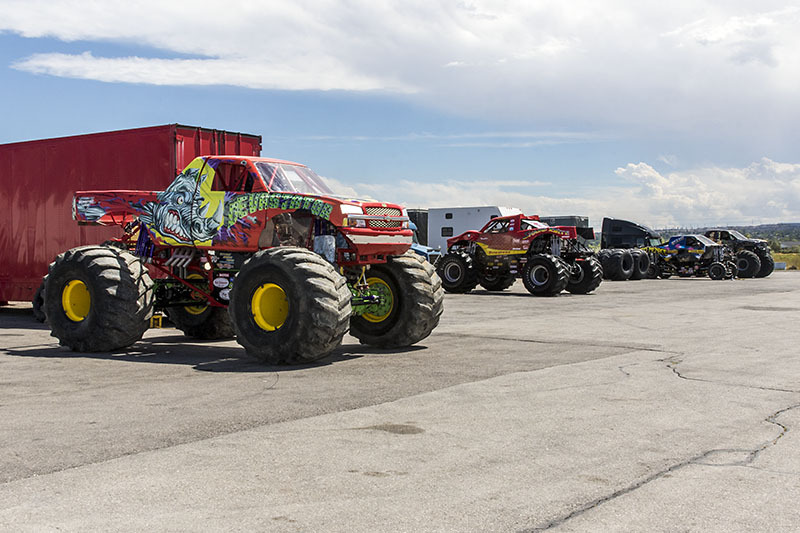 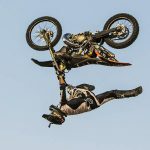 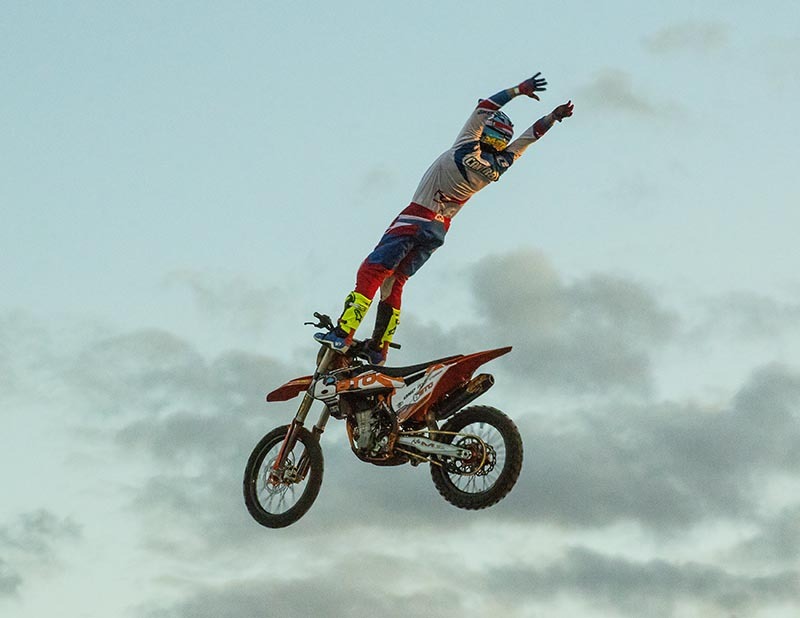 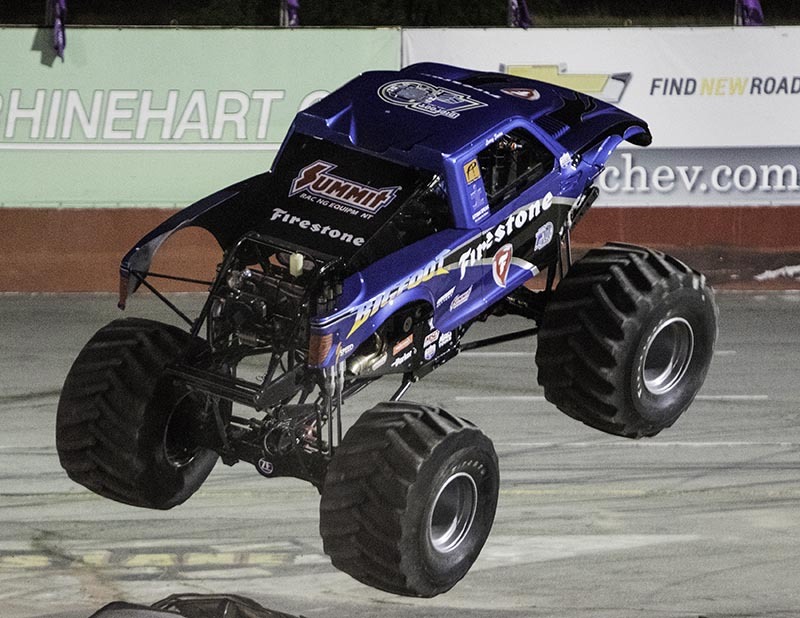 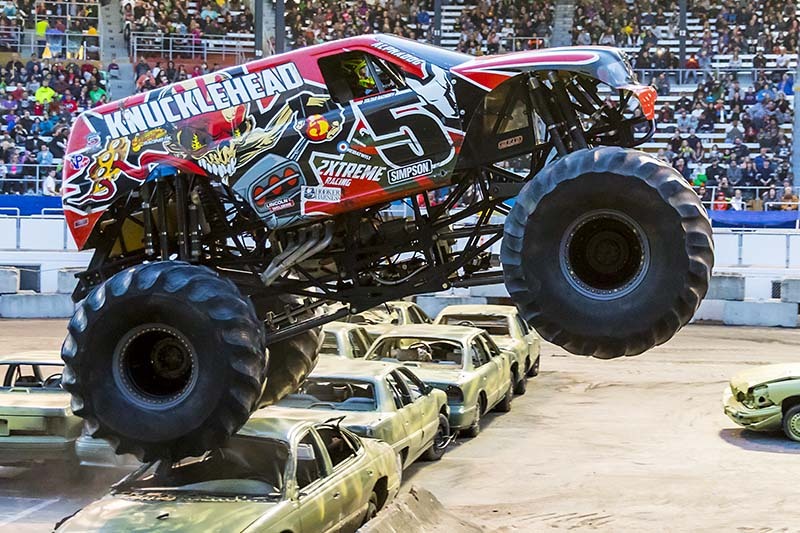 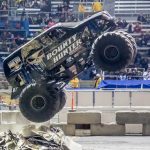 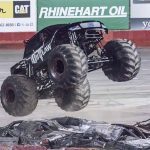 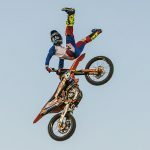 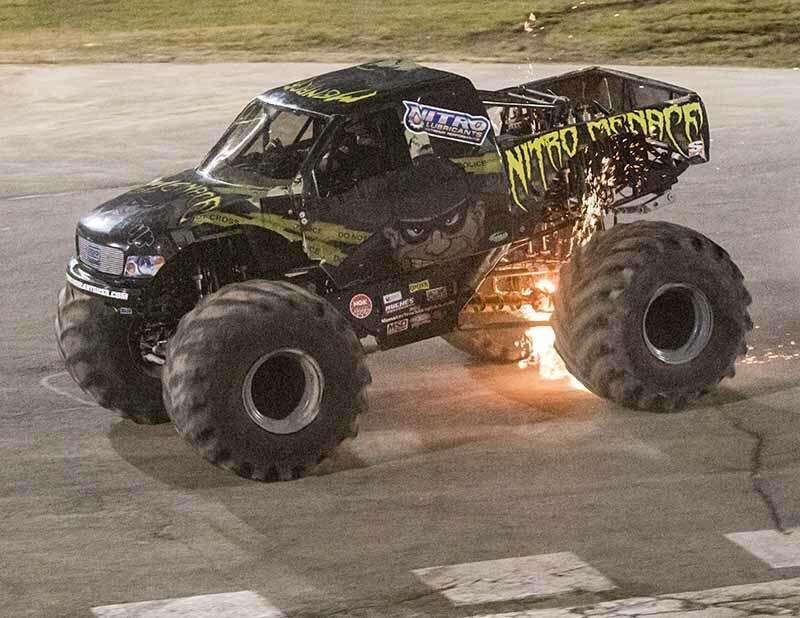 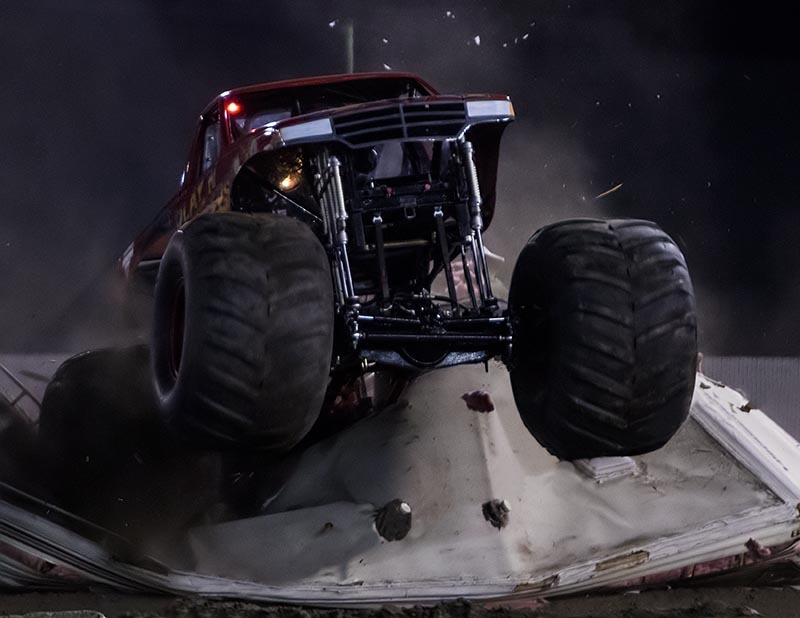 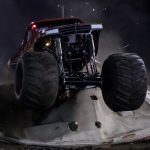 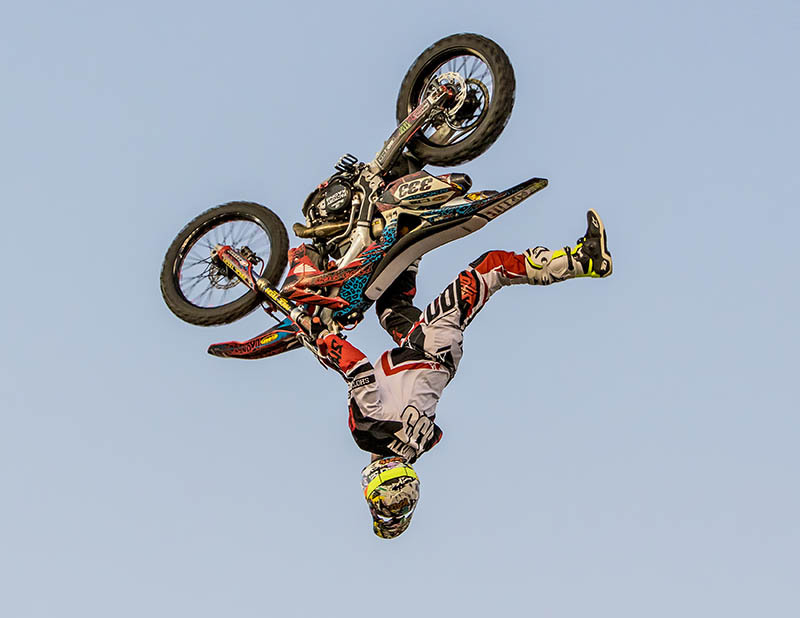 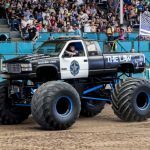 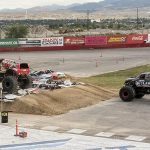 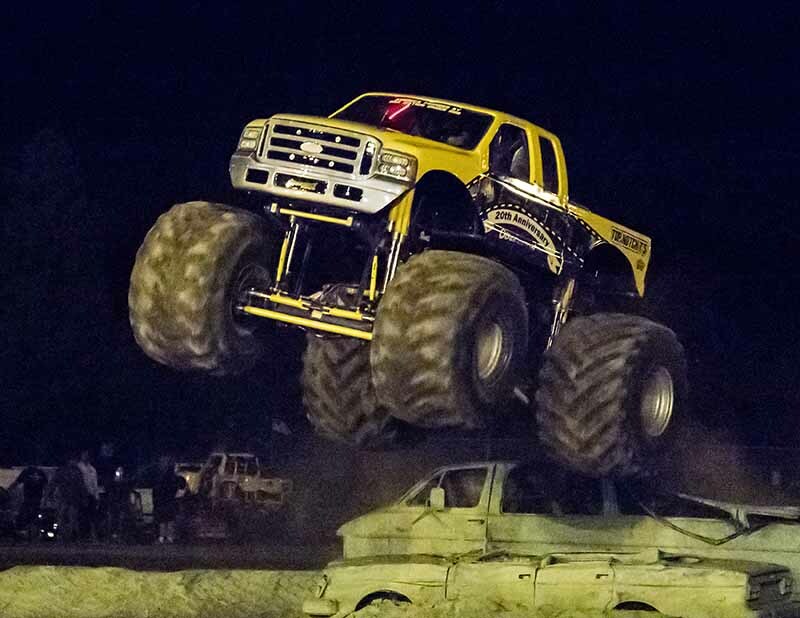 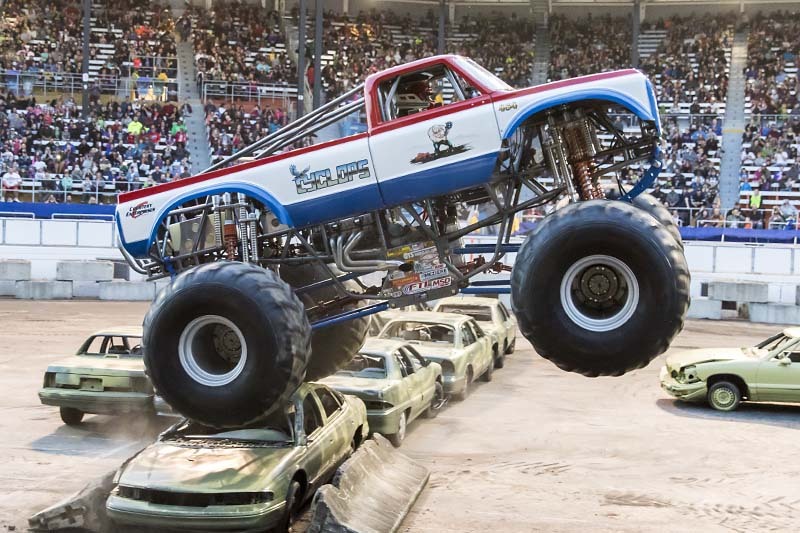 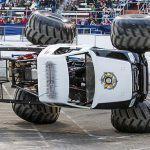 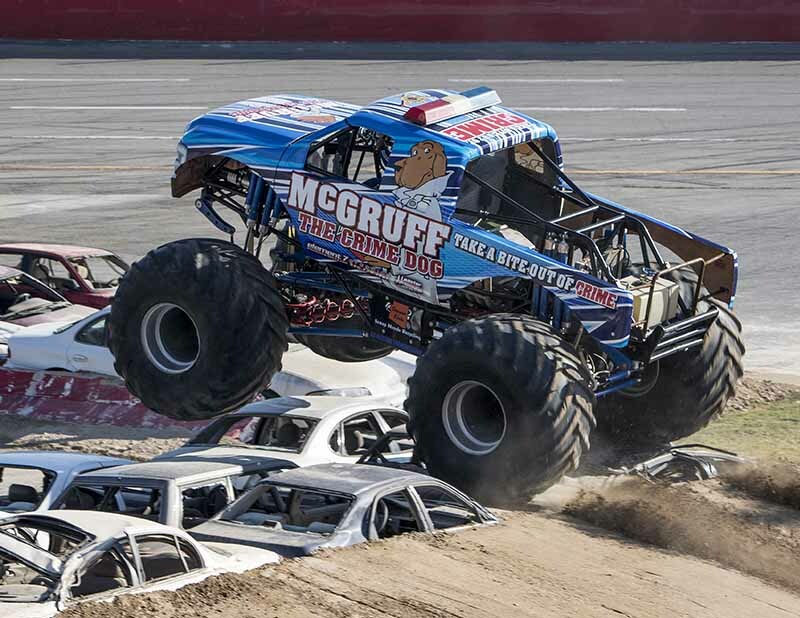 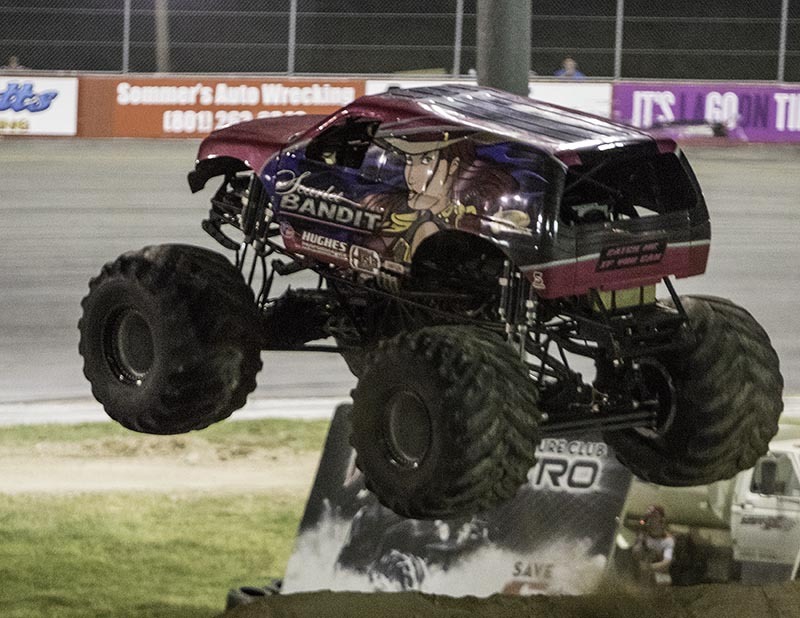 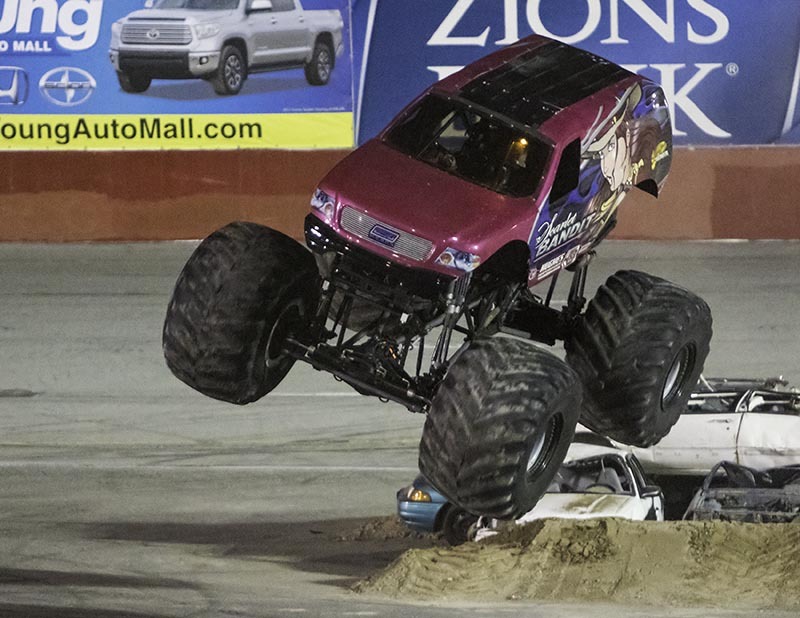 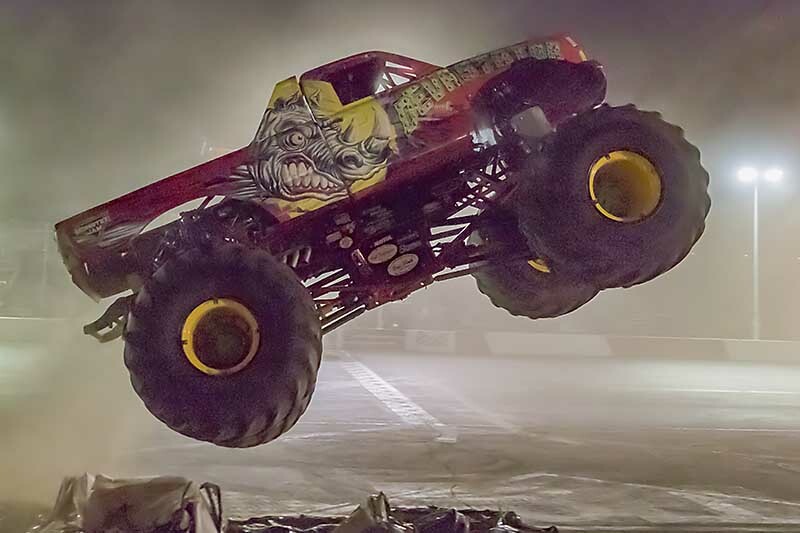 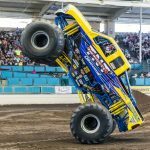 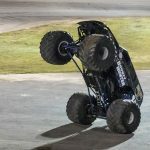 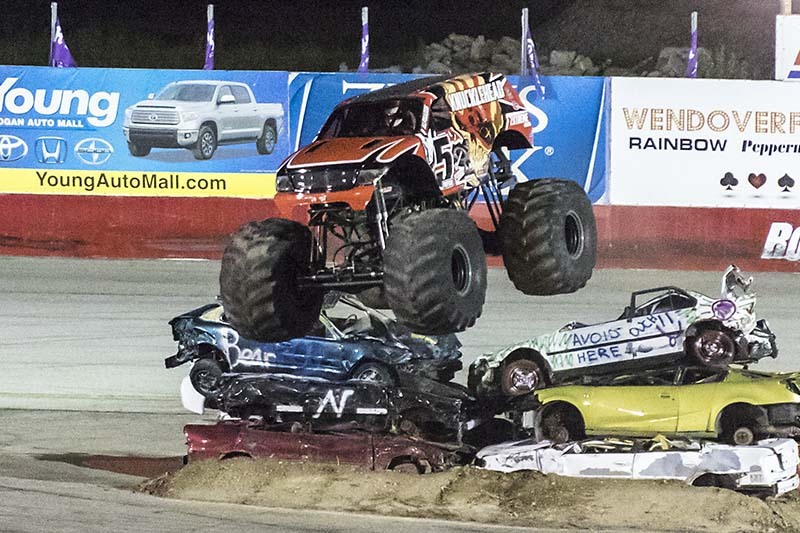 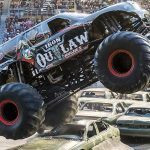 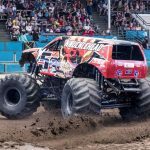 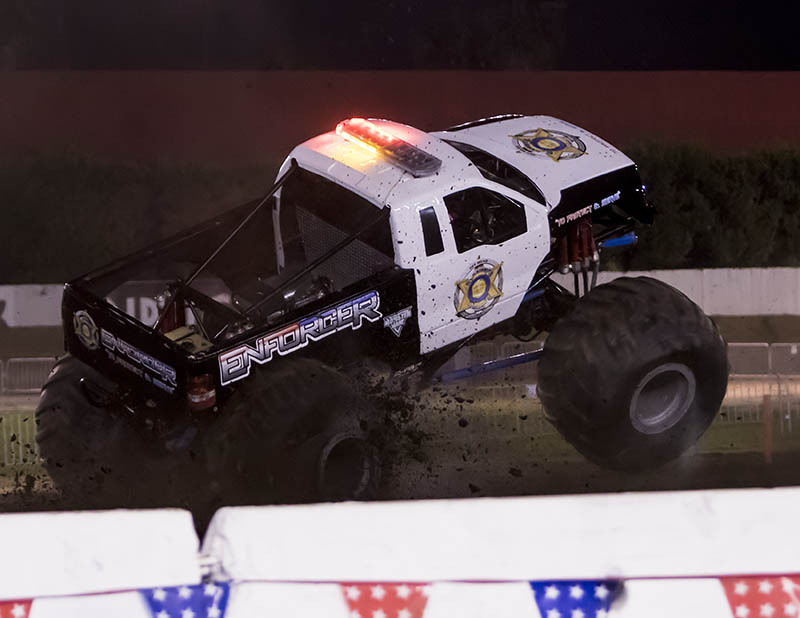 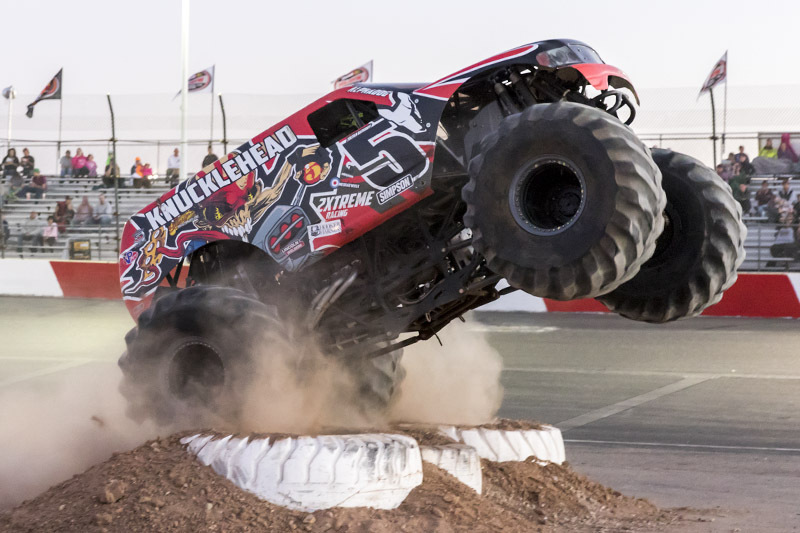 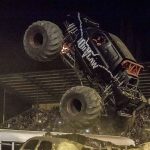 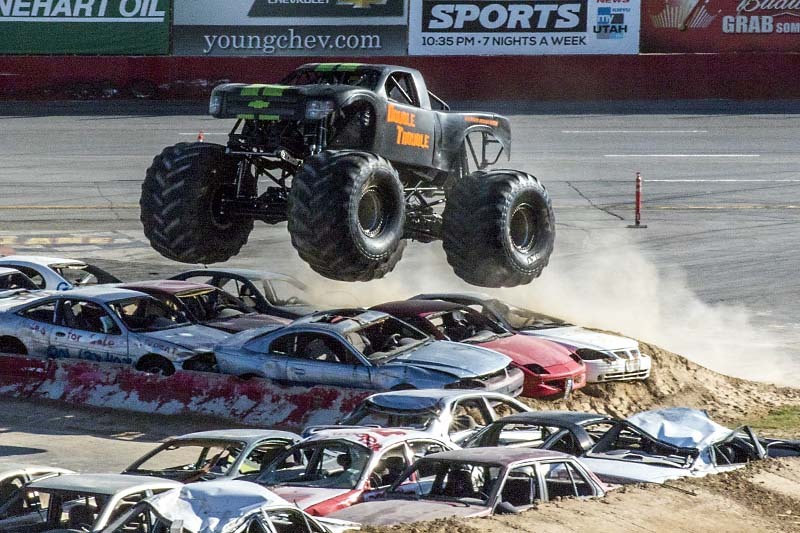 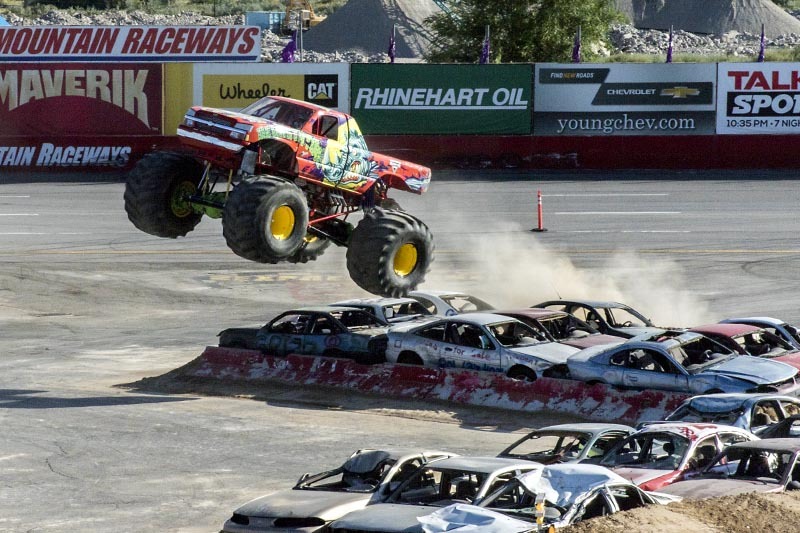 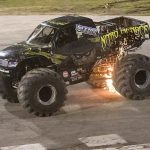 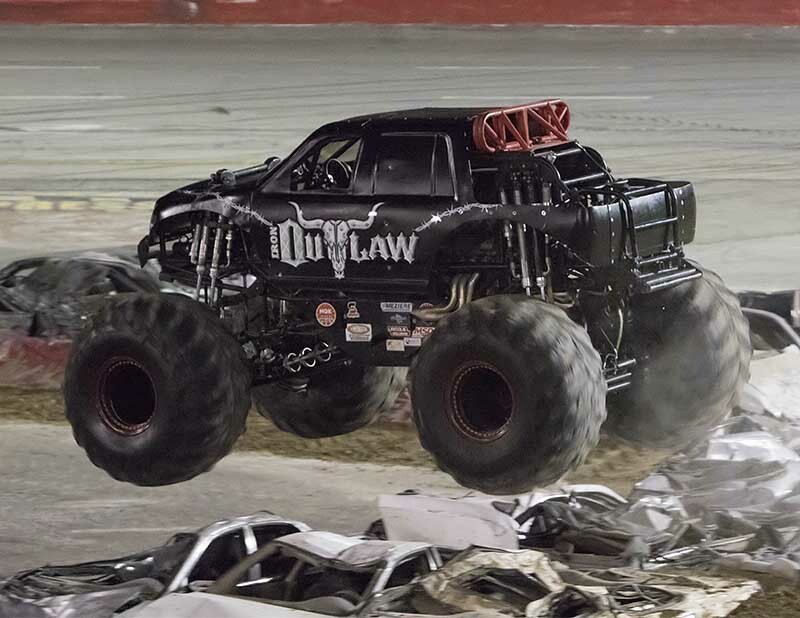 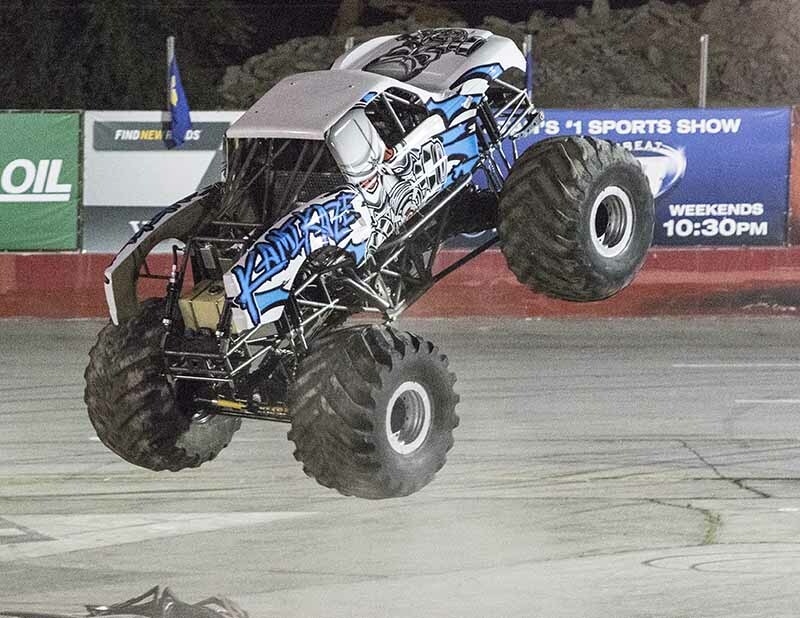 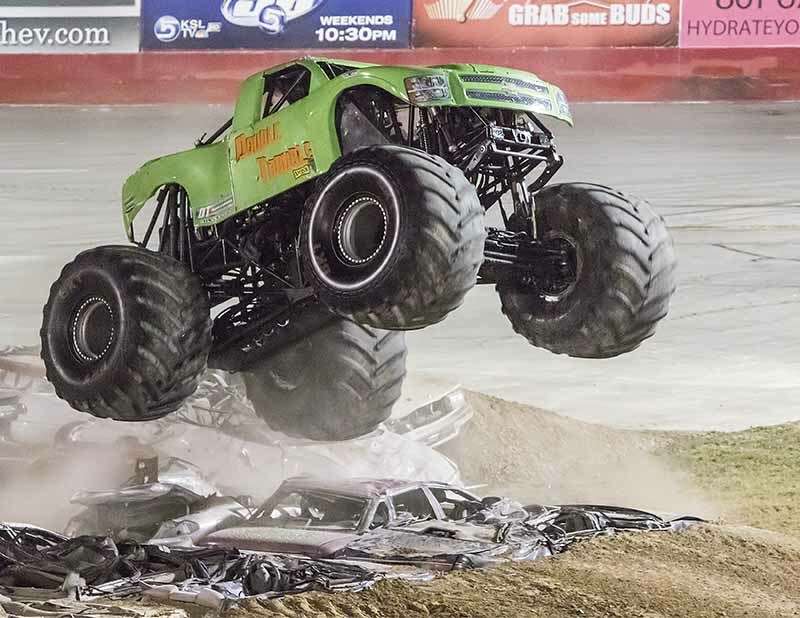 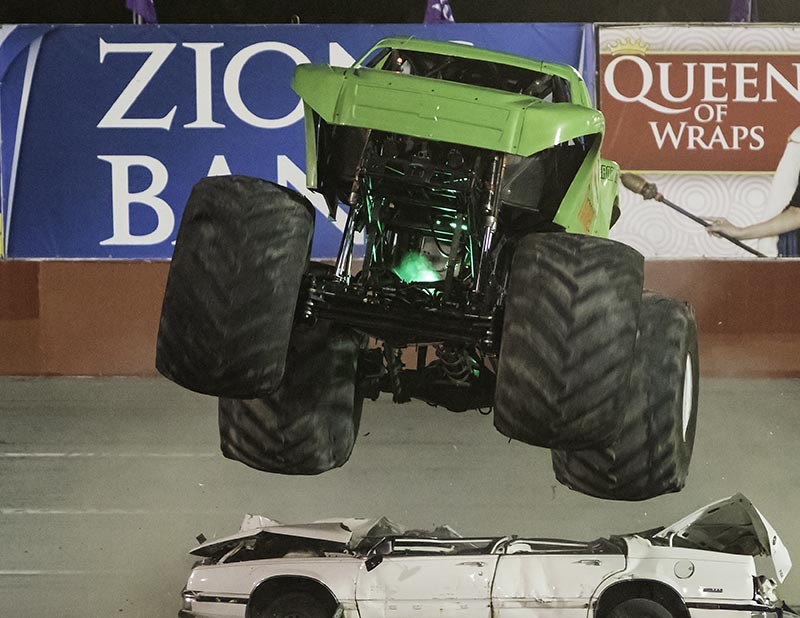 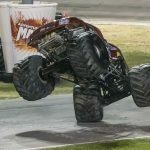 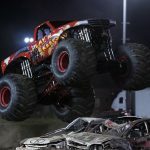 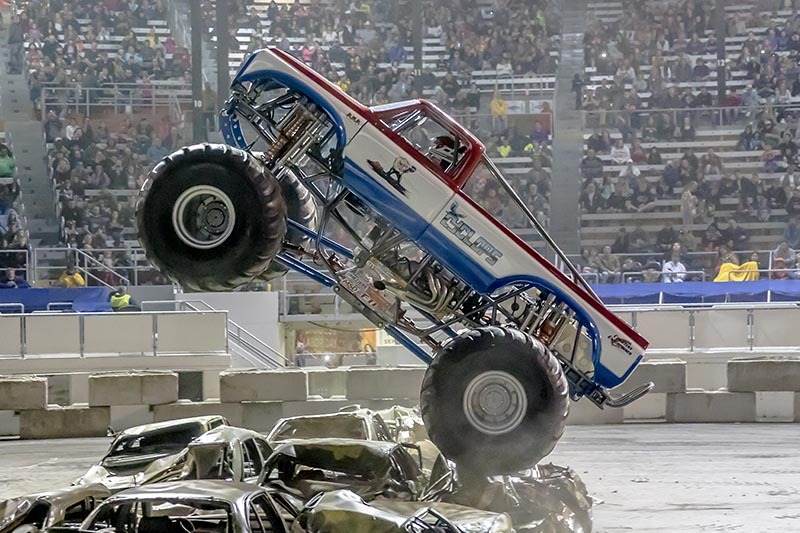 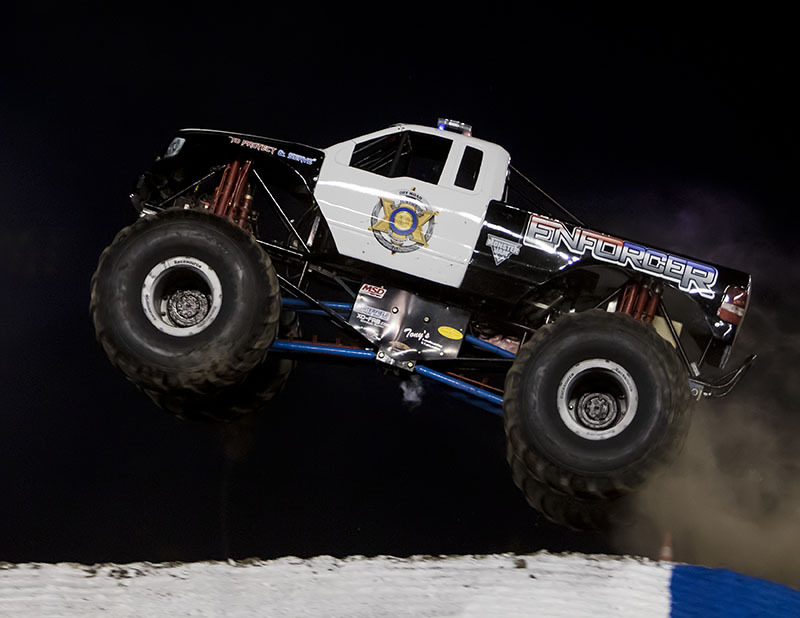 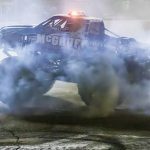 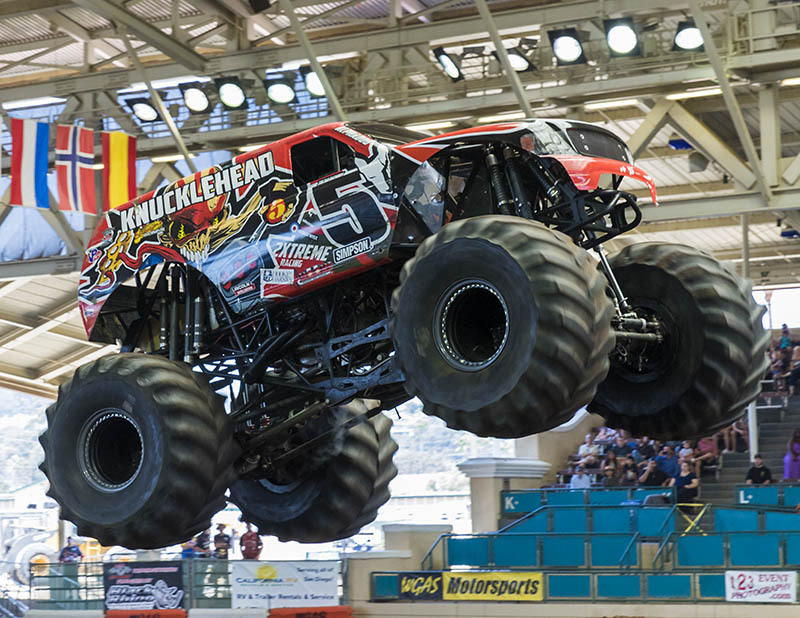 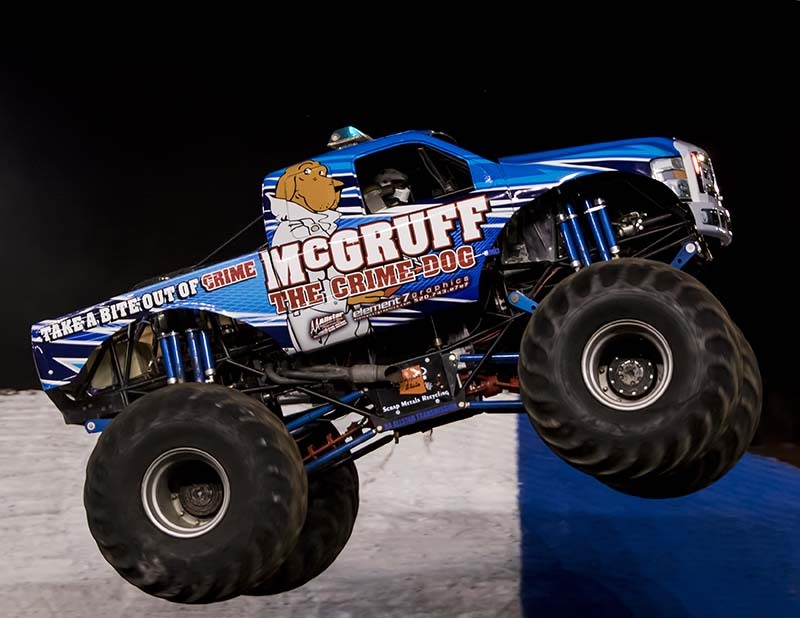 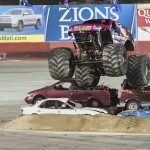 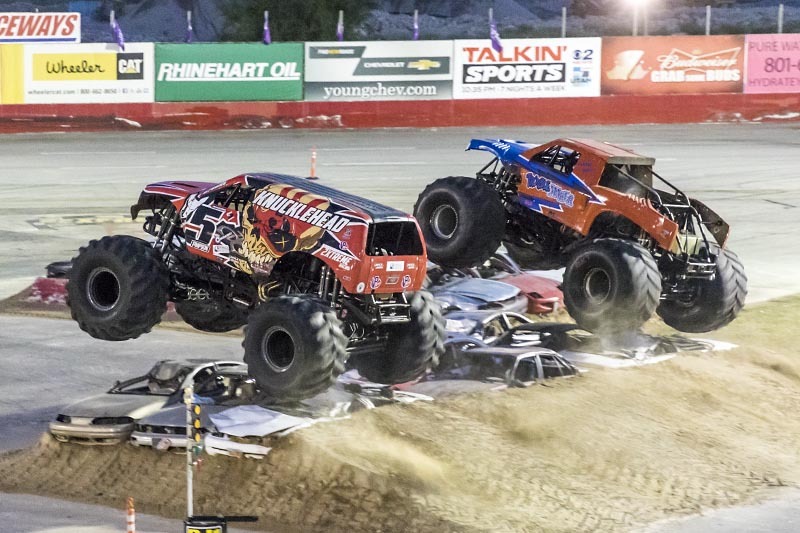 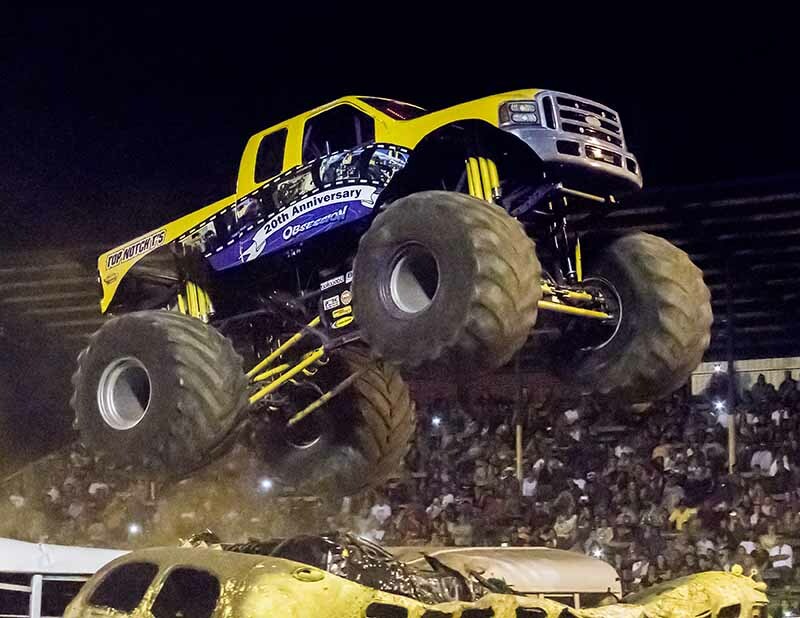 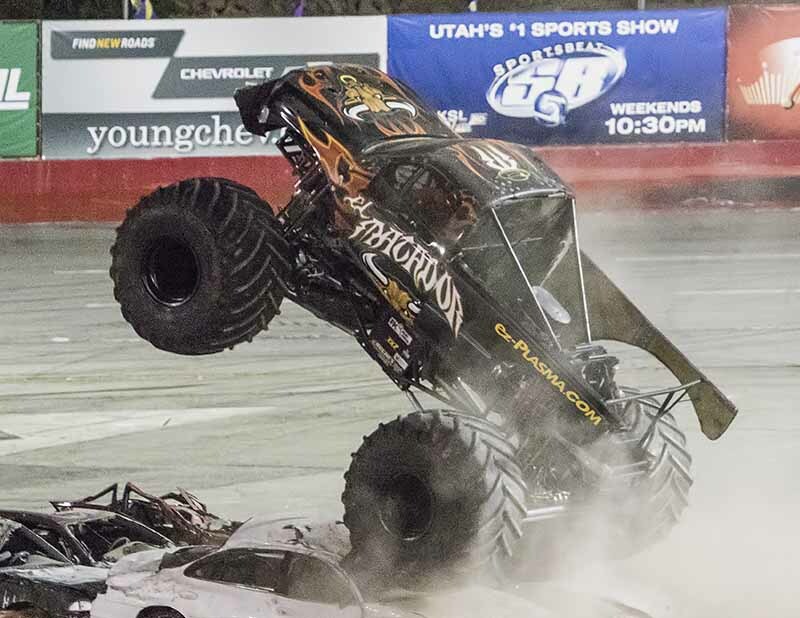 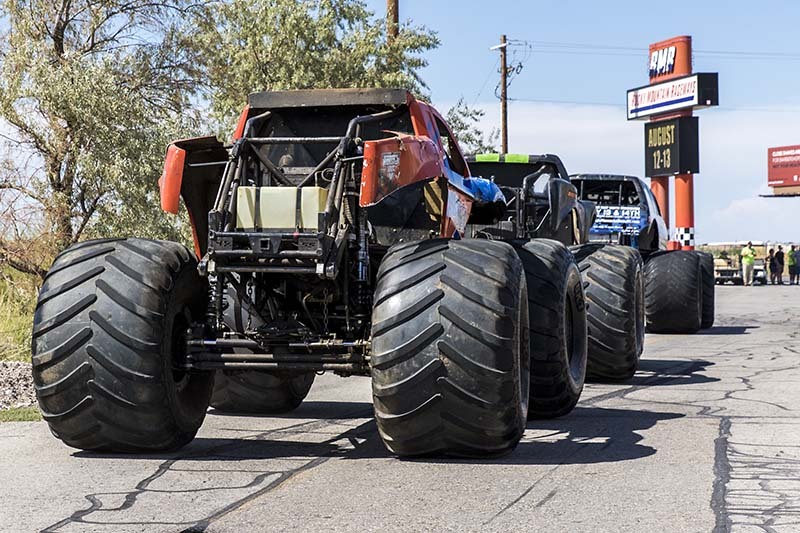 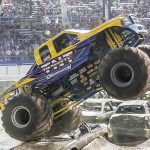 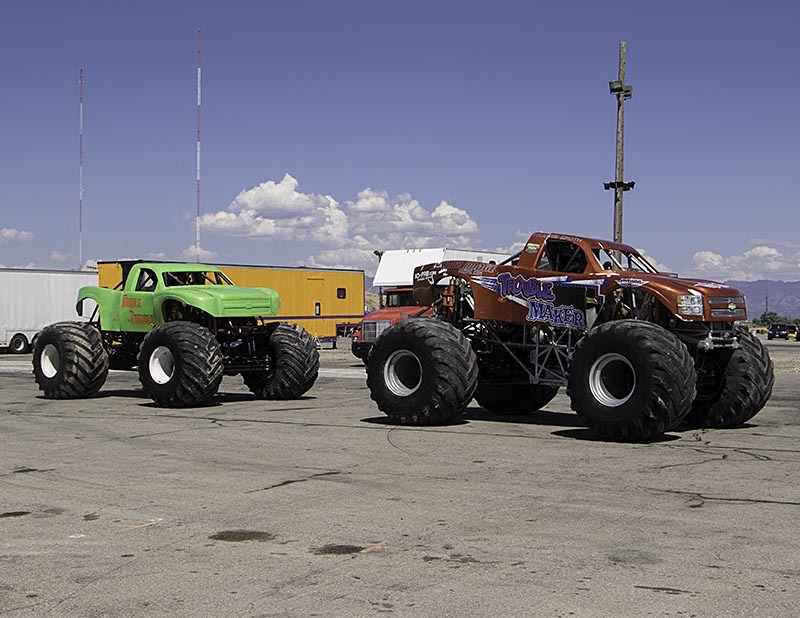 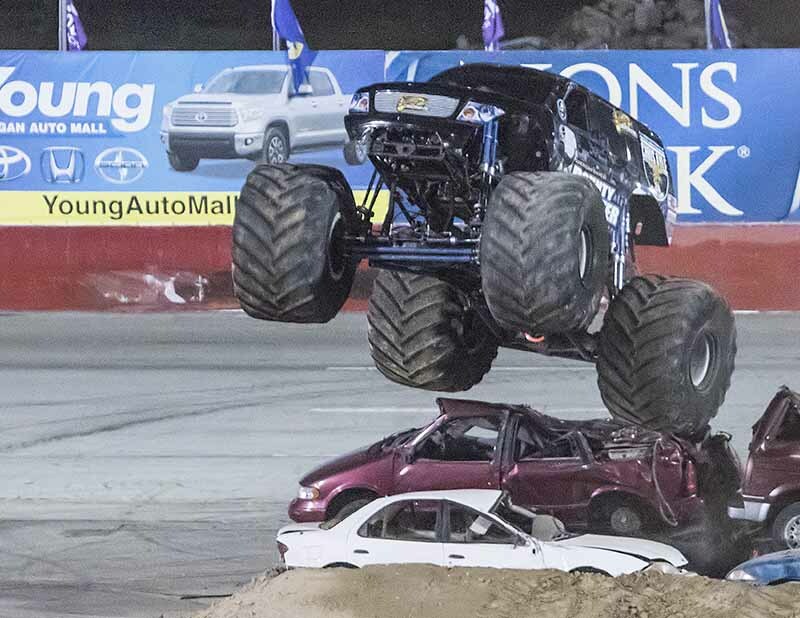 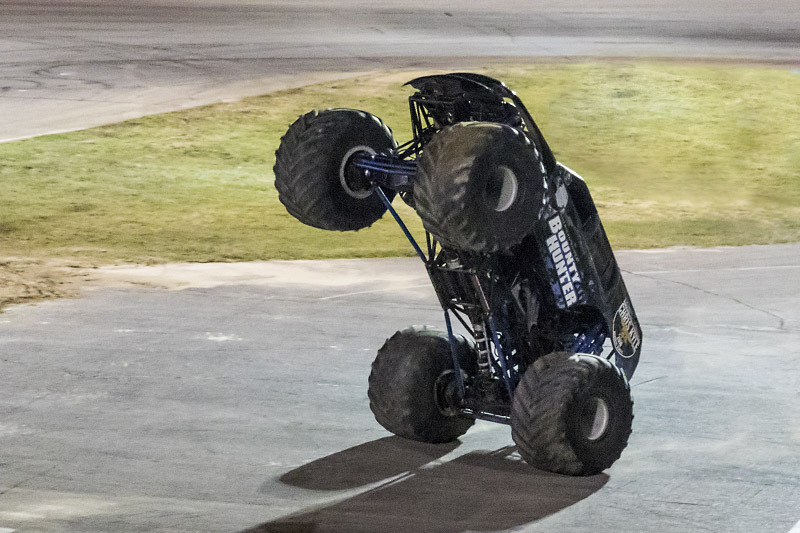 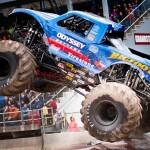 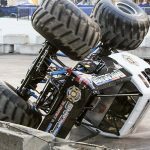 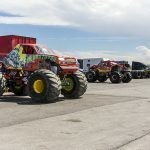 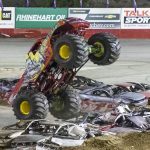 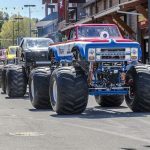 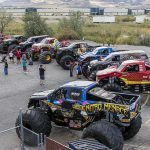 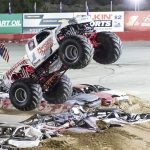 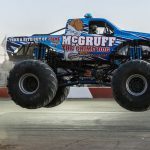 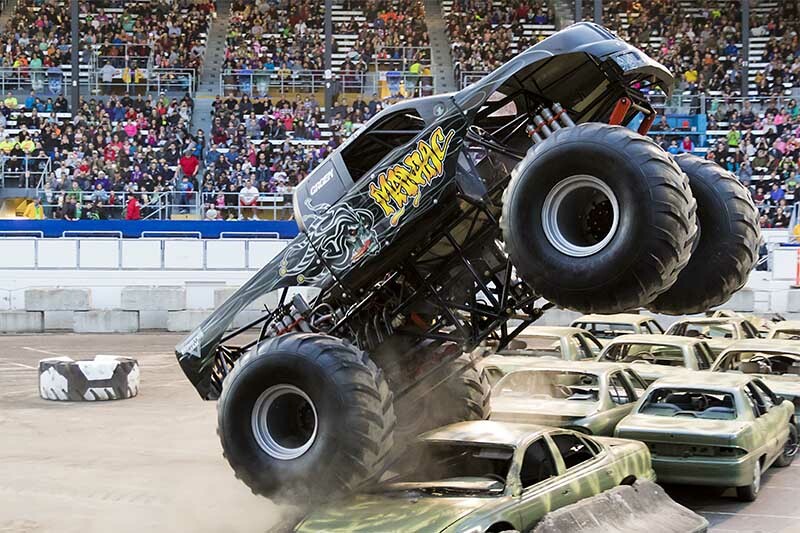 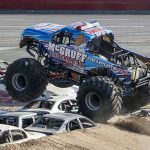 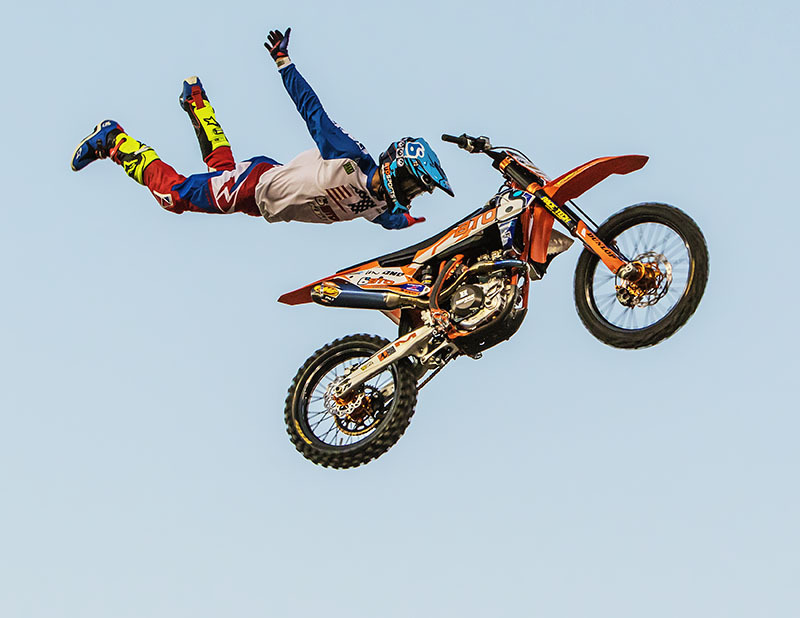 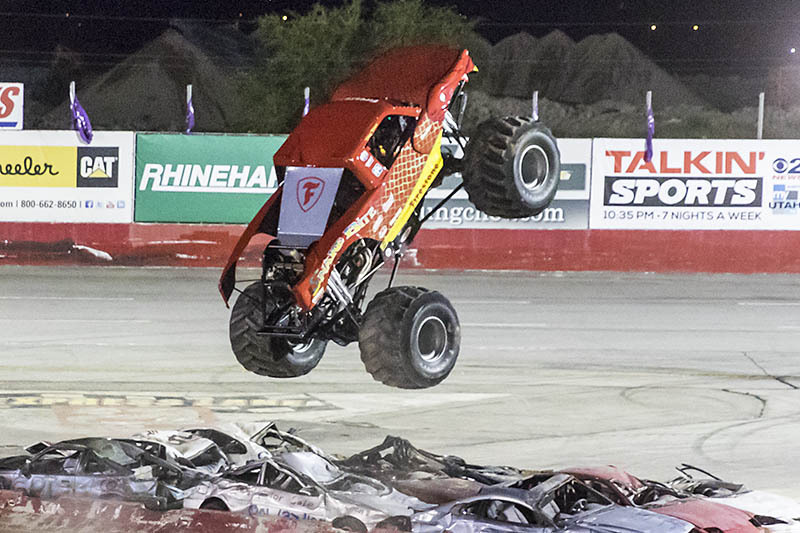 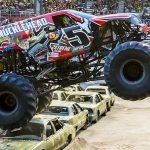 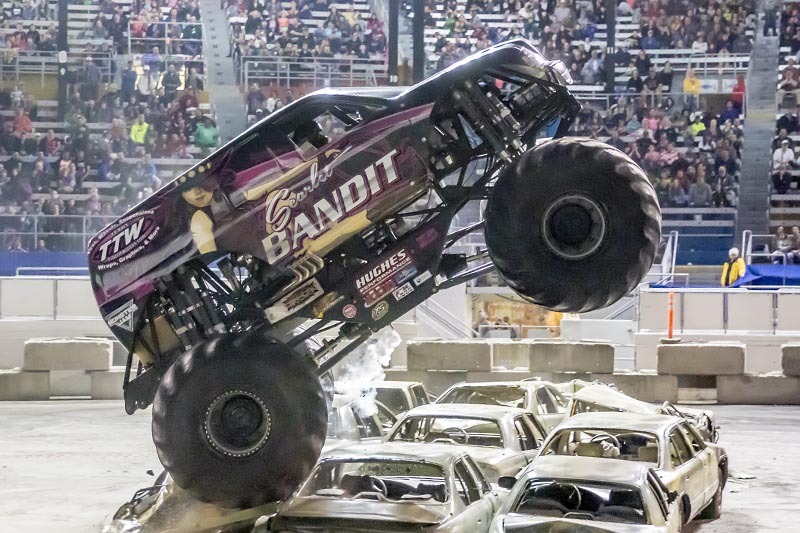 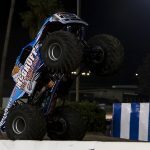 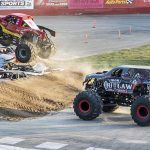 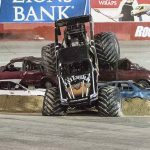 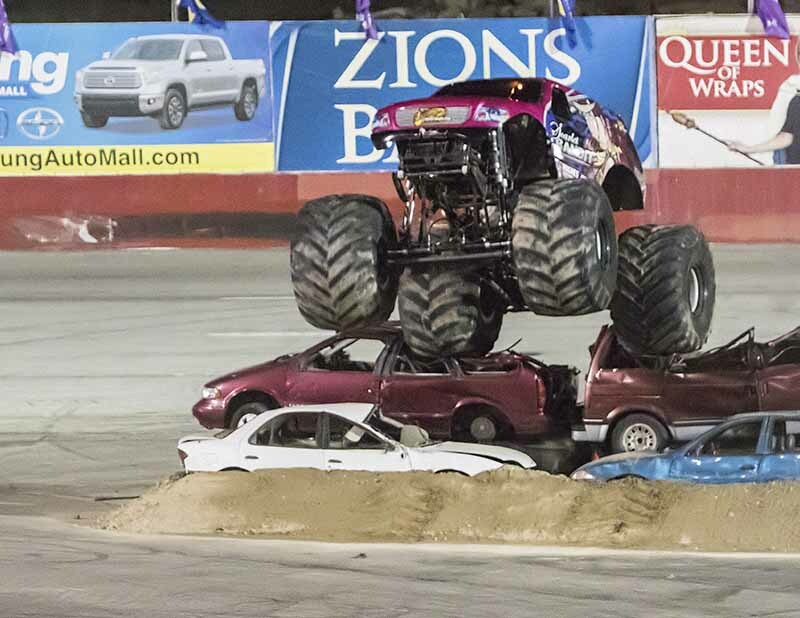 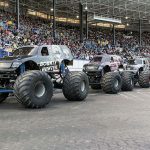 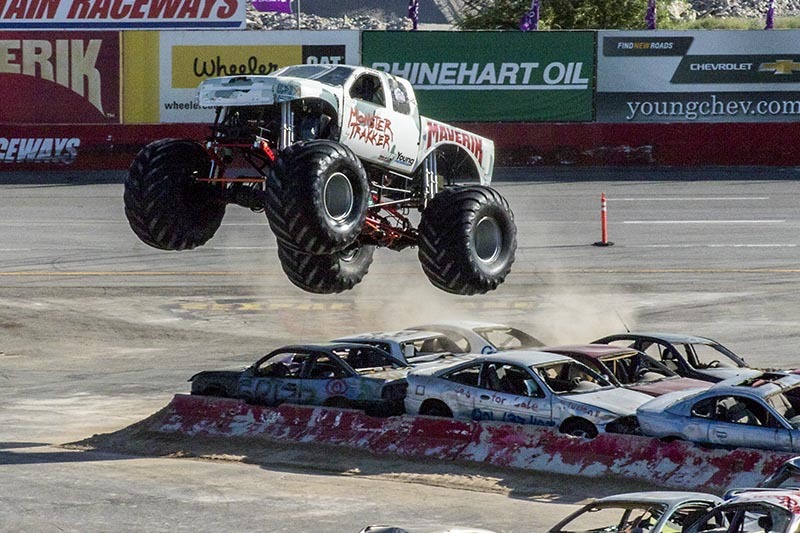 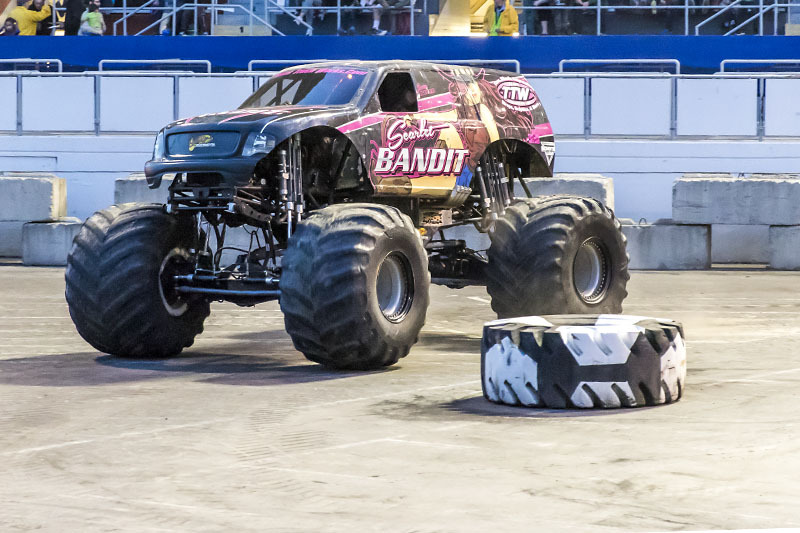 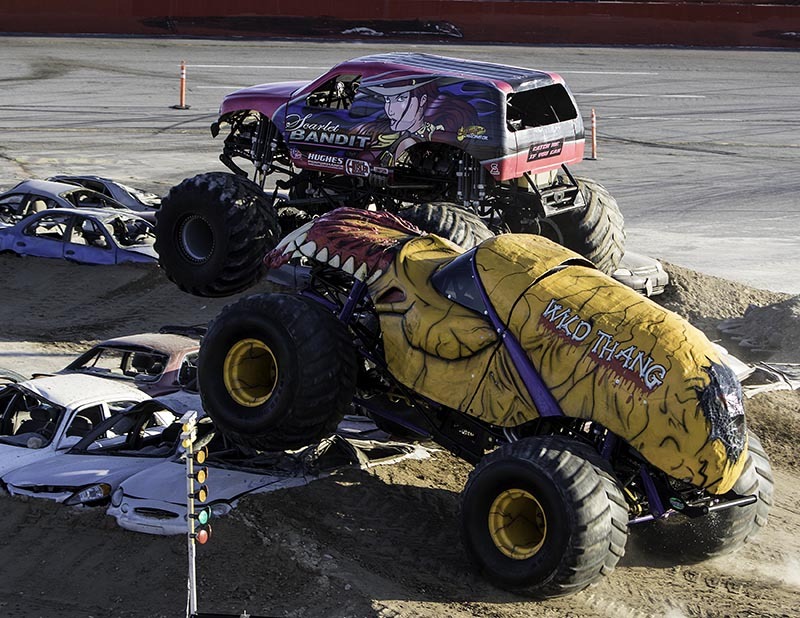 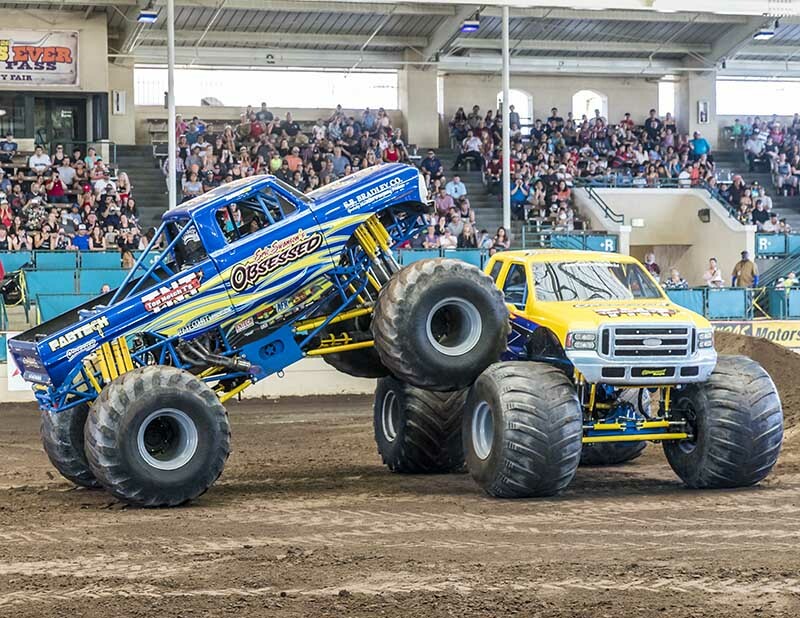 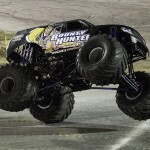 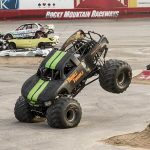 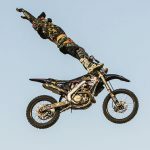 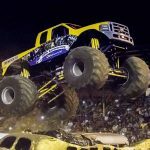 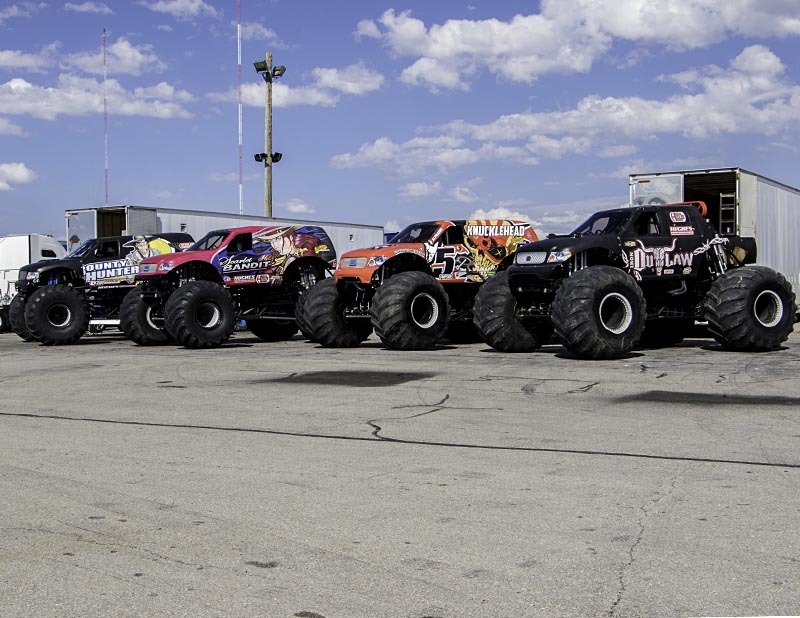 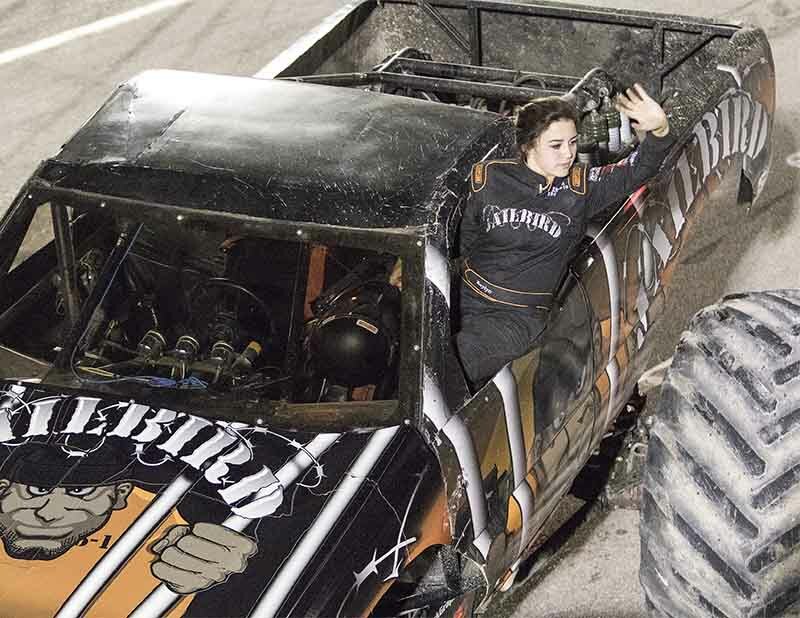 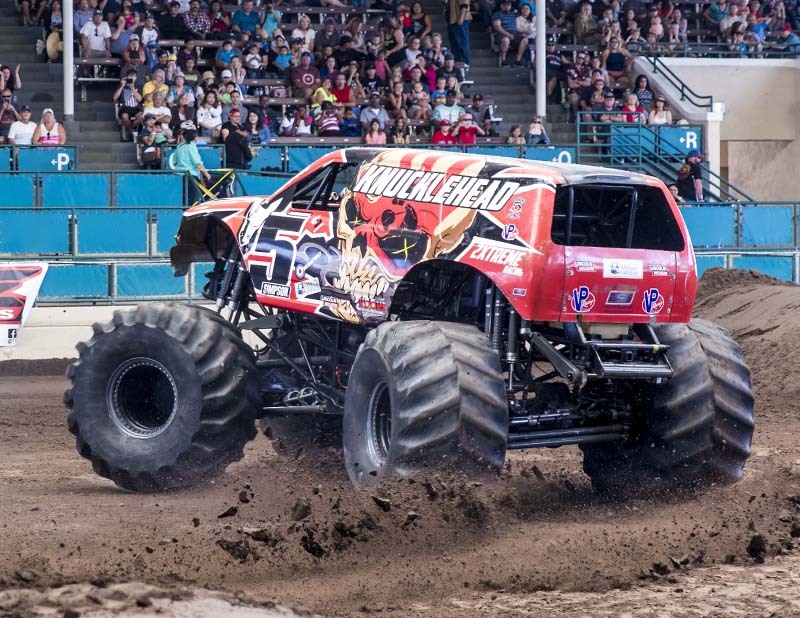 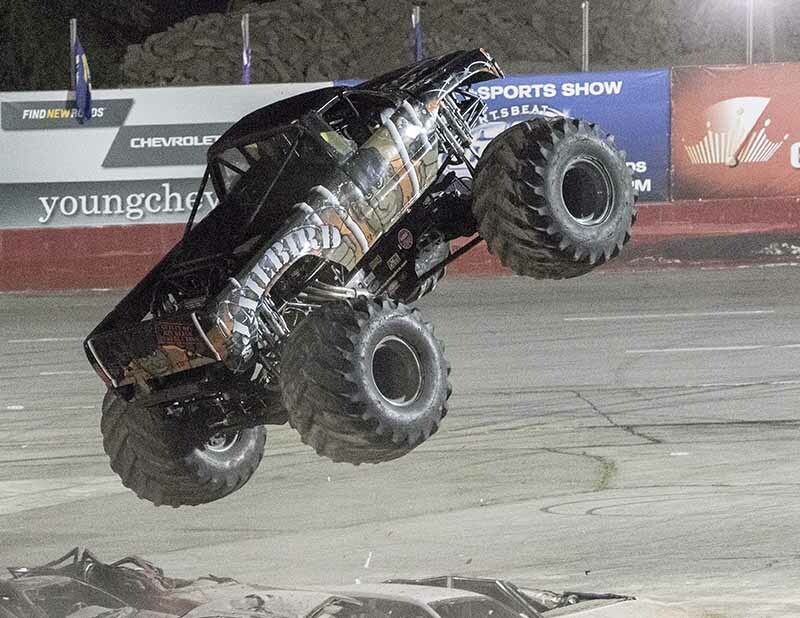 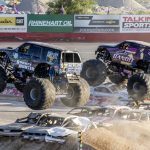 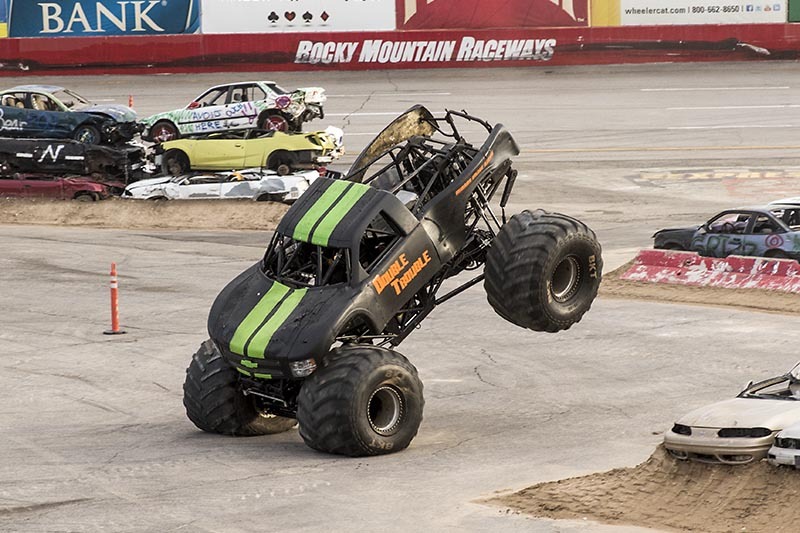 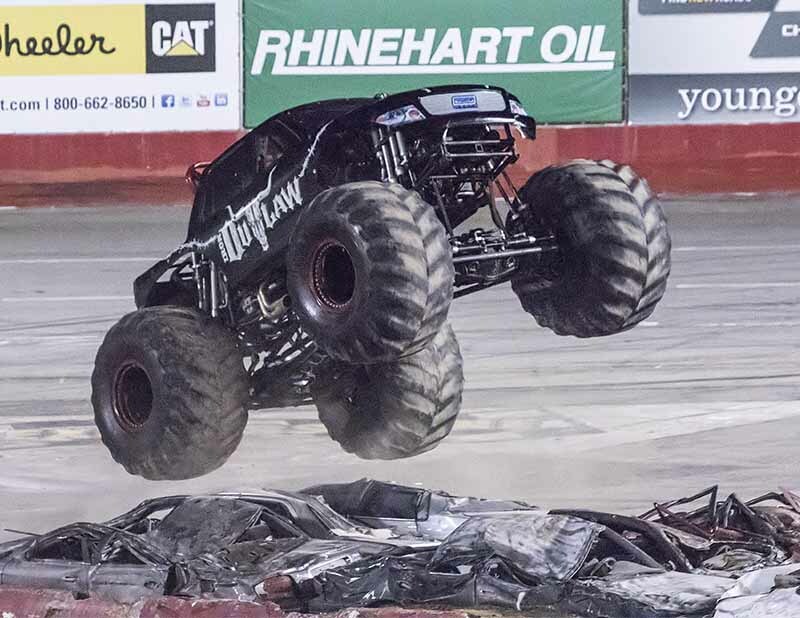 However, there was some additional noise in the air on Friday and Saturday night where seven high flying, car smashing monster trucks arrived to do battle in bus munching, donut spinning freestyle. 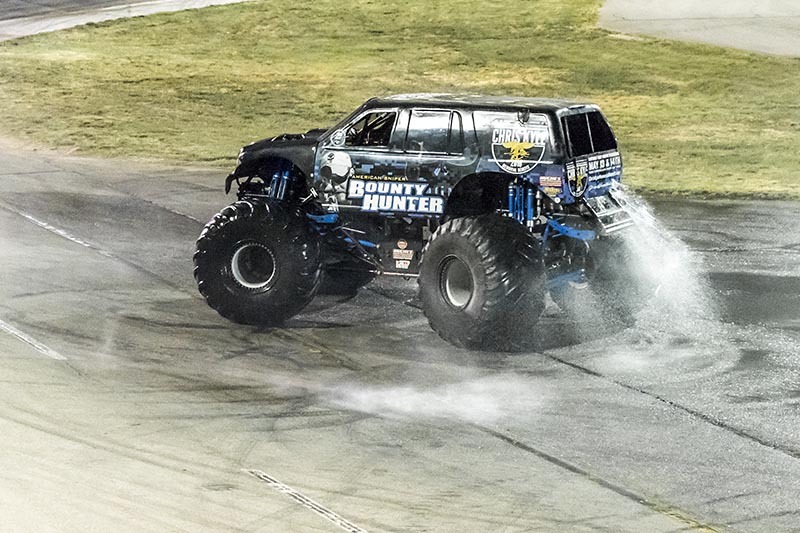 Making the trip from Tonganoxie, Kansas were Jimmy Creten and Bounty Hunter. 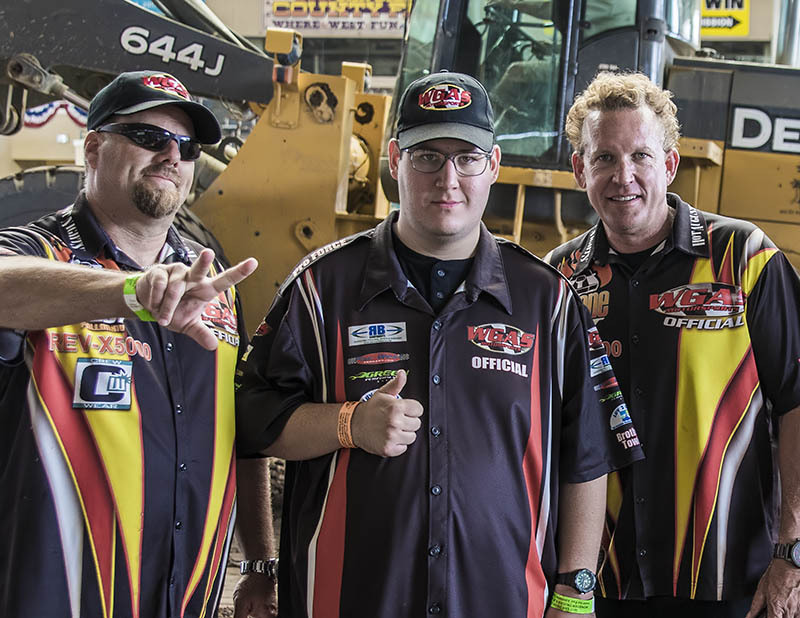 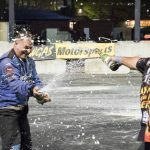 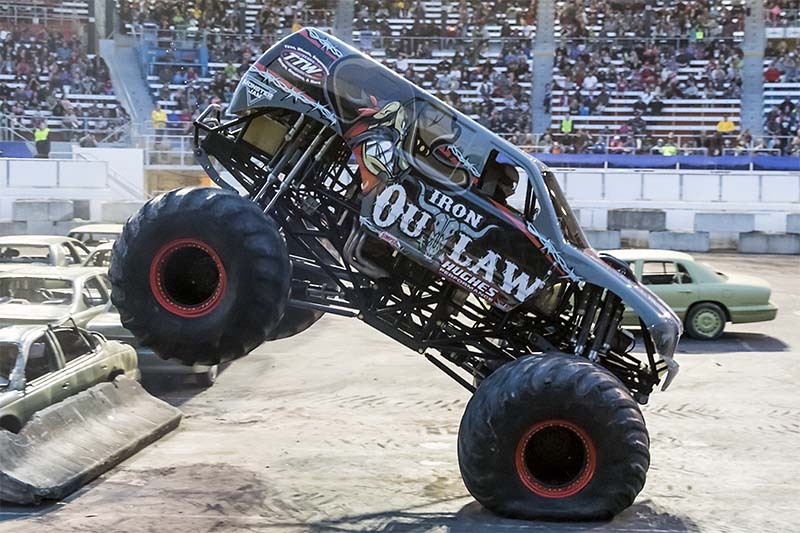 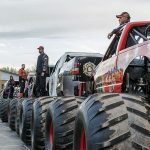 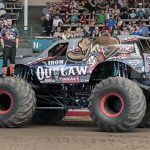 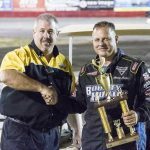 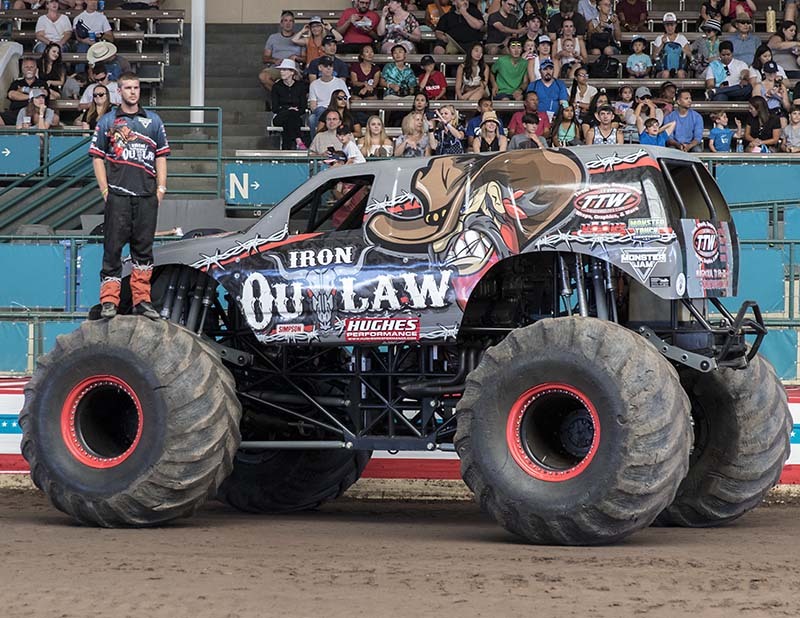 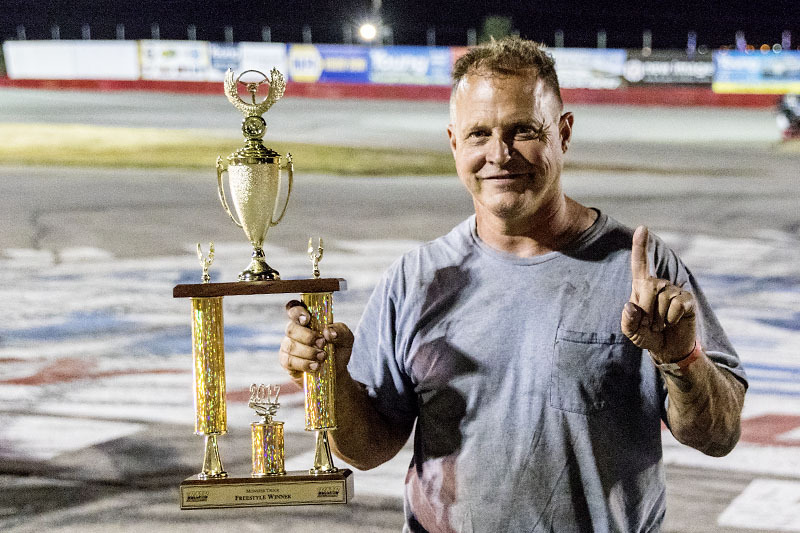 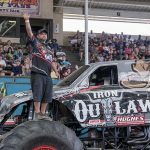 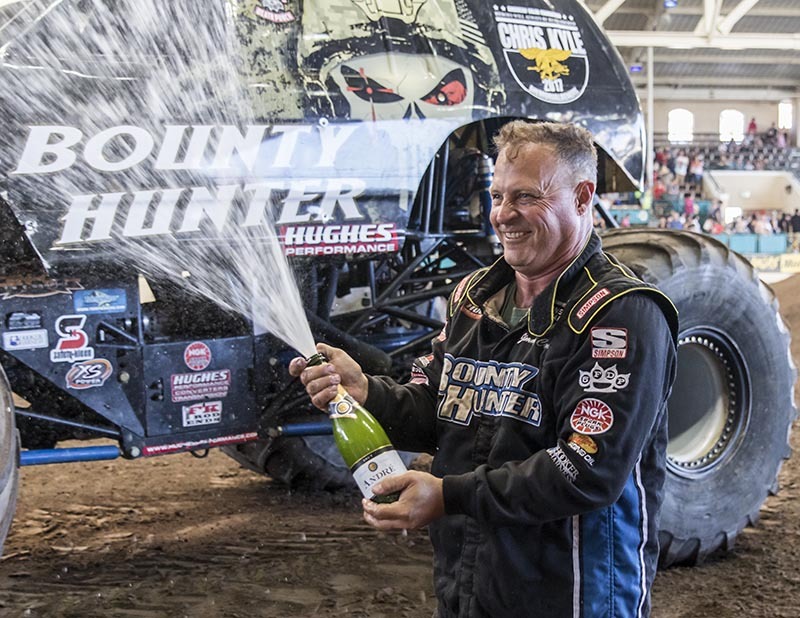 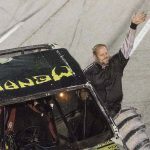 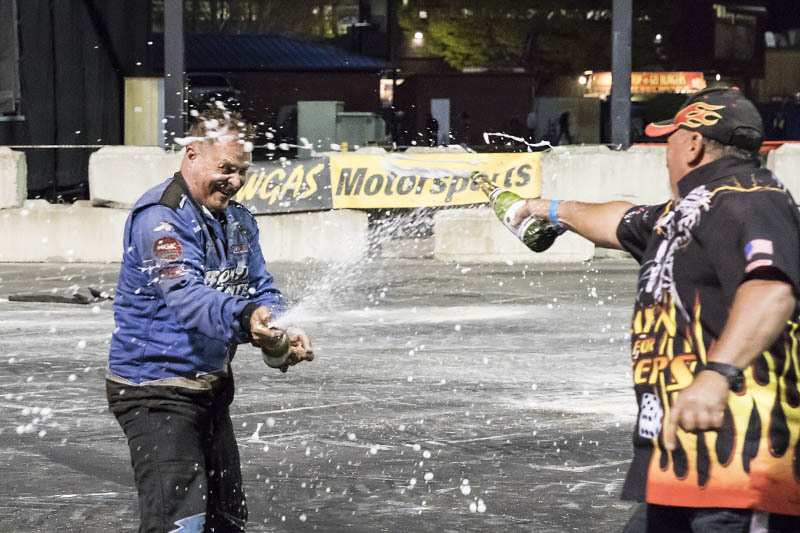 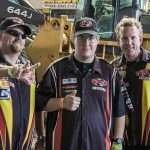 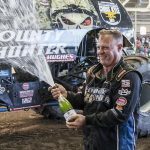 Popular hometown driver Russell Steeley stepped up to drive team truck Iron Outlaw for the final time so he could give his pulling truck his sole attention in the near future. 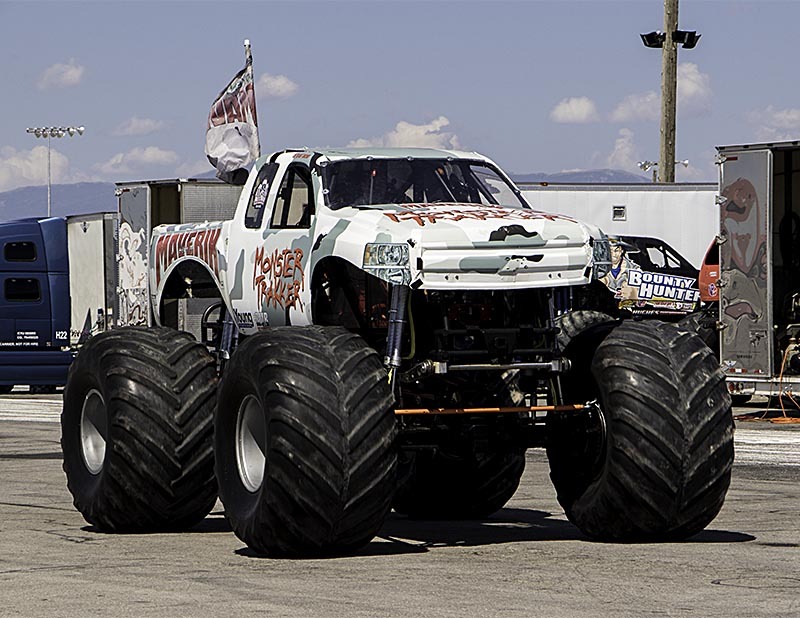 From just down the road in Menifee, California, were the father/son duo of Rick and Eric Swanson. 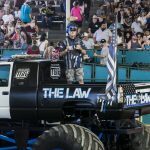 Former Monster Jam Young Guns Shootout competitor Eric was behind the wheel of his pickup bodied Obsessed and Rick continued his 20th anniversary of professional monster trucking in his breathtaking Obsession, complete with a film strip featuring just a fraction of his numerous TV and commercial appearances running down either side. 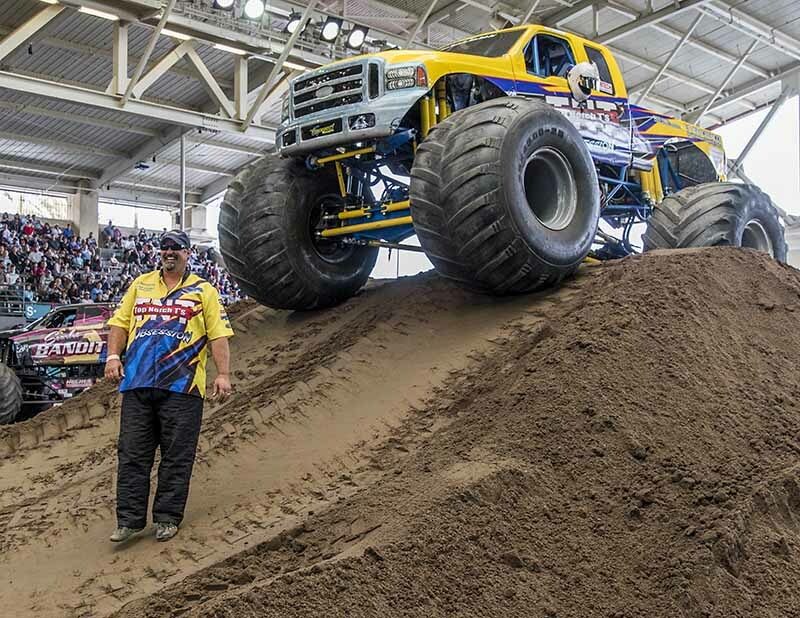 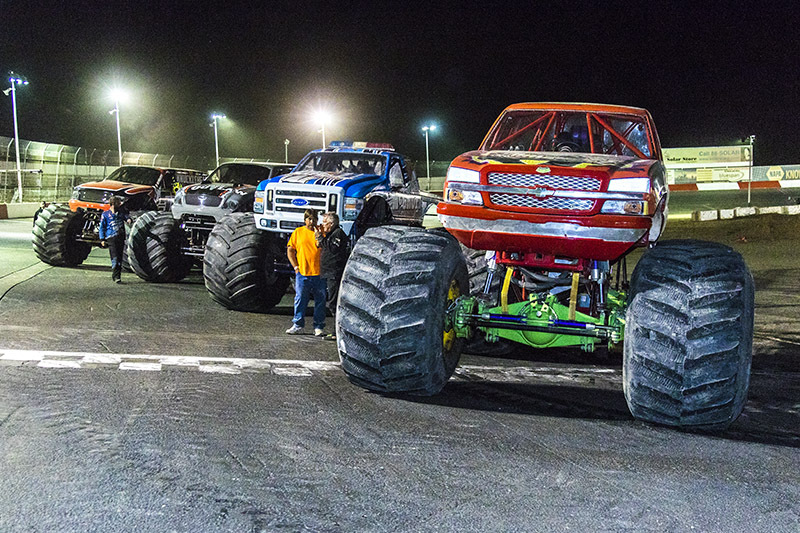 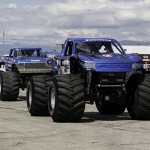 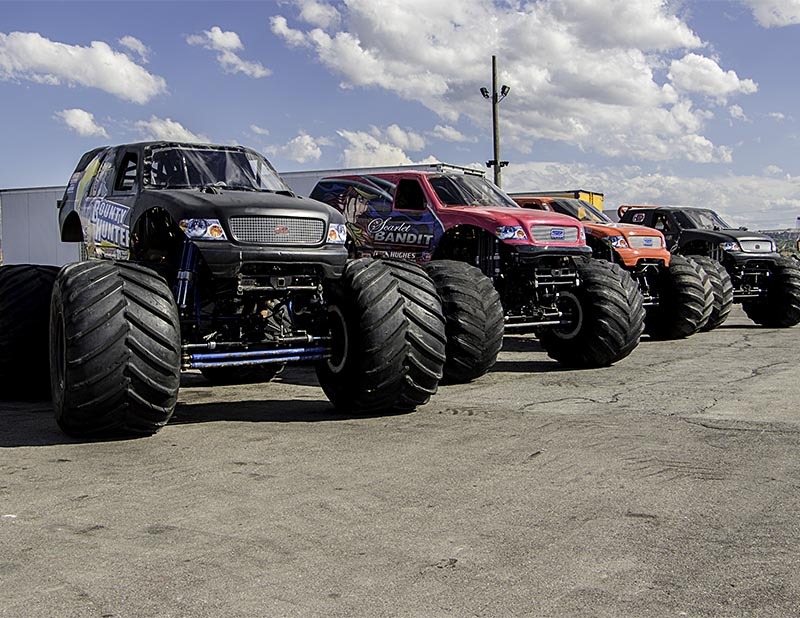 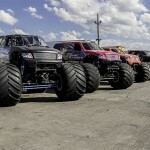 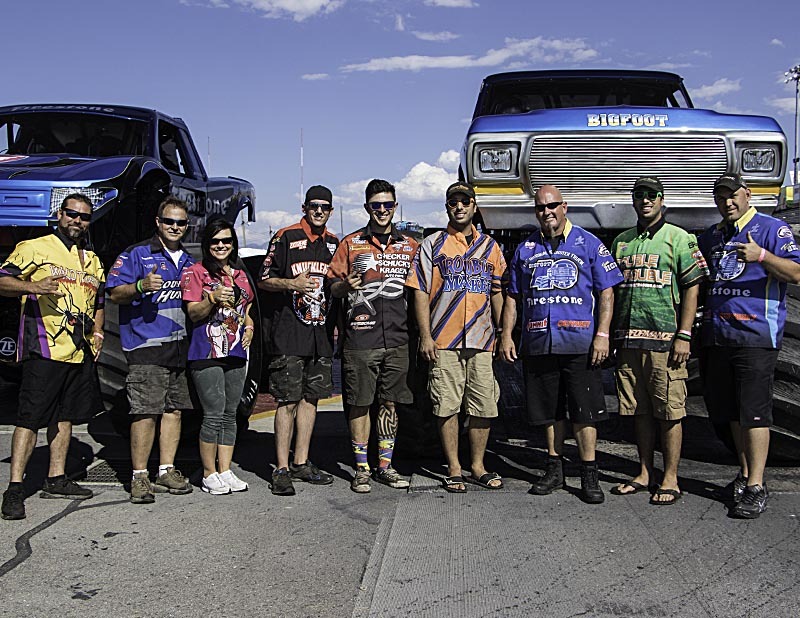 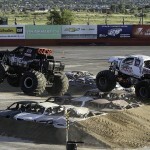 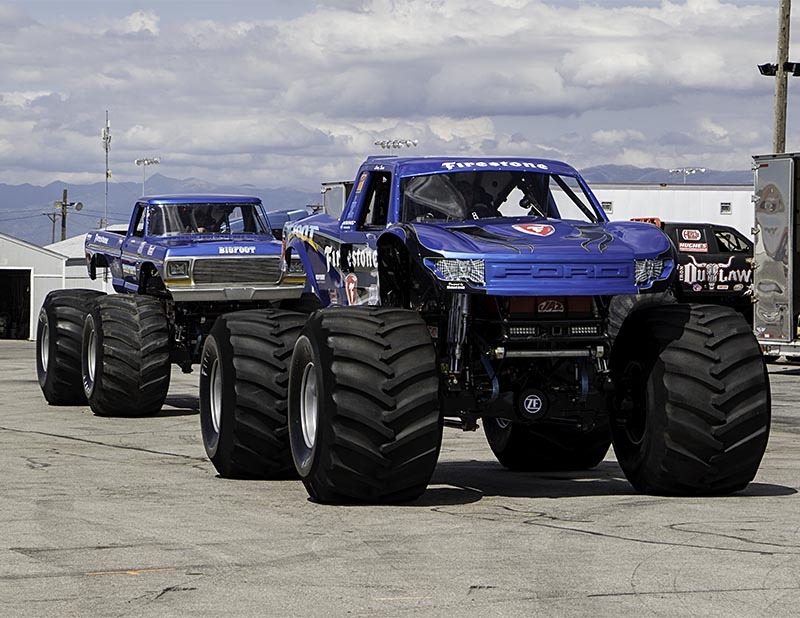 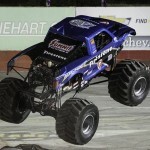 Rounding out the field was Tony Canedo, who brought all three of his trucks, ready to give a good show to the crowd. 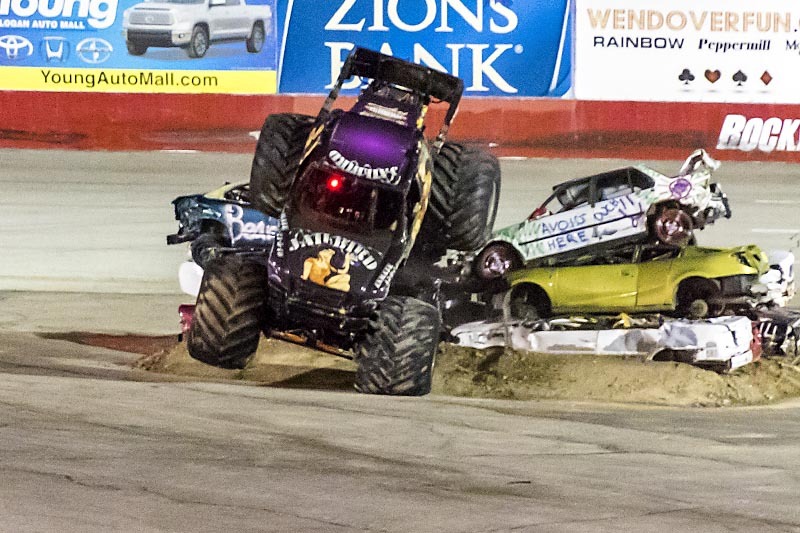 David Tucker would take the wheel of Survivor and Jeff Souza would pilot Enforcer while Tony himself stuck to his usual Play ‘N for Keeps. 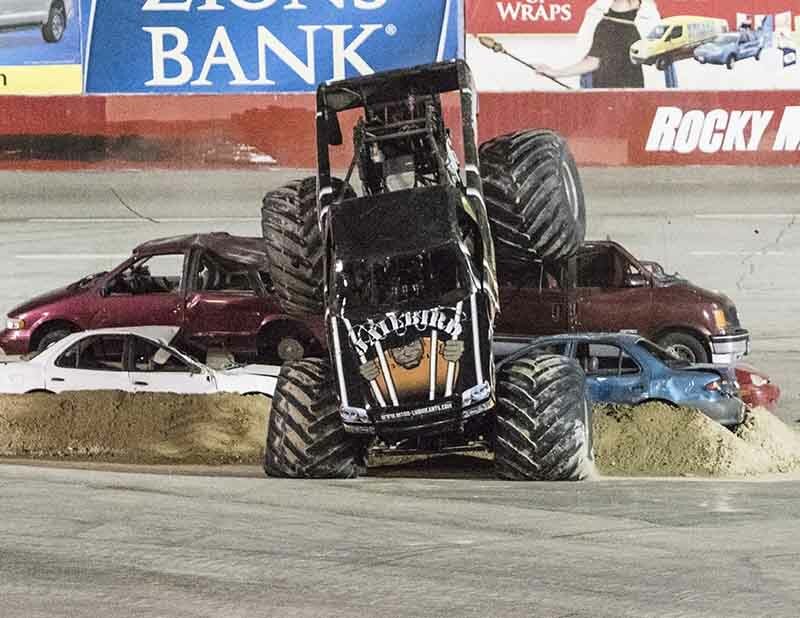 With two buses to crush, a van stack at the arena entry, two great spaces for getting into the spin cycle and several tuff truck jumps to get the monsters off the ground, there was no room for error and every freestyle point would count. 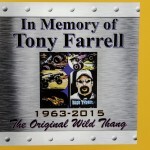 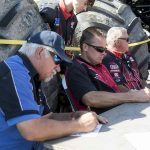 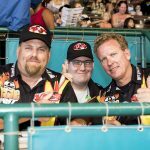 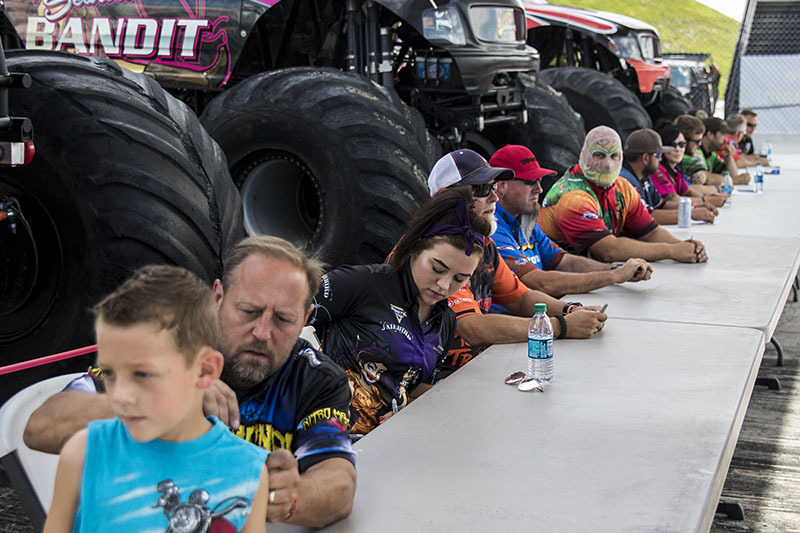 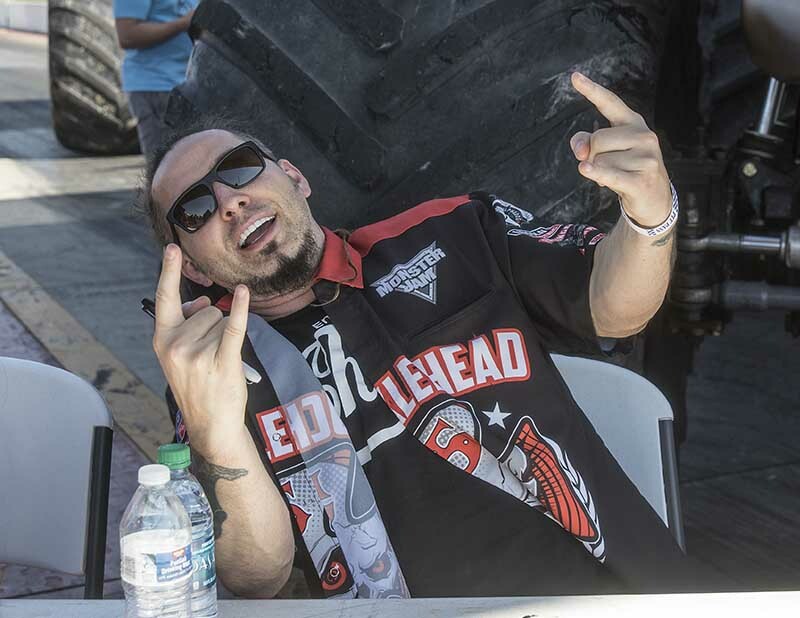 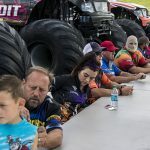 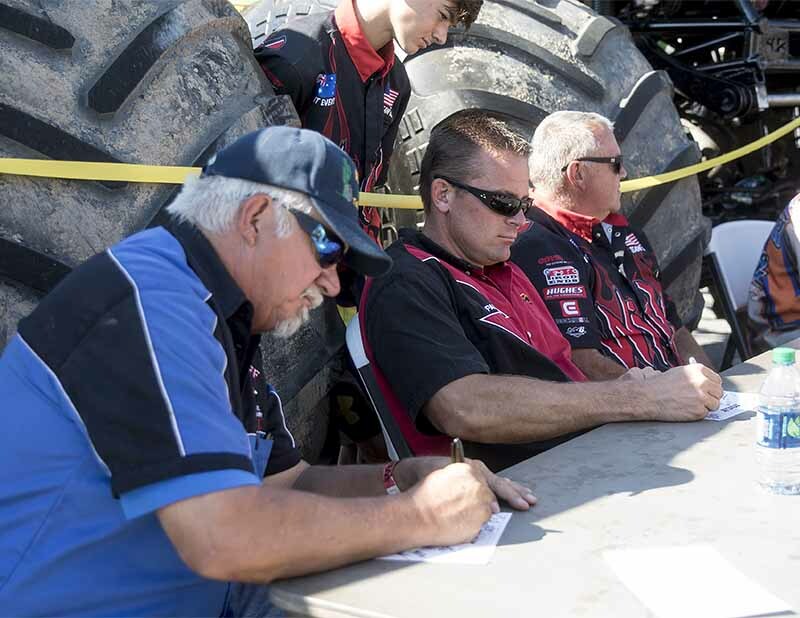 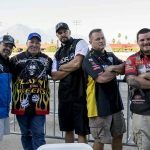 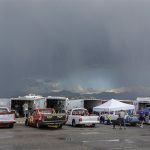 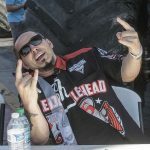 As the huge crowd filed in for the pre-show autograph session and the show on Friday night, the drivers could feel the pressure. 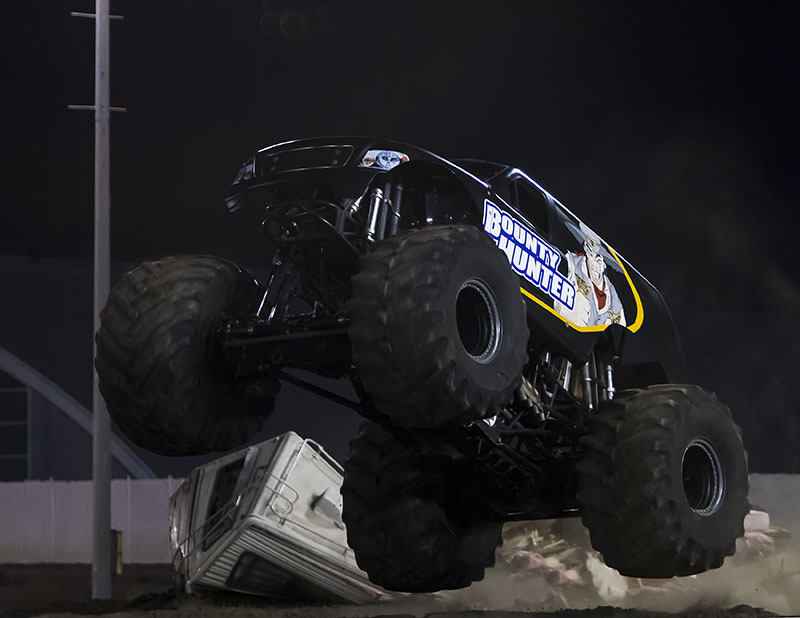 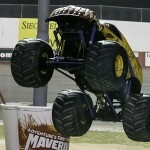 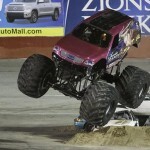 First truck out was Jeff Souza and Enforcer who immediately got huge air over the bus stack. 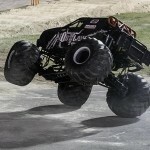 Obsession with Rick Swanson at the wheel came out next, got good air and great donuts. 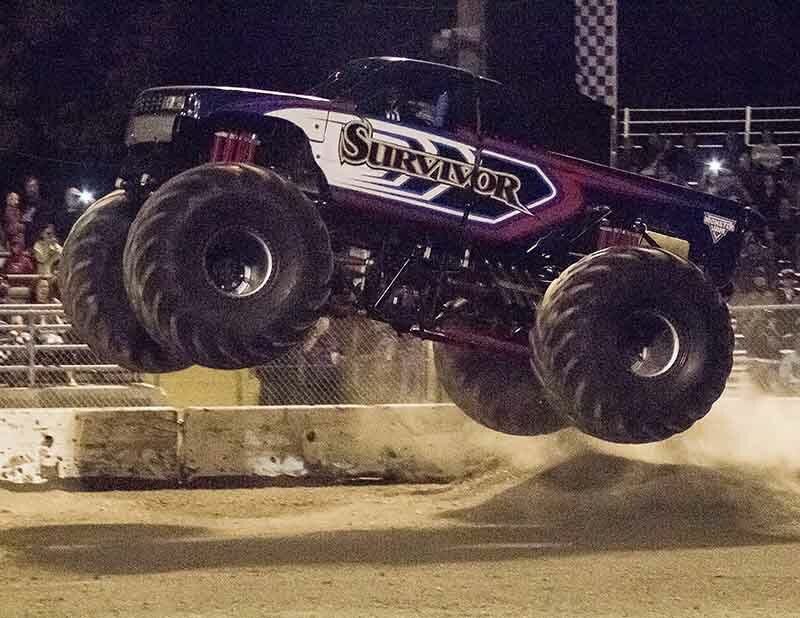 The third truck in the order was Survivor, and the iconic Pacific Northwest name under new ownership put together a great run, clearing the tuff truck jumps and doing a nosedive over the bus that saw driver David Tucker just barely bring it back down onto all fours. 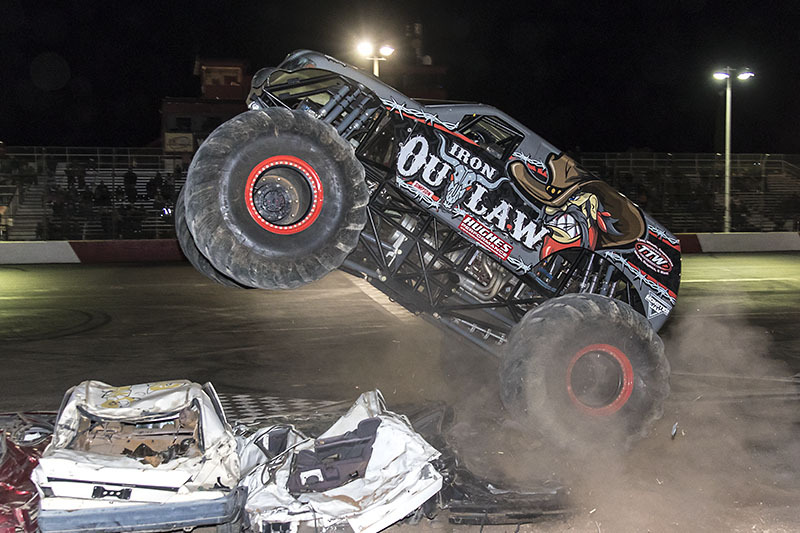 Next in line was Iron Outlaw, who cleared the entire bus stack completely, kept the speed up the whole run and did some lightning fast cyclones as Russ Steeley finished up his second to last ever run in a monster truck. 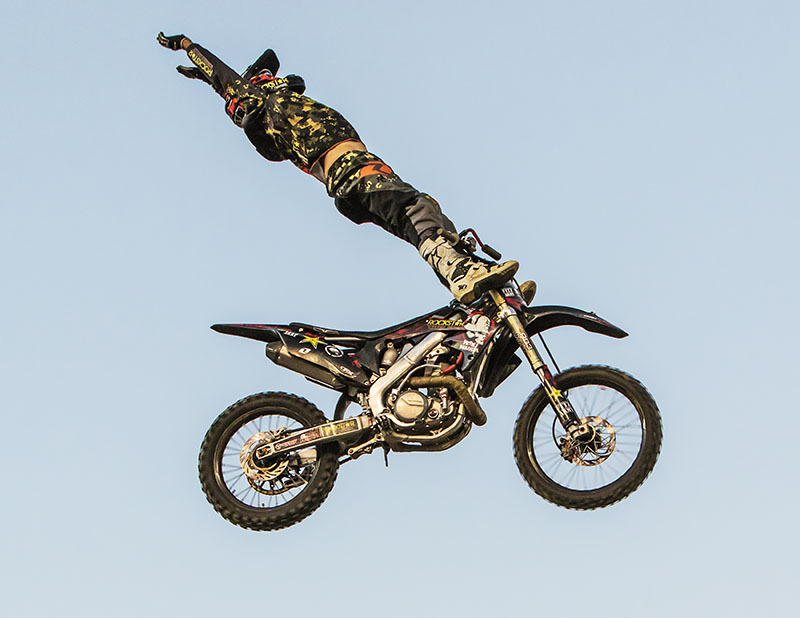 His effort rewarded him with a score of 86 with 100 being perfection. 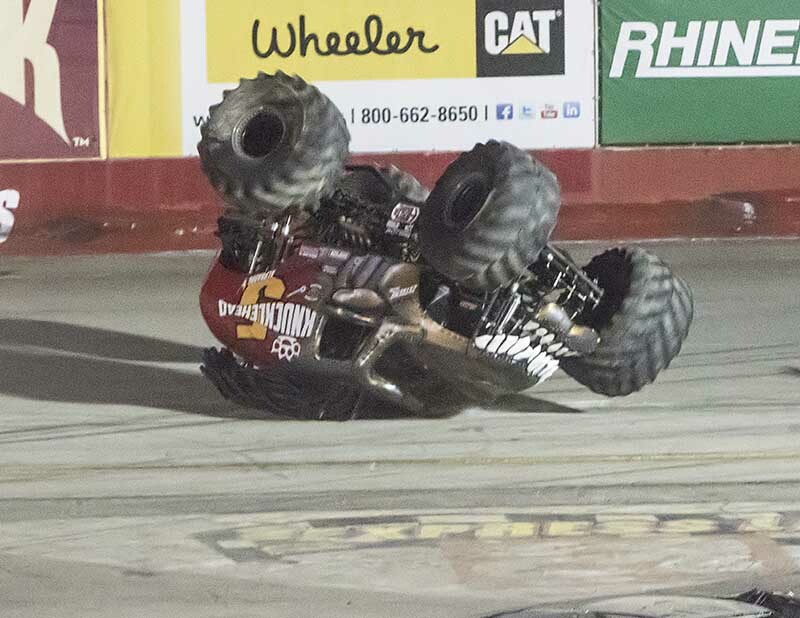 Truck after truck came after him but it wasn’t until the last truck in line and former World Champion hit the floor. 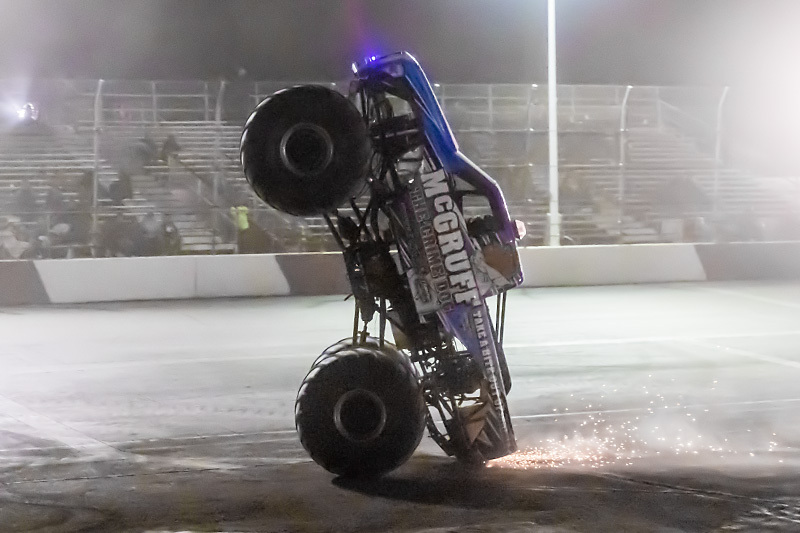 Jimmy Creten matched Russell jump for jump, but carried several great wheelies across the fairgrounds floor to take the lead and the Friday night victory. 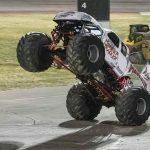 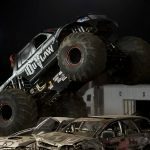 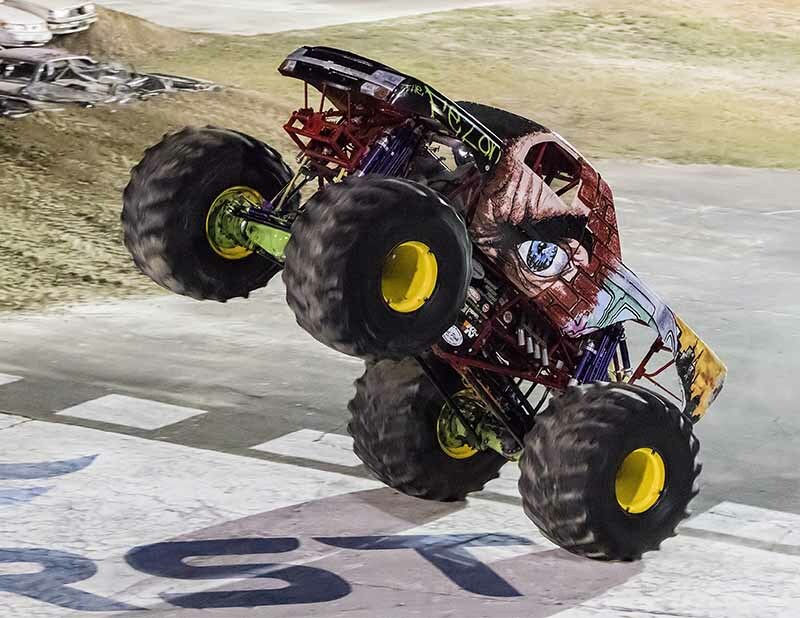 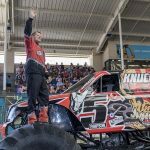 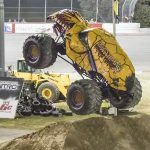 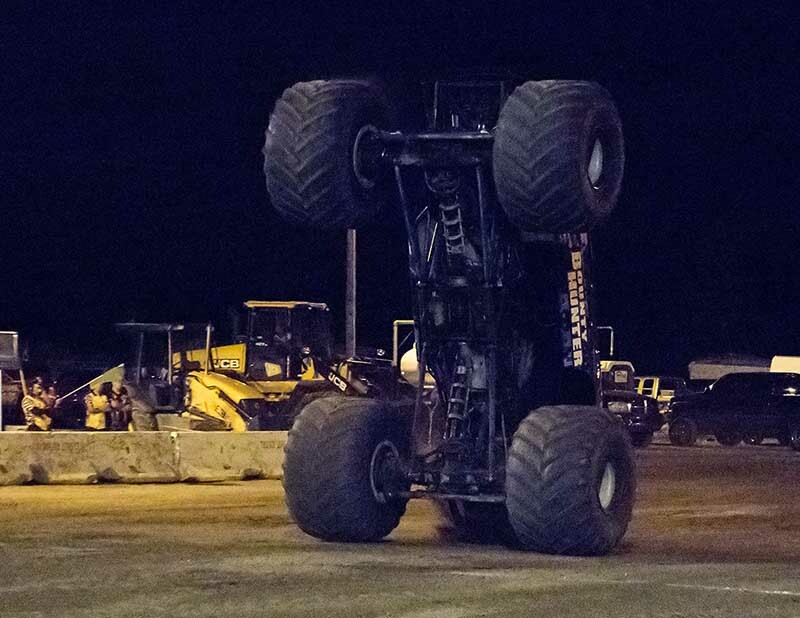 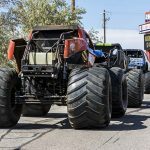 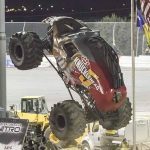 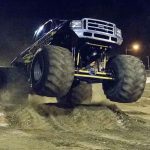 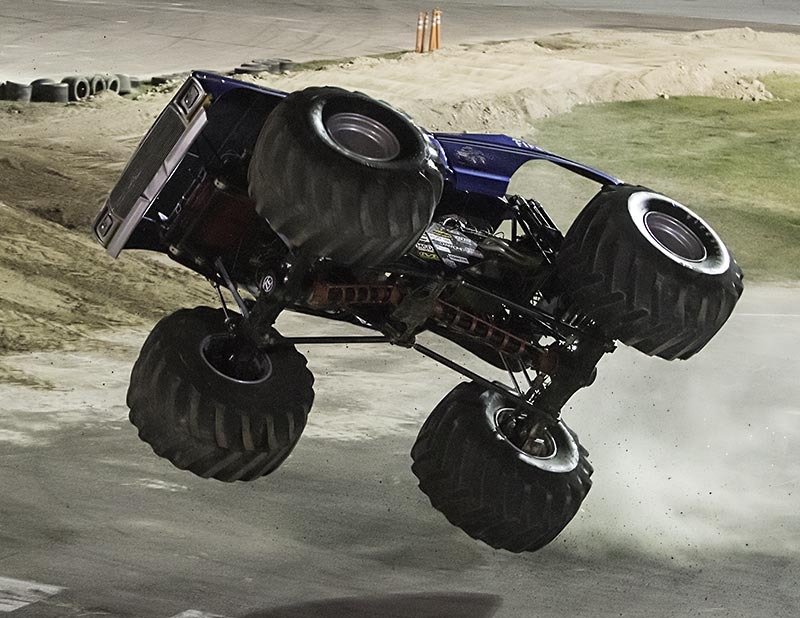 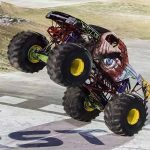 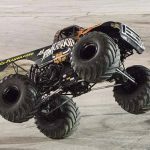 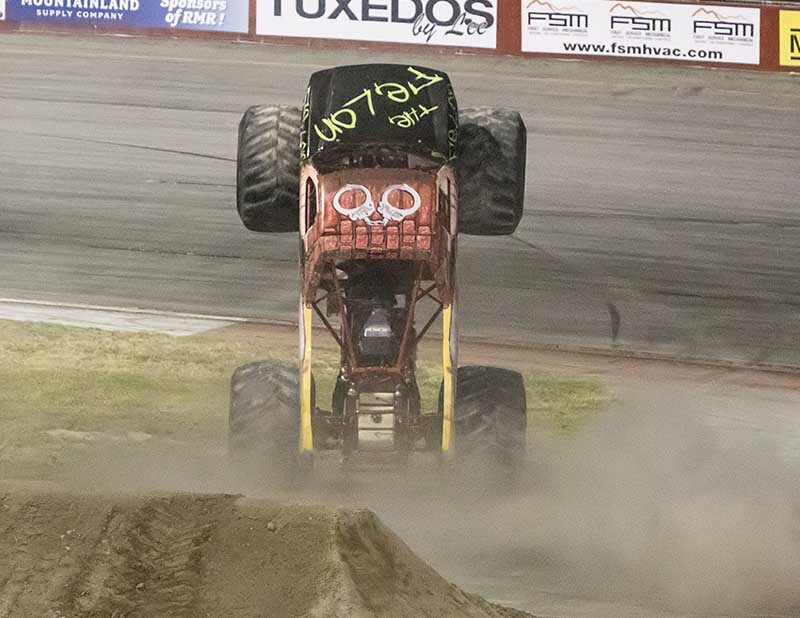 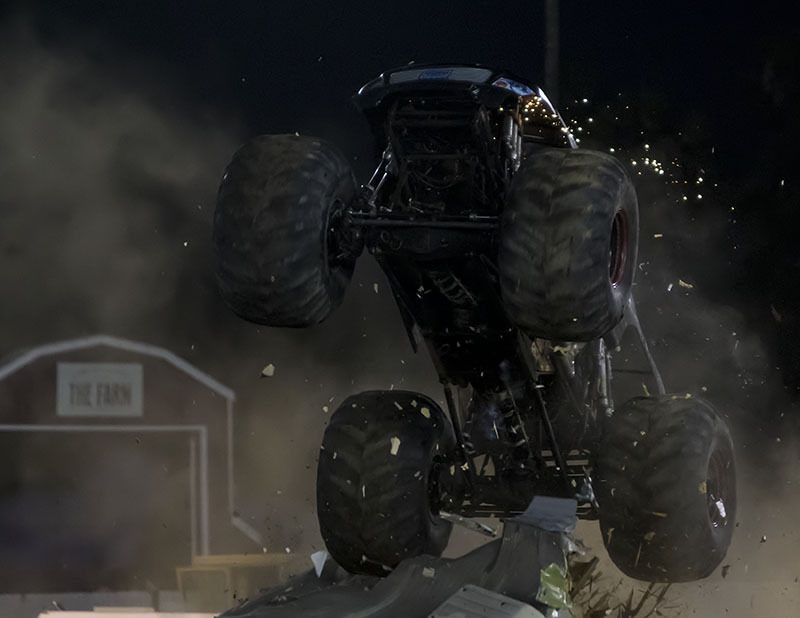 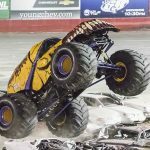 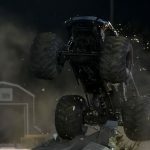 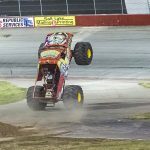 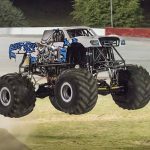 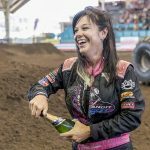 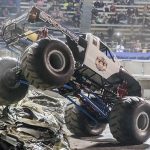 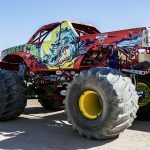 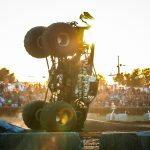 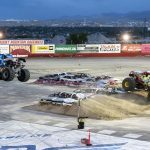 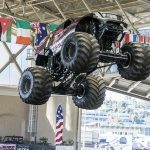 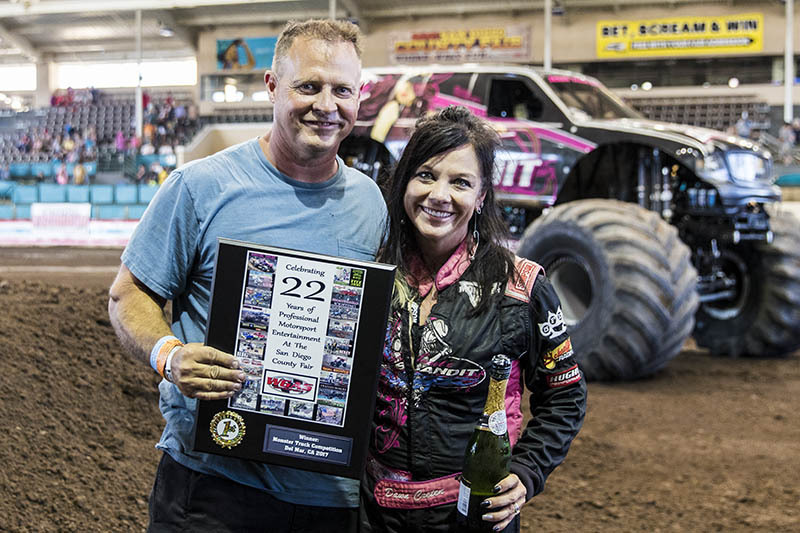 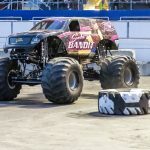 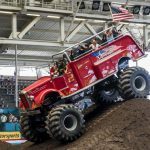 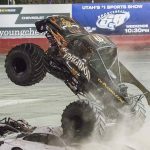 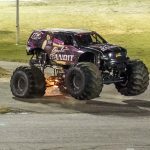 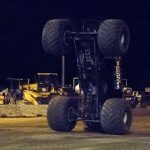 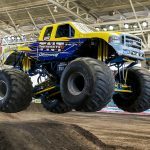 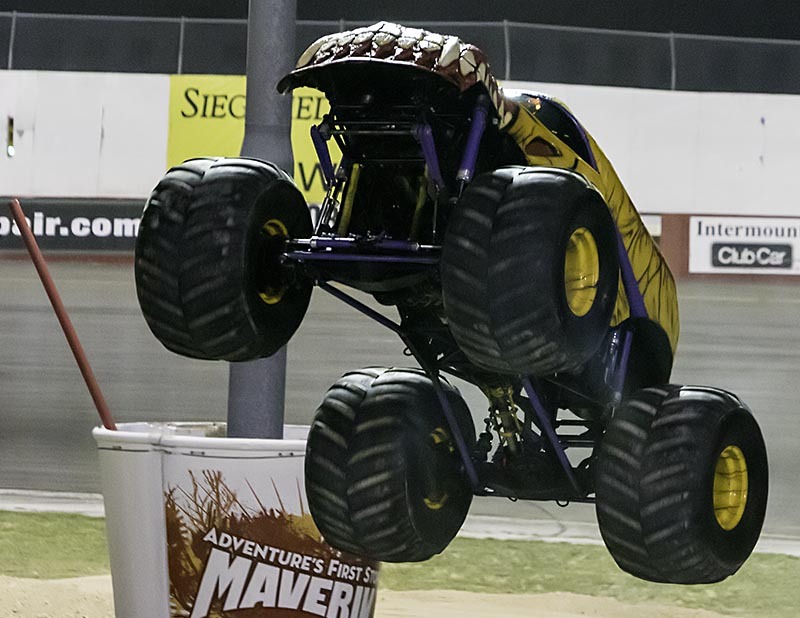 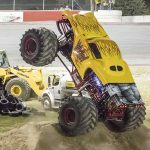 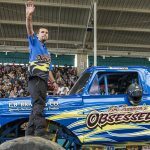 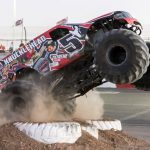 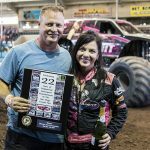 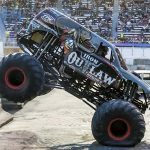 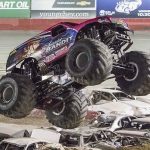 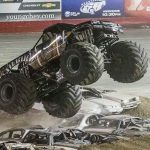 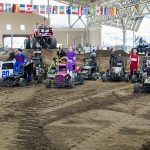 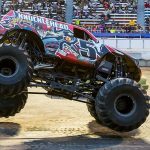 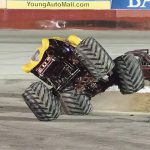 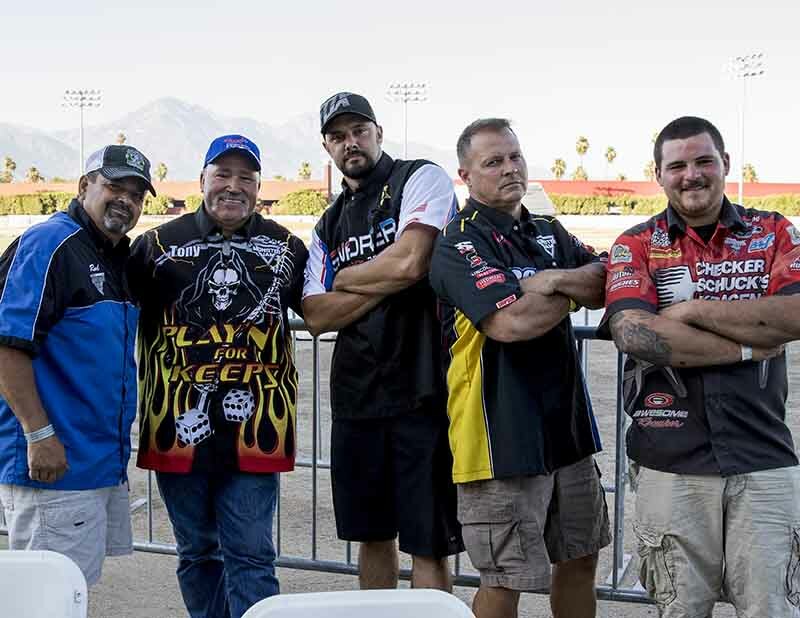 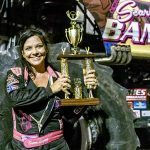 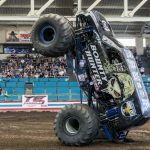 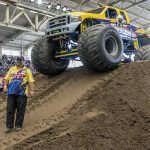 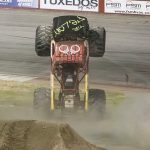 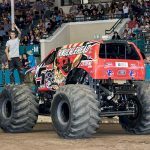 The second and final night of monster truck competition saw a big crowd and bigger efforts by every monster pilot in the field. 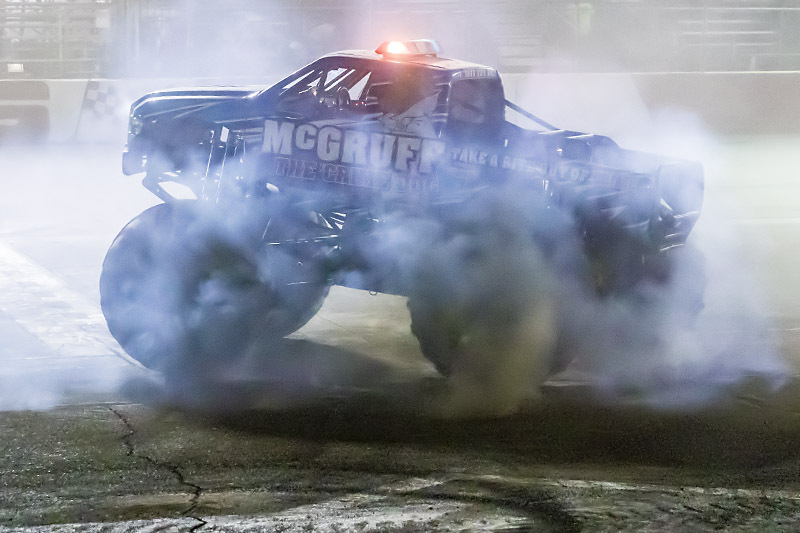 However, the end of the night came a little too soon for the first truck out Enforcer. 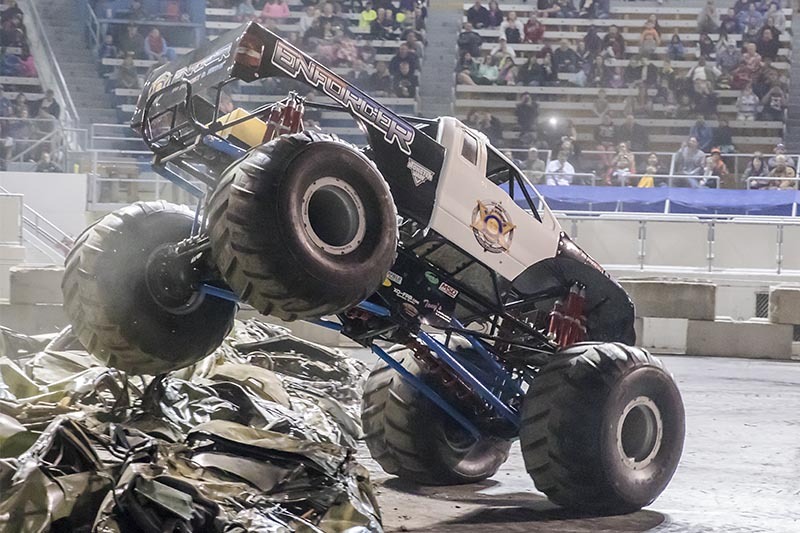 Coming down from the van stack awkwardly, the 1990s West Coast monster legend in its new form blew the left front tire. 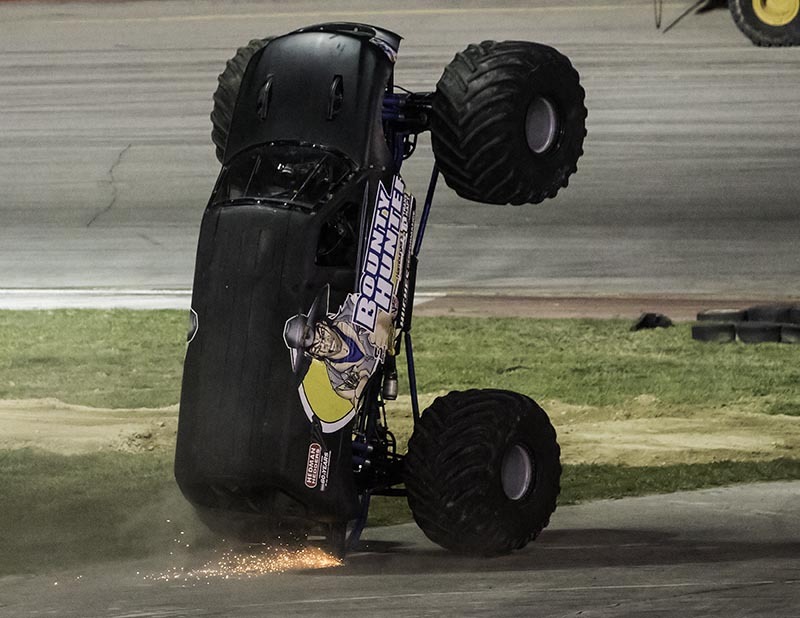 Jeff Souza wasn’t hurt, however, and that was the closest to a major incident the whole night. 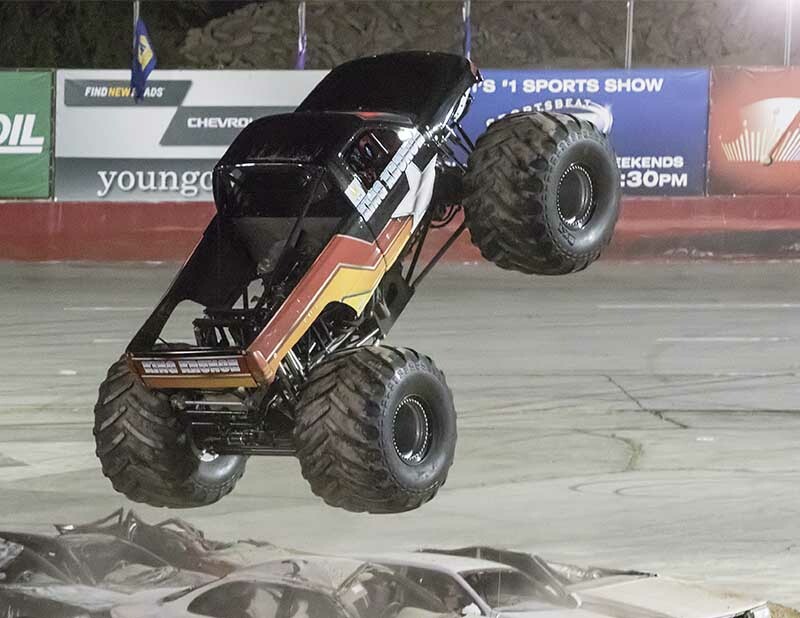 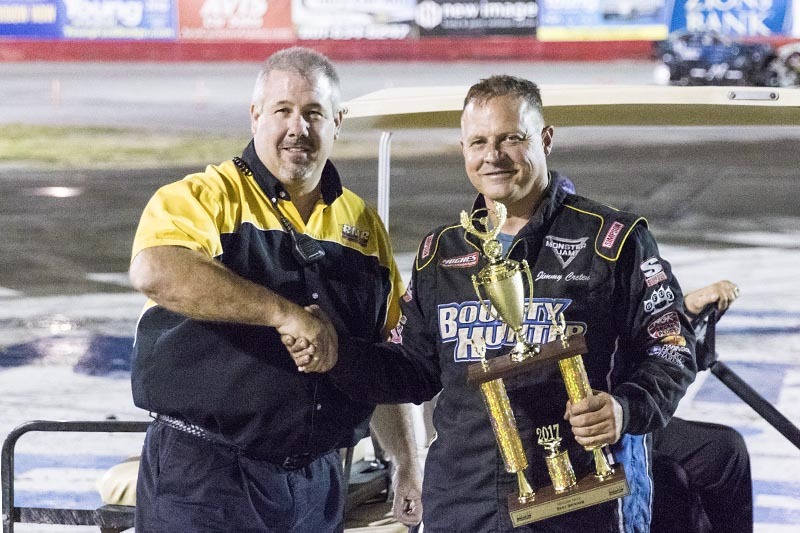 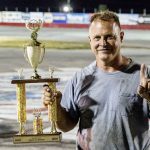 In his last ever appearance behind the wheel of a monster vehicle, hometown hitter Russell Steeley gave huge air over the bus, and an admirable wheelie attempt to put him back in the lead with the championship in sight. 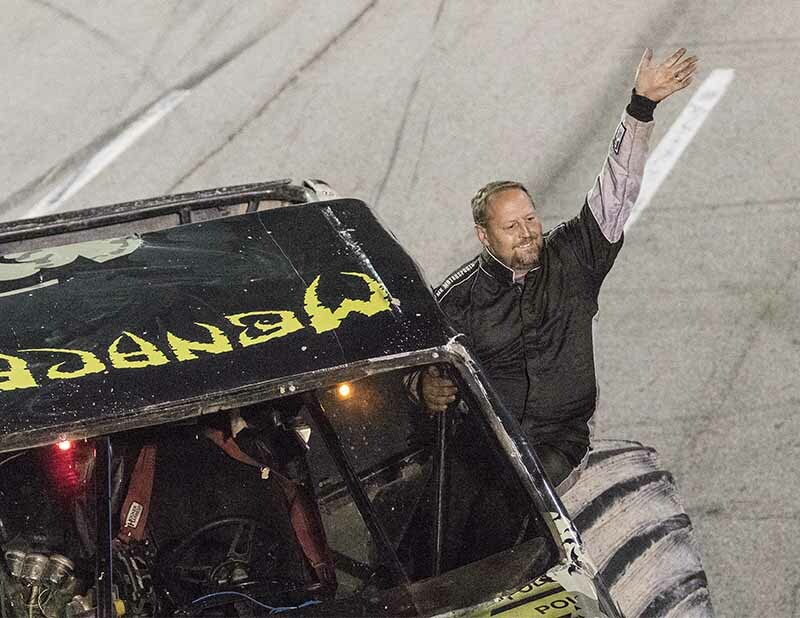 The young rising star Eric Swanson pushed his machine to its limit, clearing the bus stack both ways and turning in his family’s usual great donuts to get the crowd screaming. 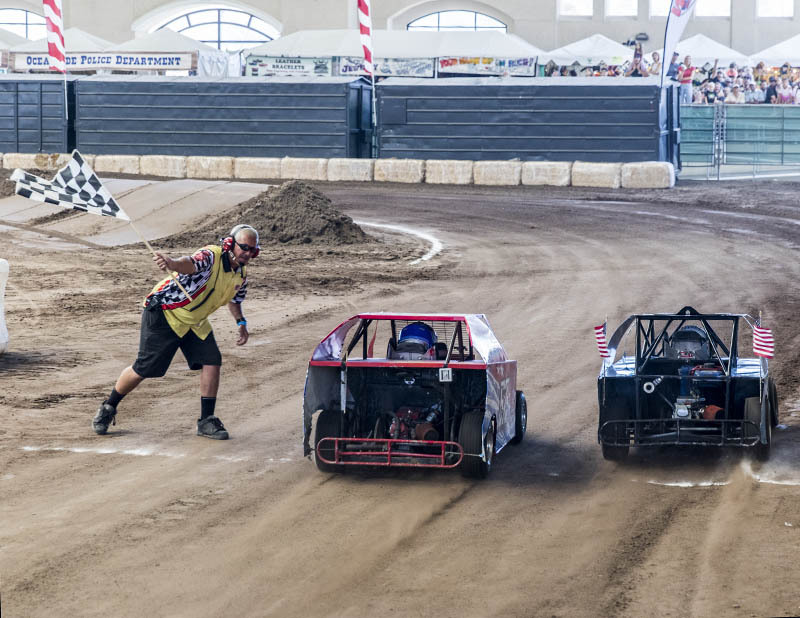 Last out was the only driver who could earn back to back titles. 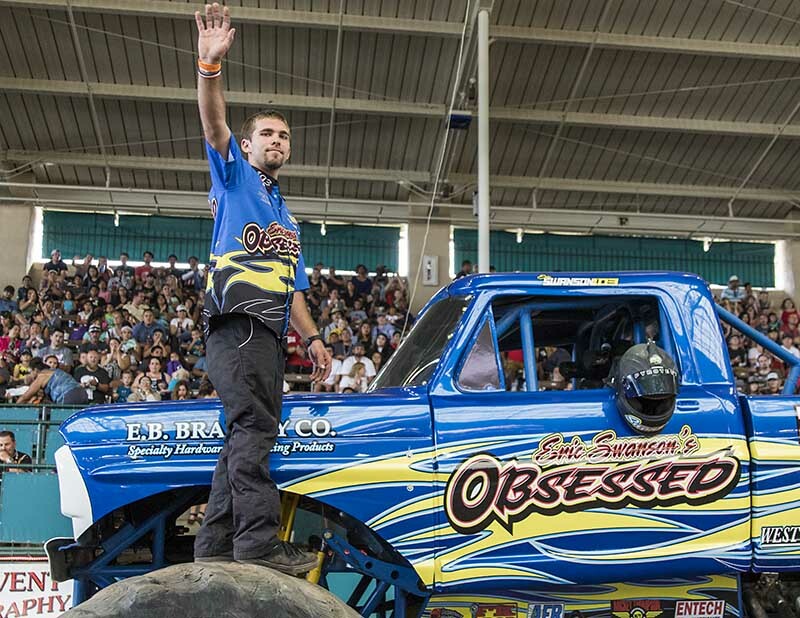 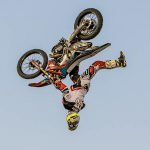 Jimmy Creten gave everything the fans wanted; big air, wheelies and donuts. 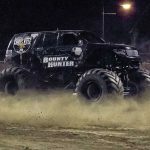 It was not an unrewarded attempt either as the second perfect score in as many nights garnered Bounty Hunter the double victory. 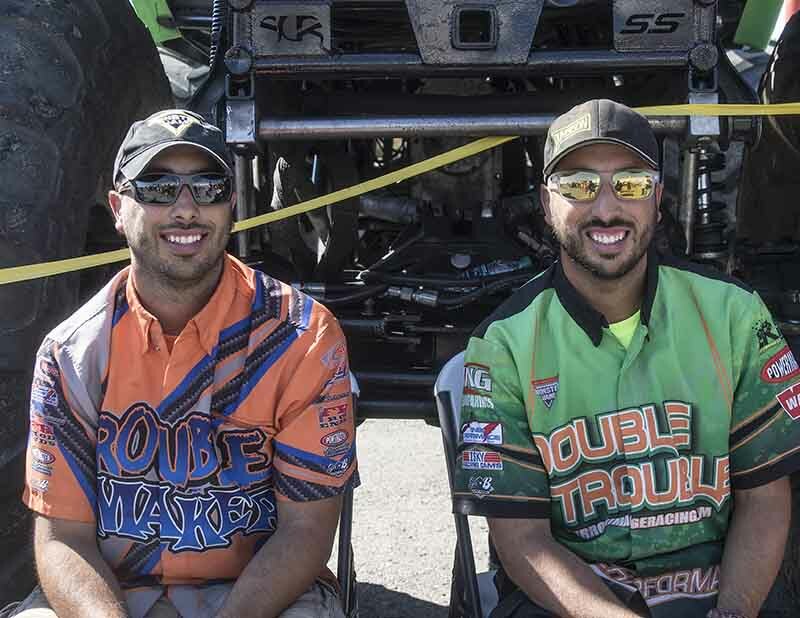 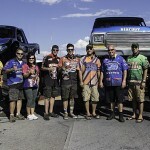 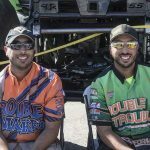 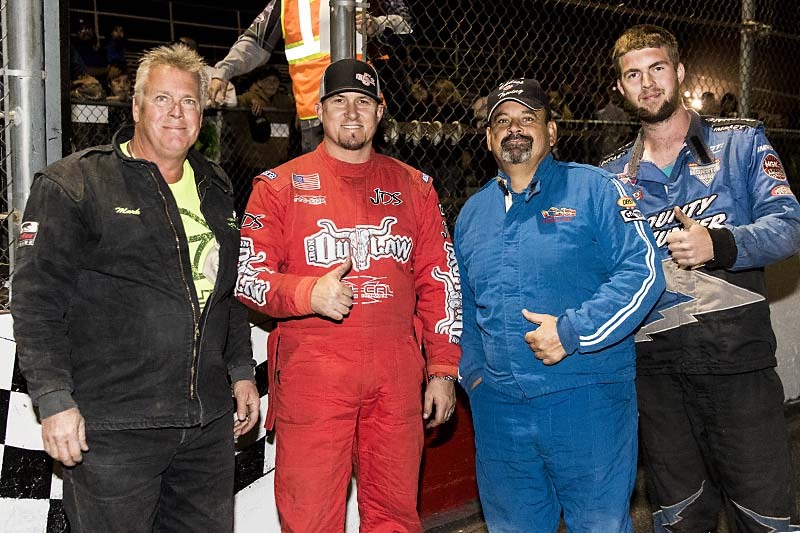 Both the 2Xtreme drivers were interviewed for the crowd and were thankful to the fans for showing up to support them. 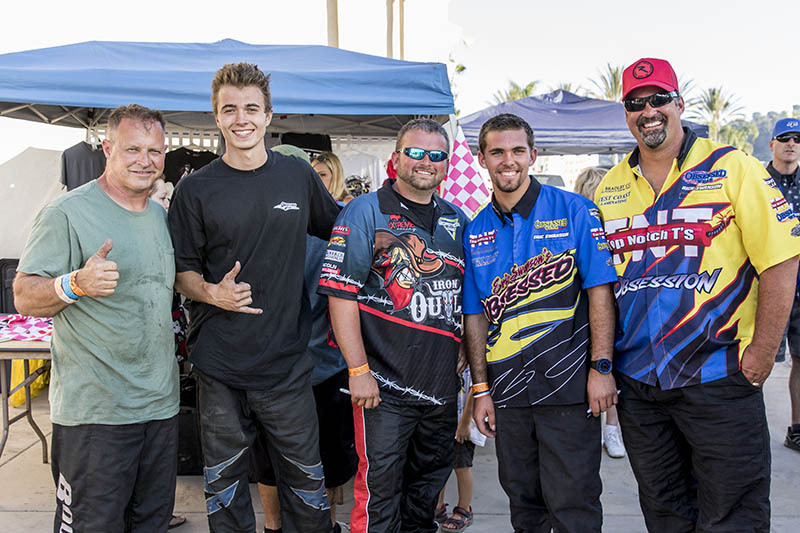 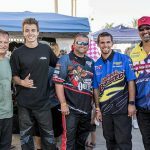 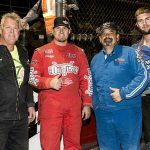 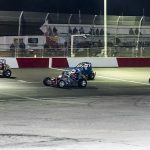 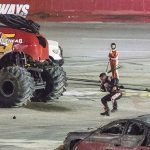 In other race action, Jeff Souza’s son Hunter, Lee Plato’s son Shane and Corbin Shockey practiced for the big leagues with the Wrecking Machine, Skull Krusher and Monster Buddy mini monsters, respectively. 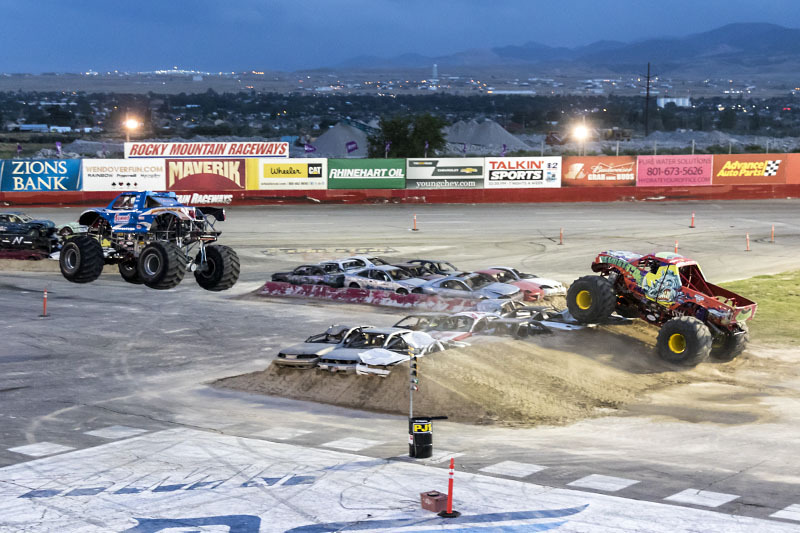 Also there was one at a time, vehicle against timed tuff truck racing which saw the crowd cheering the reckless drivers and booing the cautious ones. 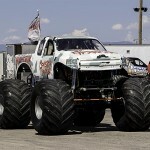 One of the tuff truck participants was former Mike Welch Motorsports driver Sammy Baca out of Modesto, CA. 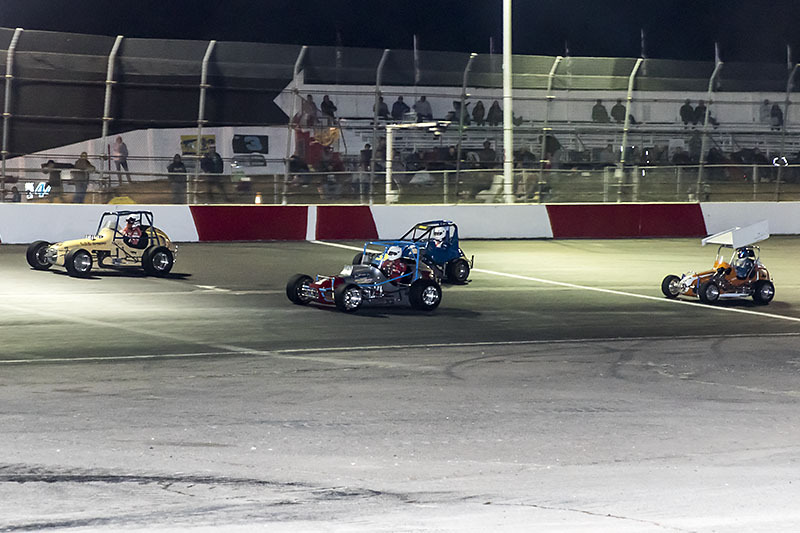 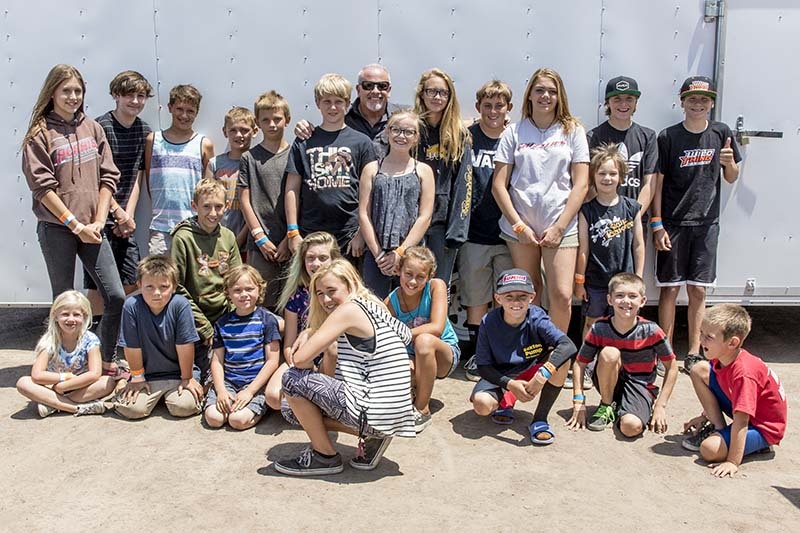 Finally, the future of racing was on full display as kids drove Junior Outlaw Sprint and Mini Dwarf racecars on a tight oval around the bus stack with very little room to overtake. 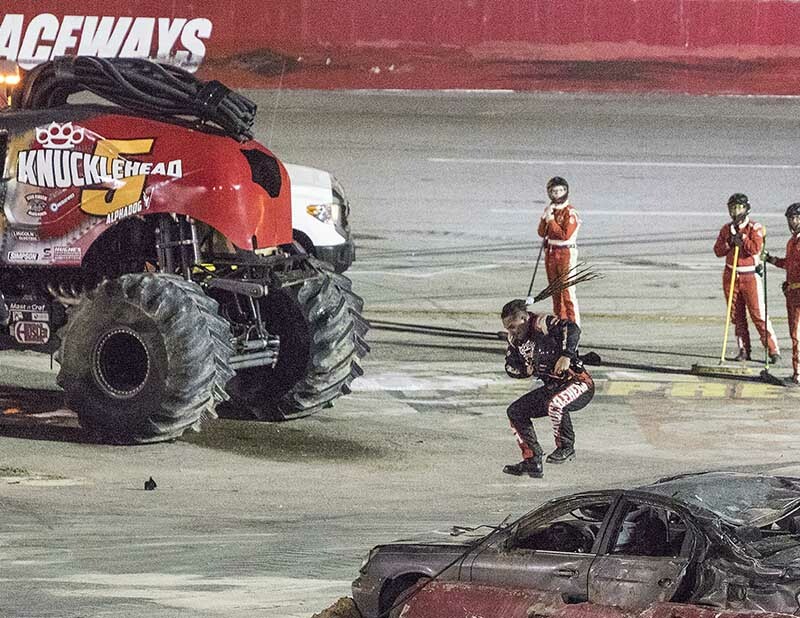 This made the racing exciting for all in attendance. 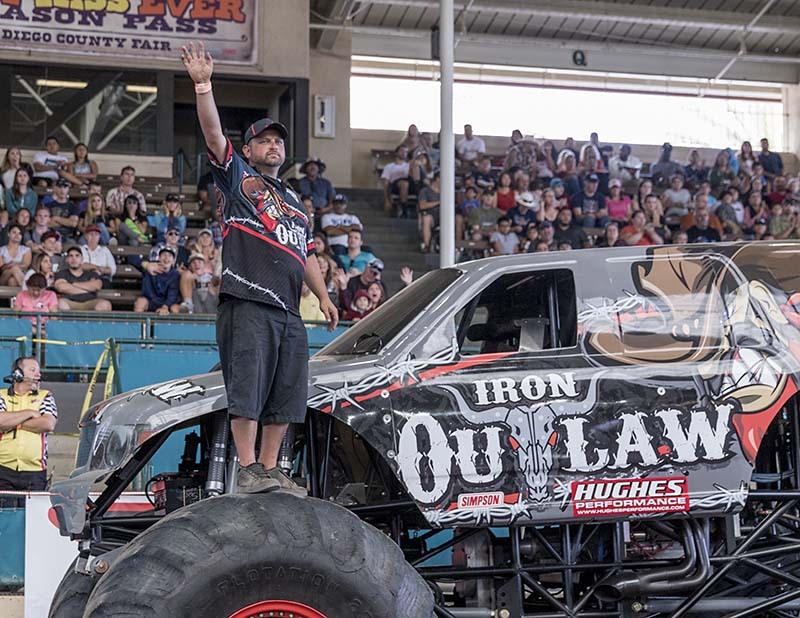 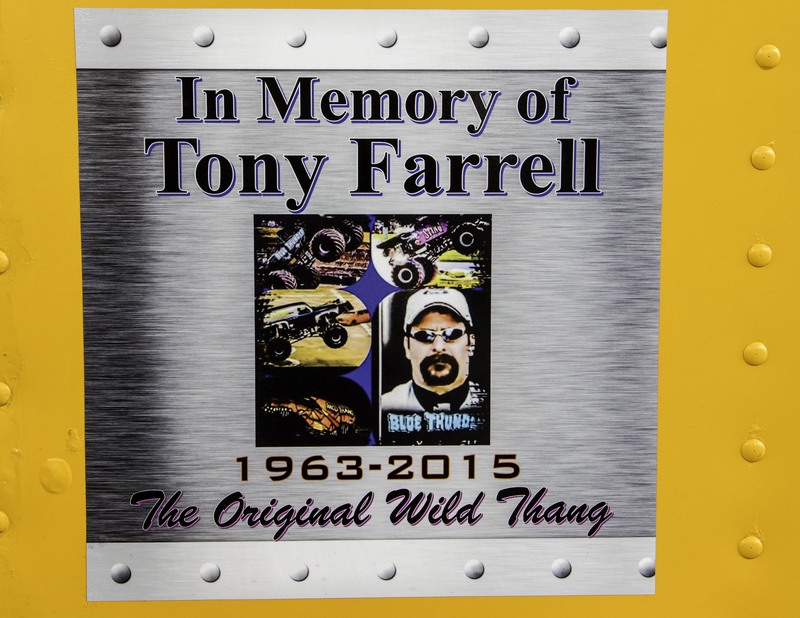 During opening ceremonies for both shows, a moment of silence was held for longtime WGAS announcer Lloyd Massey who tragically passed away just days before the Monster Jam World Finals this year. 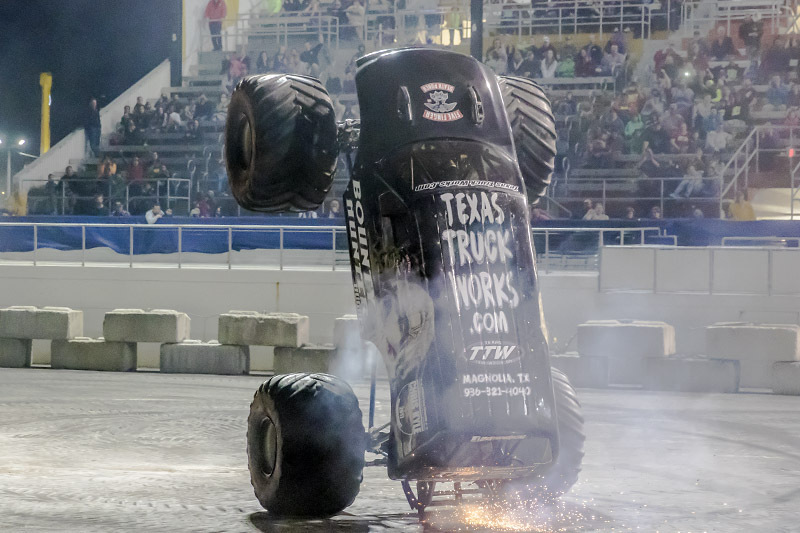 Okay, now we at “The Allen Report” look to make a return to Longview, Washington, to support Mike Welch Freaks of Freestyle and we do so hoping for better weather this time. 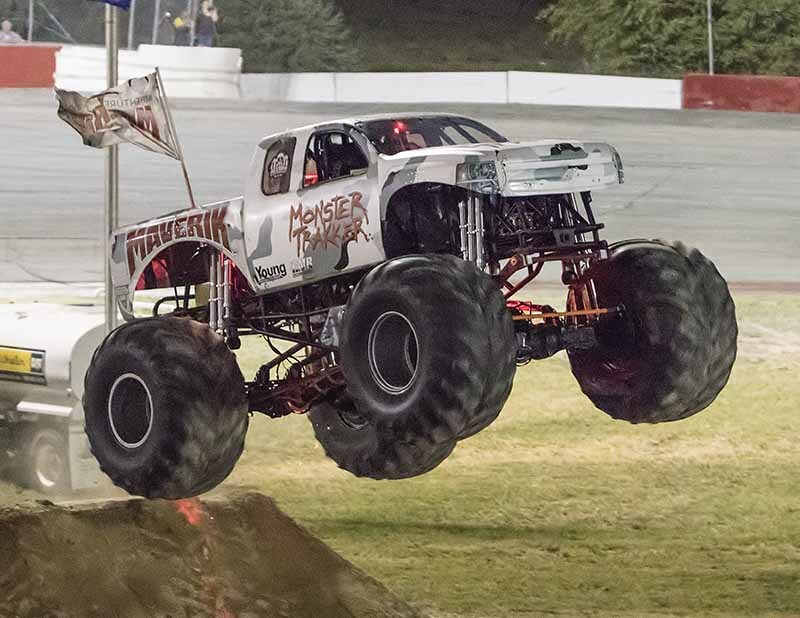 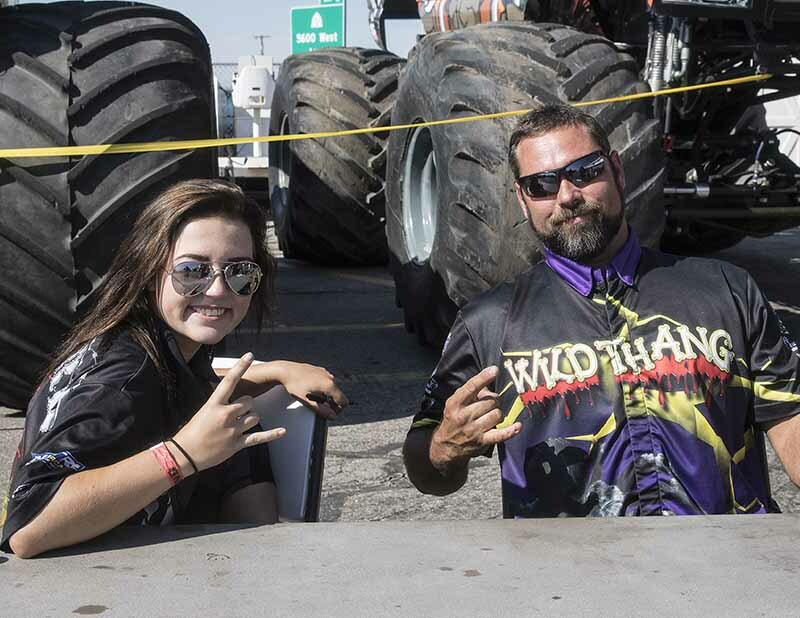 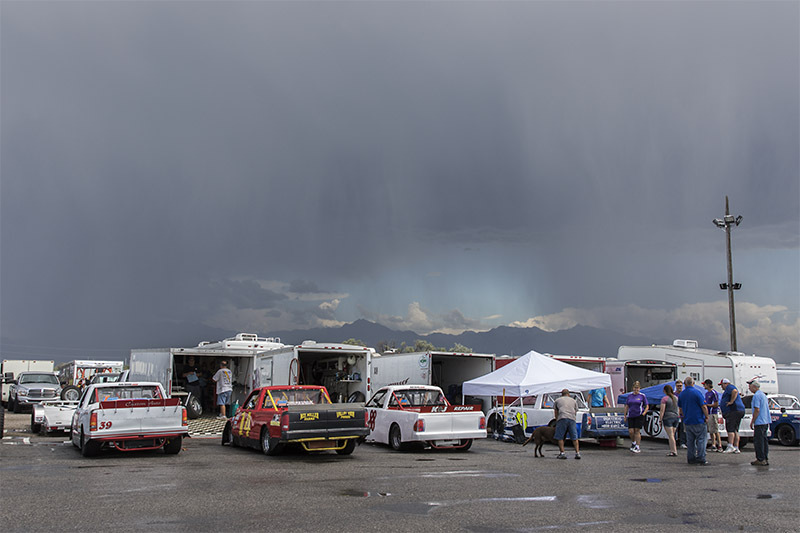 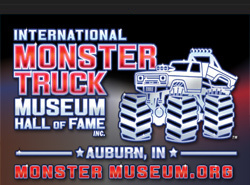 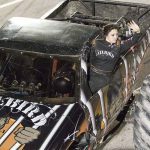 In the meantime, thank you for reading, a special thank you to Chelsea Kessler and the entire WGAS crew for having us, enjoy the photos, don’t forget to follow us in real time under the name “Monster Truckin’ with Jim and Chris” on Facebook and Instagram, and cheer on!